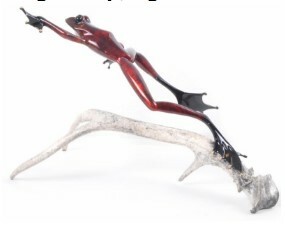 5" X 9" X 6"
The Frogman | Ace II | Limited Edition Bronze Sculpture with Patina Finish,Edition of 2000 | 5" X 9" X 6"
The Frogman | Aurora | Limited Edition Bronze Sculpture with Patina Finish, Edition of 5000 | 4" X 3" X 0.75"
4" X 2.5" X 3.75"
The Frogman | Beginner's Luck | Limited Edition Bronze Sculpture with Patina Finish, Edition of 1000 | 4" X 2.5" X 3.75"
13.5" X 7.5" X 10.75"
The Frogman | Belle Fleur | Limited Edition Bronze Sculpture with Patina Finish, Edition of 350 | 13.5" X 7.5" X 10.75"
11" X 7.25" X 4.75"
The Frogman | Big Blue | Limited Edition Bronze Sculpture with Patina Finish, Edition of 2000 | 11" X 7.25" X 4.75"
The Frogman | Big Kahuna | Limited Edition Bronze Sculpture with Patina Finish, Edition of 750 | 22" X 16" X 8"
8.5" X 17" X 4"
The Frogman | Blue Bayou | Limited Edition Bronze Sculpture with Patina Finish,Edition of 2000 | 8.5" X 17" X 4"
The Frogman | Bue Bird | Limited Edition Bronze Sculpture with Patina Finish | 0" X 0"
The Frogman | Bugsy | Limited Edition Bronze Sculpture with Patina Finish,Edition of 5000 | 2.5" X 4" X 3.25"
6" X 4.5" X 3"
The Frogman | Buzz | Limited Edition Bronze Sculpture with Patina Finish, Edition of 1000 | 6" X 4.5" X 3"
20.25" X 4.75" X 3.5"
The Frogman | Calla Lilly | Limited Edition Bronze Sculpture with Patina Finish,Edition of 2000 | 20.25" X 4.75" X 3.5"
17" X 4.5" X 7.5"
The Frogman | Caruso | Limited Edition Bronze Sculpture with Patina Finish, Edition of 350 | 17" X 4.5" X 7.5"
2.5" X 5.5" X 8"
The Frogman | Casanova | Limited Edition Bronze Sculpture with Patina Finish, Edition of 1000 | 2.5" X 5.5" X 8"
12.25" X 8.25" X 6.25"
The Frogman | Cattail | Limited Edition Bronze Sculpture with Patina Finish, Edition of 200 | 12.25" X 8.25" X 6.25"
The Frogman | Chai | limited edition bronze sculpture with patina finish, Edition of 1000 | 3.5" X 2.75" X 1.5"
The Frogman | Chase | Limited Edition Bronze Sculpture with Patina Finsh, Edition of 1000 | 3" X 3" X 1"
8" X 5.5" X 3"
The Frogman | Chico | Limited Edition Bronze Sculpture with Patina Finish, Edition of 5000 | 8" X 5.5" X 3"
9.5" X 9.5" X 6"
The Frogman | Churchill | limited edition bronze sculpture with patina finish, Edition of 400 | 9.5" X 9.5" X 6"
13.25" X 11.5" X 7"
The Frogman | Cliff Hanger | Limited Edition Bronze Sculpture with Patina Finish, Edition of 2000 | 13.25" X 11.5" X 7"
4" X 7" X 6"
The Frogman | Clover | Limited Edition Bronze Sculpture with Patina Finish, Edition of 2000 | 4" X 7" X 6"
9.75" X 6" X 11.25"
The Frogman | Cocorico | Limited Edition Bronze Sculpture with Patina Finish, Edition on 350 | 9.75" X 6" X 11.25"
1.5" X 2.75" X 2"
The Frogman | Cosmos | Limited Edition Bronze Sculpture with Patina Finish, Edition of 5000 | 1.5" X 2.75" X 2"
The Frogman | Daffodil | Limited Edition Bronze Sculpture with Patina Finish, Edition of 2000 | 13" X 9" X 10"
16" X 9.5" X 3.75"
The Frogman | Diablo | Limited Edition Bronze Sculpture with Patina Finish, Edition of 5000 | 16" X 9.5" X 3.75"
10.5" X 10" X 9.5"
The Frogman | Digger | Limited Edition Bronze Sculpture with Patina Finish, Edition of 500 | 10.5" X 10" X 9.5"
6.25" X 5" X 3"
The Frogman | Dimples | Limited Edition Bronze Sculpture with Patina Finish,Edition of 5000 | 6.25" X 5" X 3"
15.5" X 8.5" X 6"
The Frogman | Dinner for Two | Limited Edition Bronze Sculpture with Patina Finish,Edition of 2000 | 15.5" X 8.5" X 6"
5.5" X 5" X 3.25"
The Frogman | Easy Rider | Limited Edition Bronze Sculpture with Patina Finish, Edition of 500 | 5.5" X 5" X 3.25"
The Frogman | Emerald | Limited Edition Bronze Sculpture with Patina Finish,Edition of 2000 | 3.25" X 5.5" X 5.5"
The Frogman | Emerald | Limited Edition Bronze Sculpture with Patina Finish | 0" X 0"
9" X 3.75" X 4.5"
The Frogman | Enforcer | Limited Edition Bronze Sculpture with Patina Finish, Edition of 2000 | 9" X 3.75" X 4.5"
6" X 3.25" X 3"
The Frogman | EsCargo | Limited Edition Bronze Sculpture with Patina Finish, Edition of 350 | 6" X 3.25" X 3"
5" X 5.5" X 4.5"
The Frogman | Fat Boy | Limited Edition Bronze Sculpture with Patina Finish,Edition of 5000 | 5" X 5.5" X 4.5"
14" X 18" X 11.75"
The Frogman | Ferguson (Waxed) Outdoor | Limited Edition Bronze Sculpture with Waxed Finish, Total Edition of 100 | 14" X 18" X 11.75"
Larger than life, the ever-so-engaging Ferguson joins the Frogman Pond. 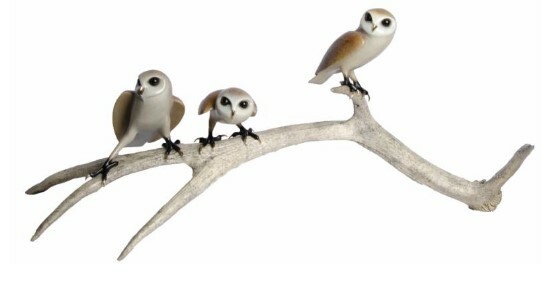 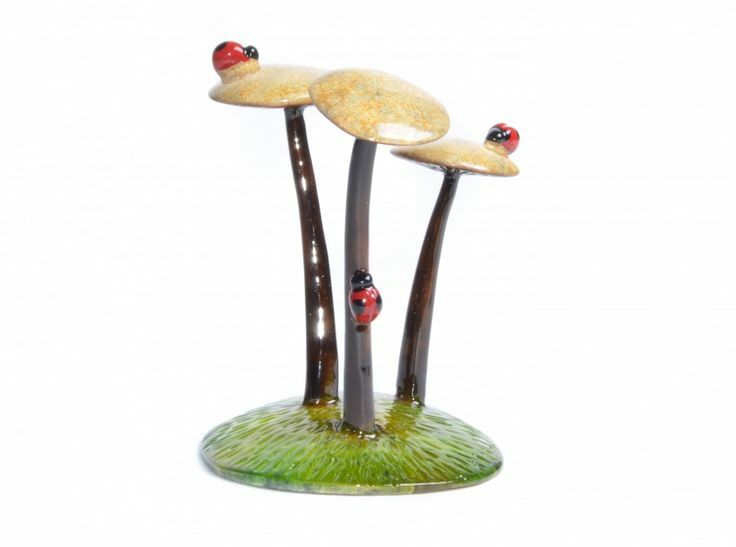 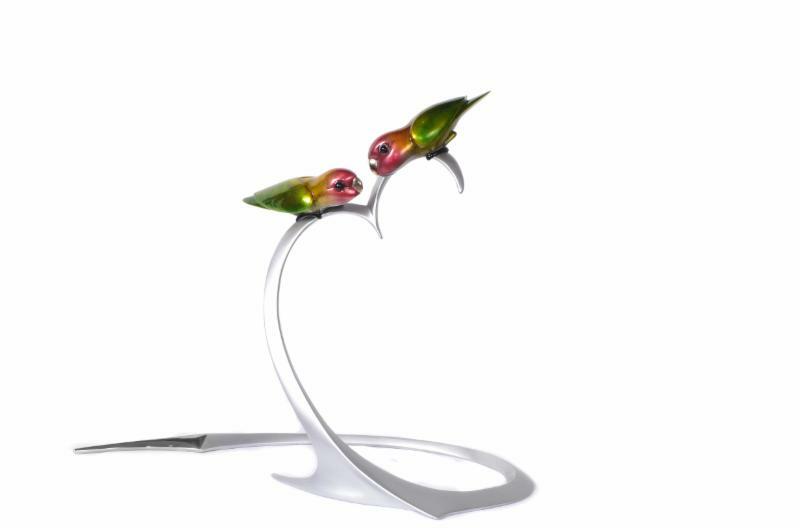 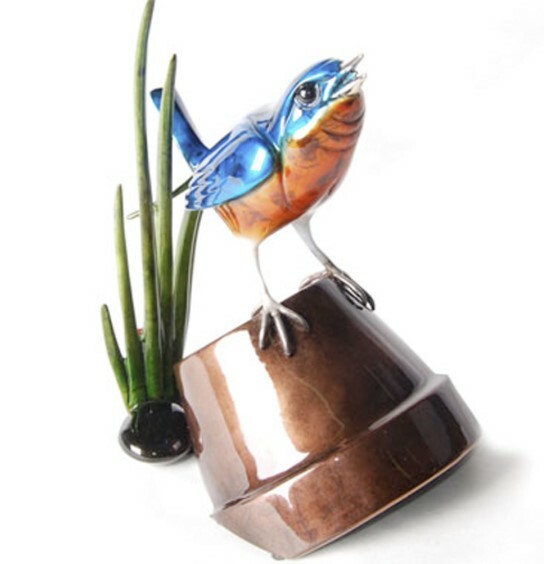 Available in the patina of your choice, this captivating sculpture can acclimate to any environment, be it indoors or outdoors. 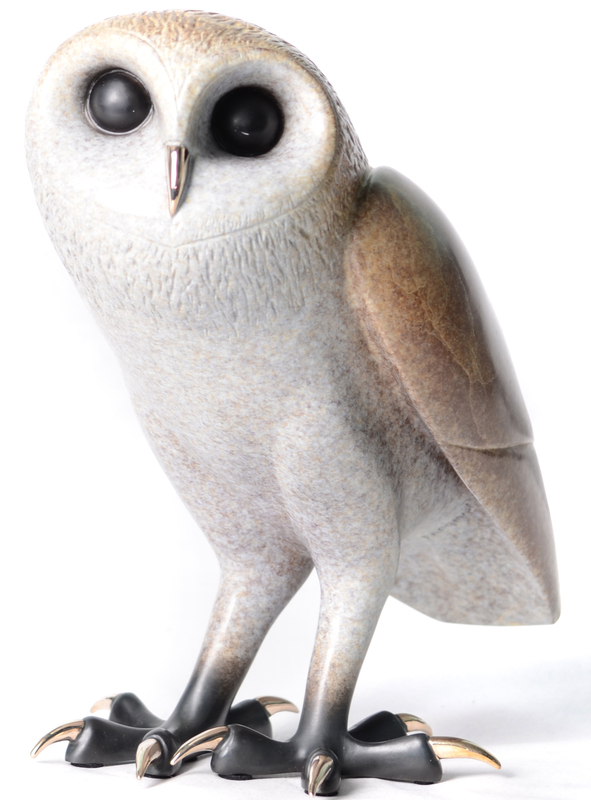 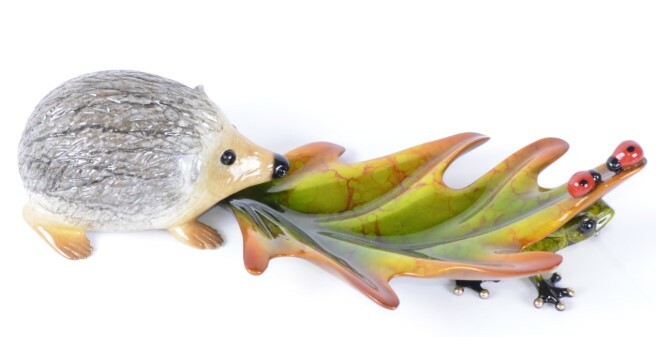 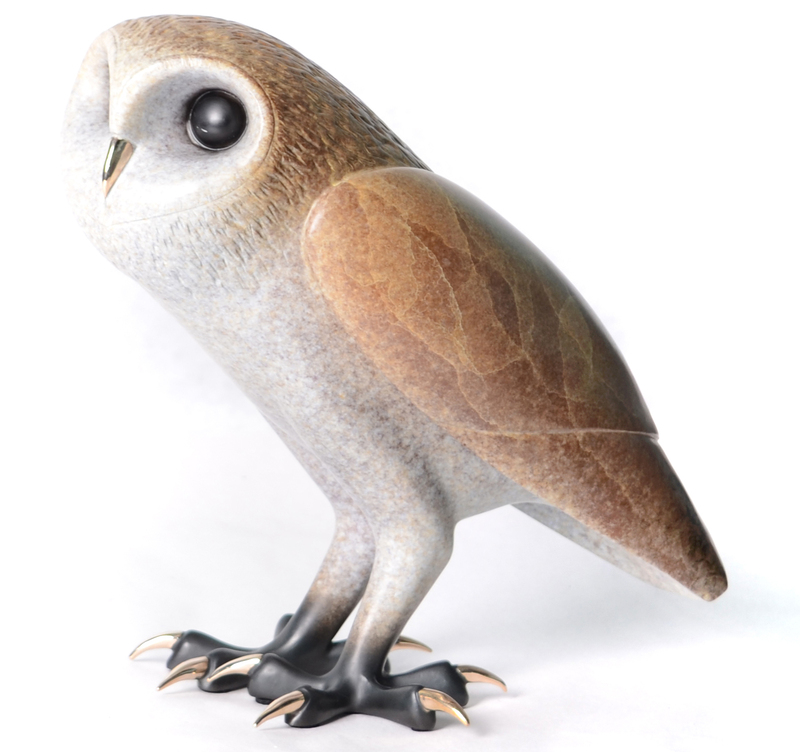 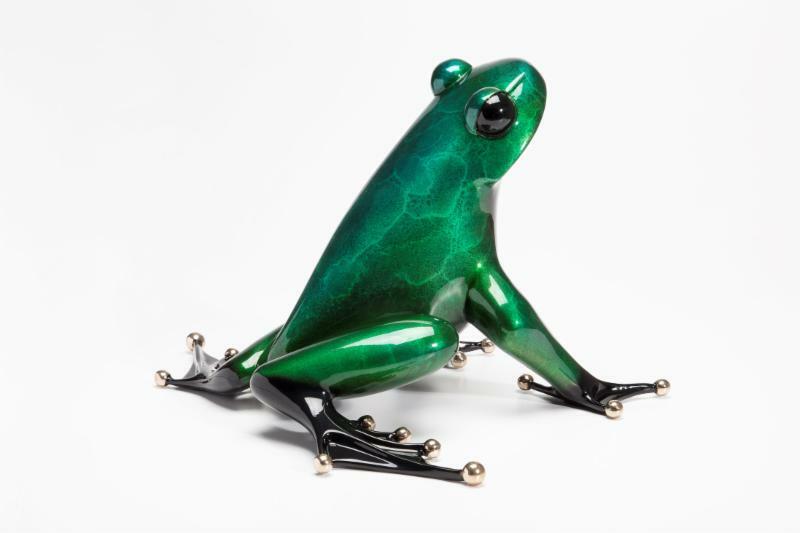 For those fortunate collectors who own Frederick, Ferguson is the ideal companion. 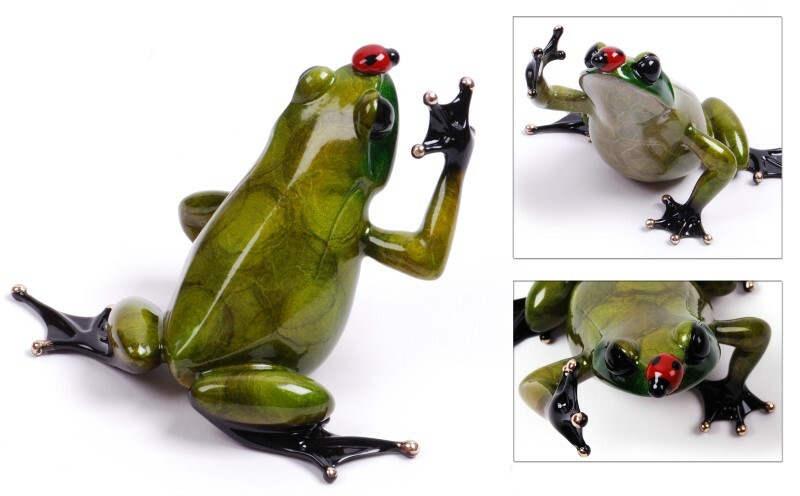 Tim Cotterill delights, once again, with this undeniable classic! 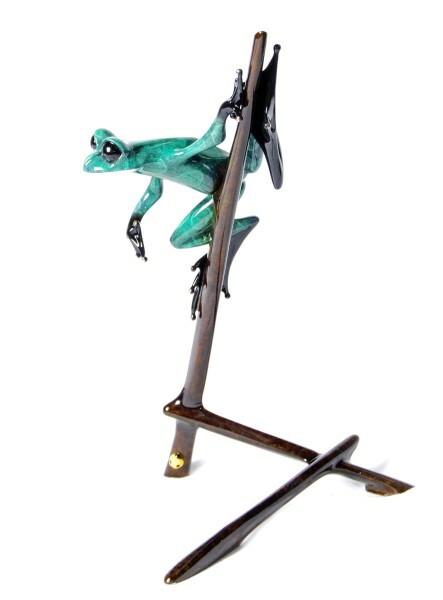 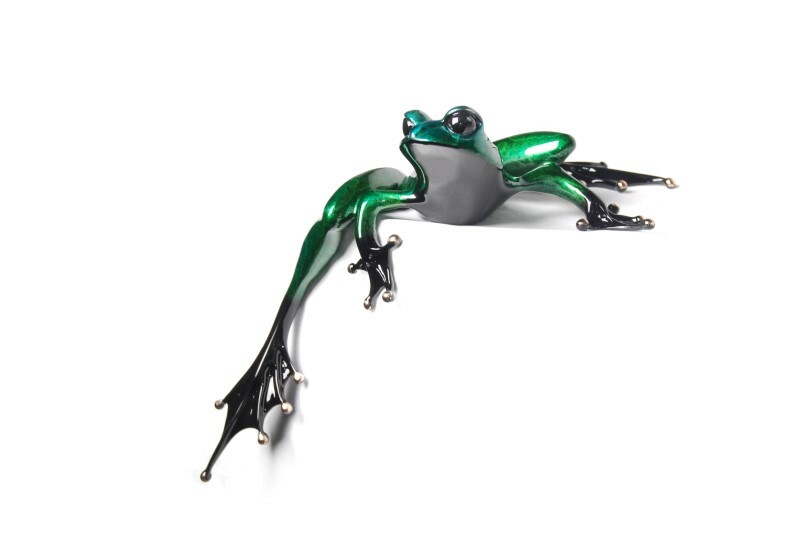 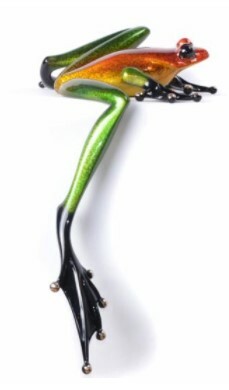 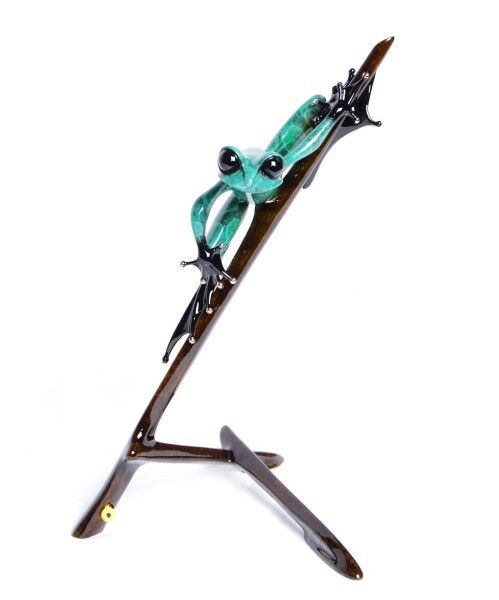 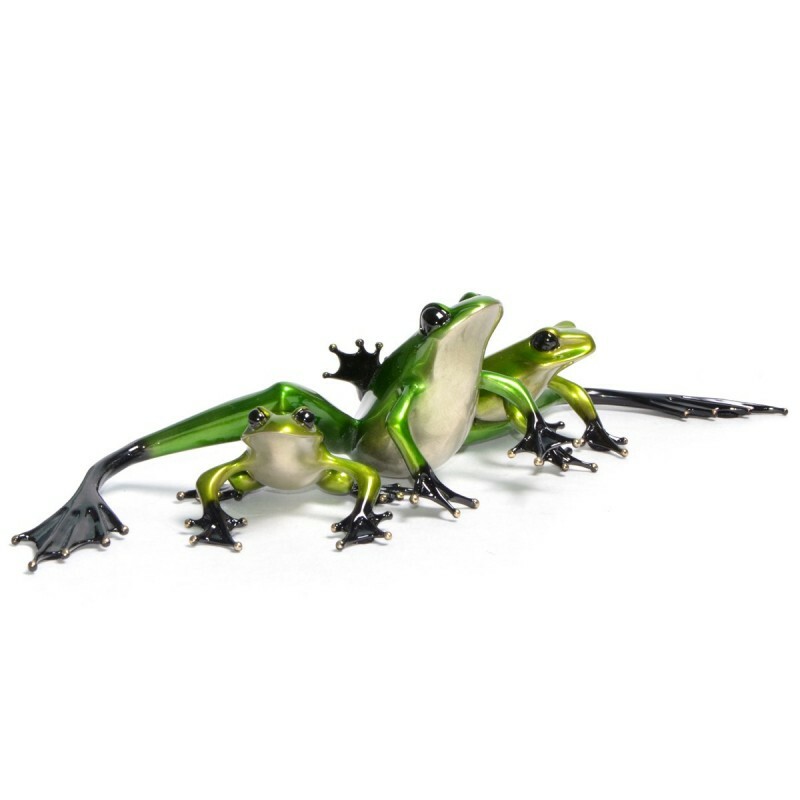 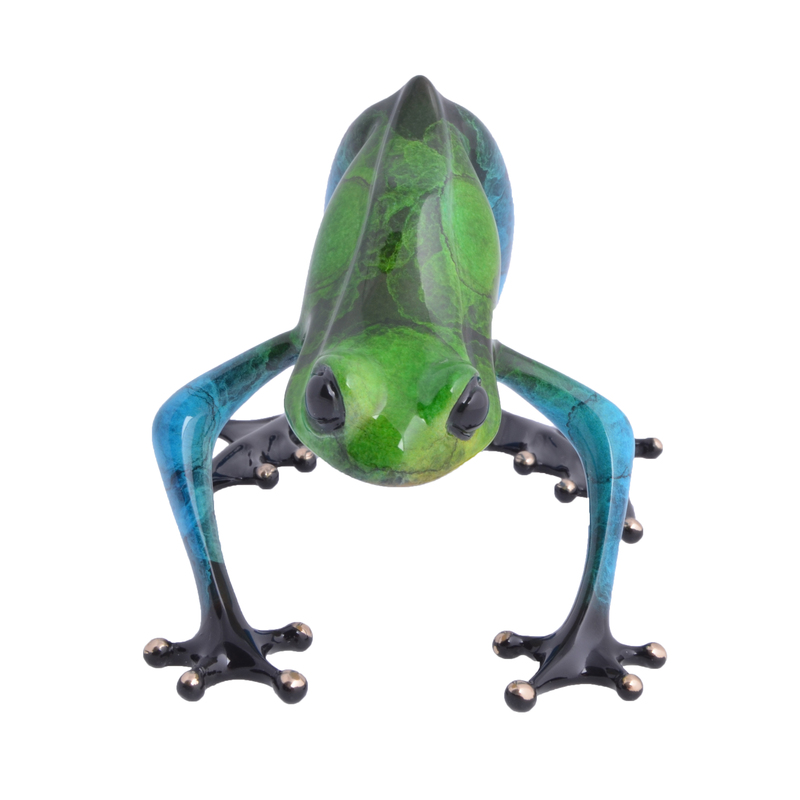 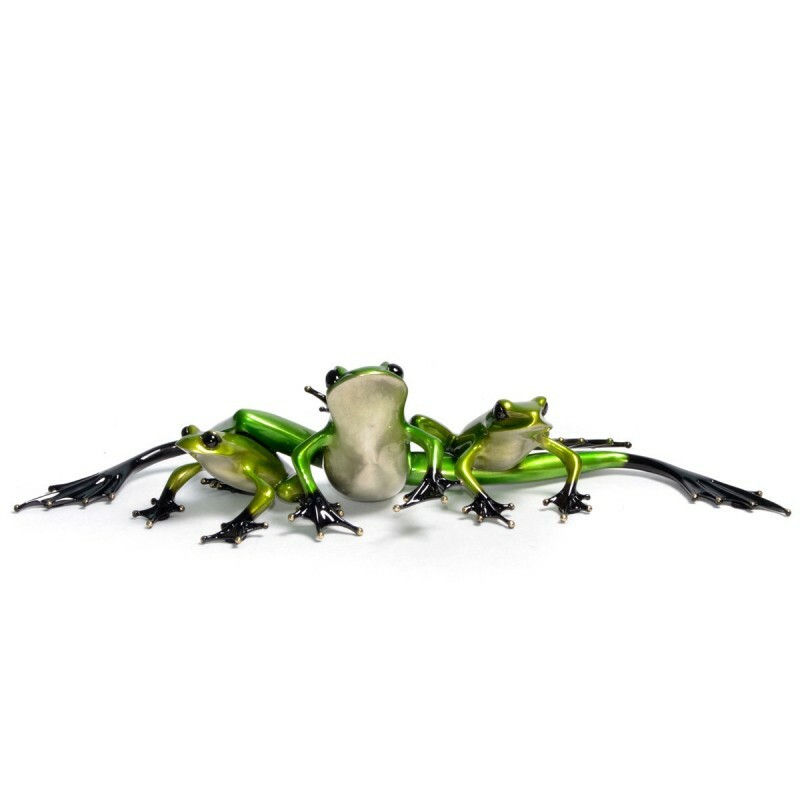 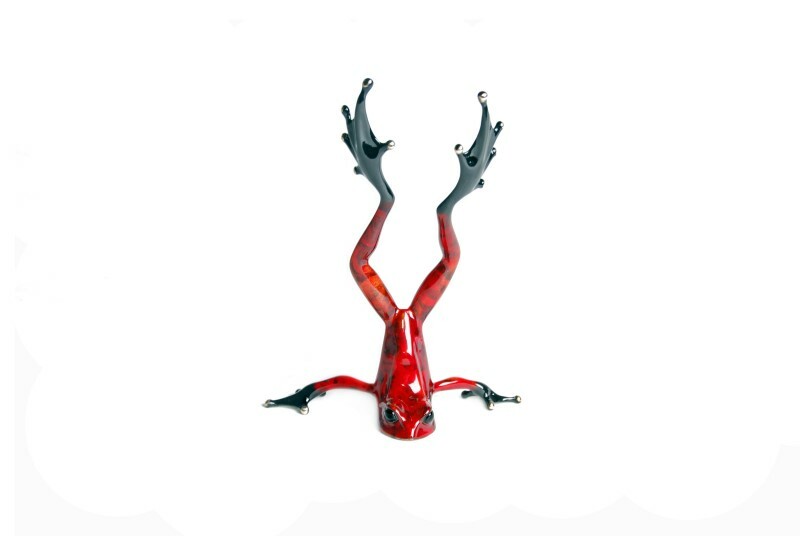 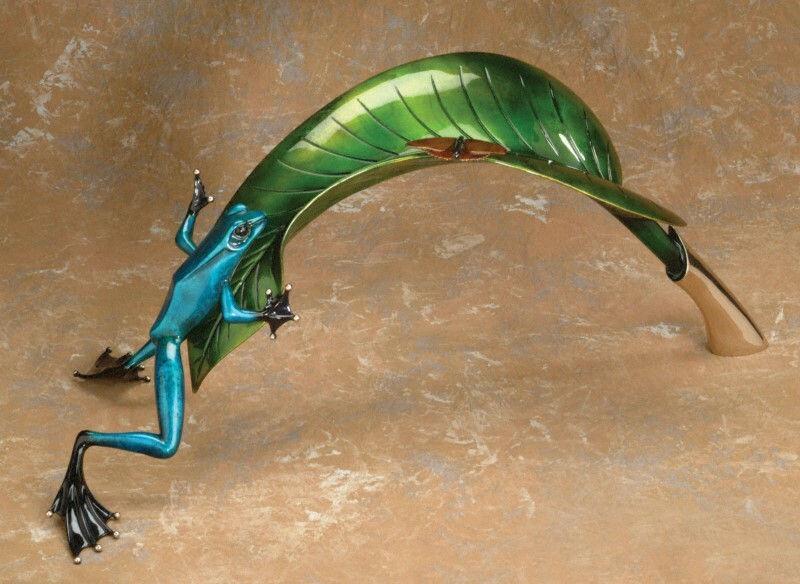 The Frogman | Ferguson Green Patina | Limited Edition Bronze Sculpture with Patina Finish, Edition of 100 | 14" X 18" X 11.75"
The Frogman | Ferguson Silver Patina | Limited Edition Bronze Sculpture with Patina Finish, Edition of 100 | 14" X 18" X 11.75"
The Frogman | Flair | Limited Edition Bronze Sculpture with Patina Finish, Edition of 1000 | 7" X 3.5" X 3.75"
1.5" X 6" X 3"
The Frogman | Flipper | Limited Edition Bronze Sculpture with Patina Finish,Edition of 5000 | 1.5" X 6" X 3"
18.25" X 8.5" X 9.5"
The Frogman | Florida Key | 2019 Key West Gallery Special Event Show Frog, Limited Edition of 15 in this Patina Finish | 18.25" X 8.5" X 9.5"
11.75" X 7.75" X 3"
The Frogman | Forget Me Not | Limited Edition Bronze Sculpture with Patina Finish, Edition of 350 | 11.75" X 7.75" X 3"
A vibrant gold frog gazes in wonder at a cluster of delicate wildflowers. 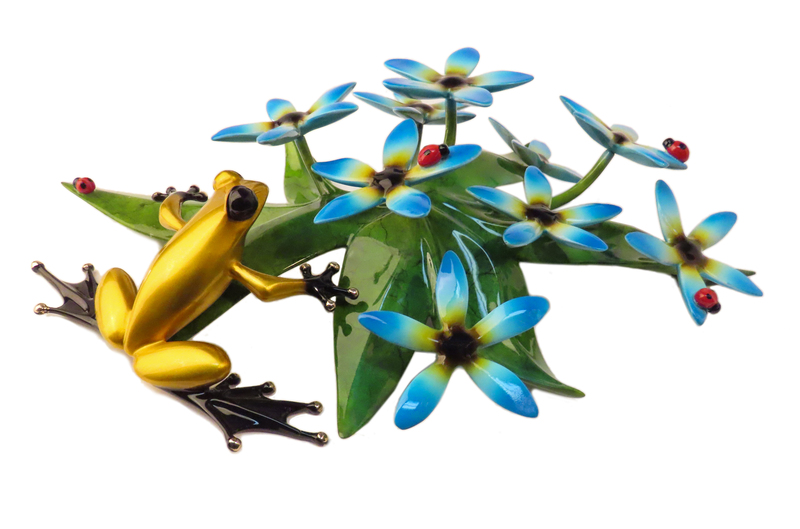 Saturated green leaves provide the ideal contrast to the subtle blue patina of the flowers. 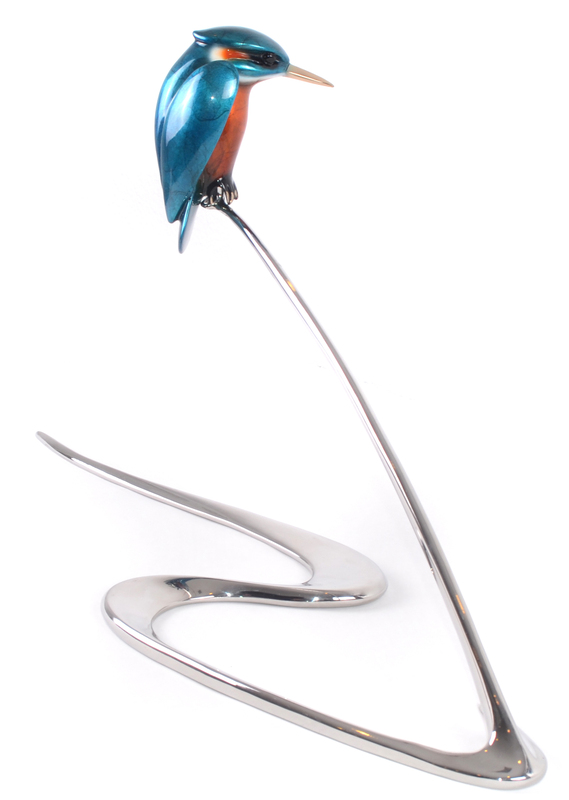 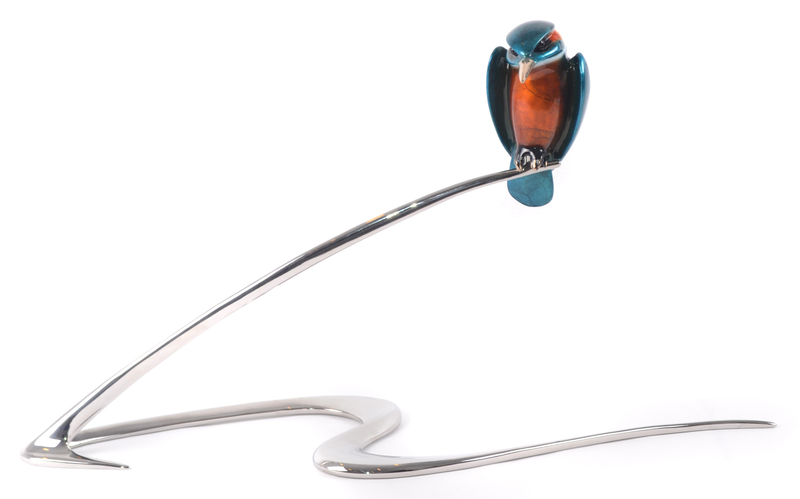 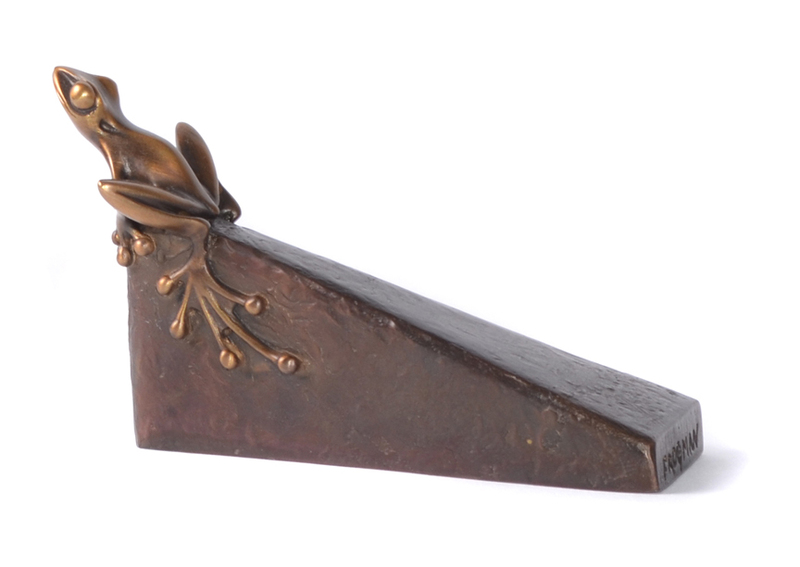 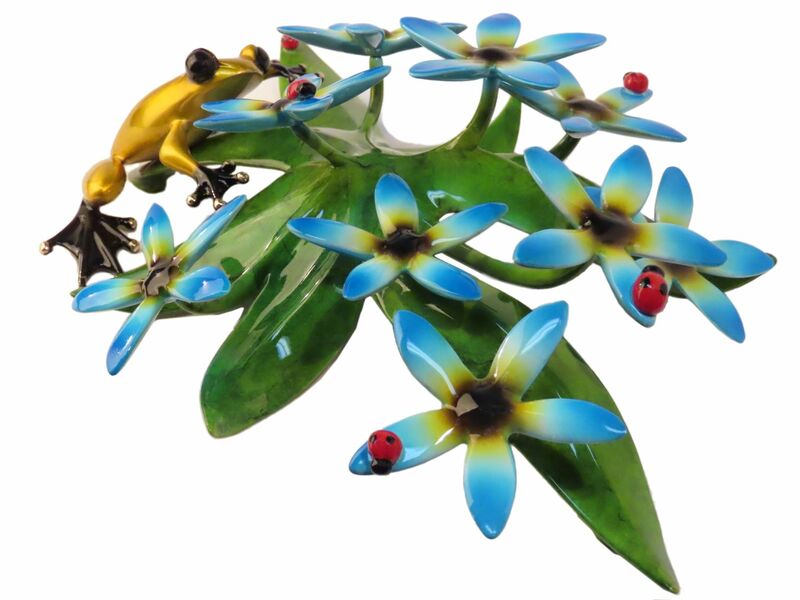 Forget-Me-Not, Tim Cotterill's 2019 Mother's Day Sculpture, pays tribute to Mom's everywhere and is the perfect expression of remembrance. 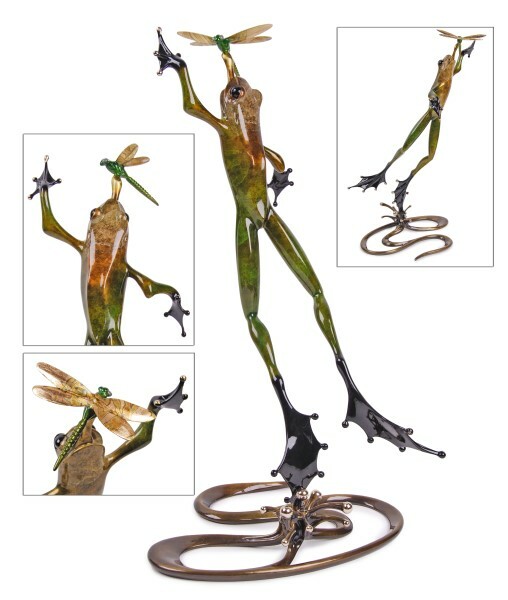 13" X 21.5" X 8"
The Frogman | Free Spirit | Limited Edition Bronze Sculpture with Patina Finish, Edition of 1000 | 13" X 21.5" X 8"
14.5" X 7" X 2.25"
The Frogman | Fuego | Limited Edition Bronze Sculpture with Patina Finish, Edition of 5000 | 14.5" X 7" X 2.25"
23.5" X 12" X 2"
The Frogman | Gemini | Limited Edition Bronze Sculpture with Patina Finish, Edition of 1000 | 23.5" X 12" X 2"
34" X 18" X 6"
The Frogman | Gold Rush | Limited Edition Bronze Sculpture with Patina Finish, Edition of 100 | 34" X 18" X 6"
2.5" X 1.4" X 0.5"
The Frogman | Gumdrop | Limited Edition Bronze Sculpture with Patina Finish, Edition of 5000 | 2.5" X 1.4" X 0.5"
8" X 4.5" X 3"
The Frogman | Hang Loose | Limited Edition Bronze Sculpture with Patina Finish,Edition of 1000 | 8" X 4.5" X 3"
The Frogman | Hang On | Limtited Edition Bronze Sculpture with Patina Finish, Edition of 500 | 2.5" X 4" X 4"
The Frogman | Head Over Heels | Limited Edition Bronze Sculpture with Patina Finish, Edition of 2000 | 4.25" X 2" X 6"
The Frogman | Hedge Fun | Limited Edition Bronze Sculpture with Patina Finish, Edition of 250 | 8" X 4" X 2"
The Frogman | Hiding Out | Limited Edition Bronze Sculpture with Patina Finish, Edition of 2000 | 6" X 9.5" X 5.5"
14.25" X 7.5" X 6"
The Frogman | High Dive | Limited Edition Bronze Sculpture with Patina Finish,Edition of 5000 | 14.25" X 7.5" X 6"
15.5" X 5" X 6.25"
The Frogman | High Flyer | Limited Edition Bronze Sculpture with Patina Finish, Edition of 500 | 15.5" X 5" X 6.25"
The Frogman | High Tea - 4 Part | Set of Limited Edition Bronze Sculpture with Patina Finish,Editions of 1000 | 0" X 0"
This set includes 4 sculptures which create a set: Chai, Jasmine, Pekoe, Tea Garden. 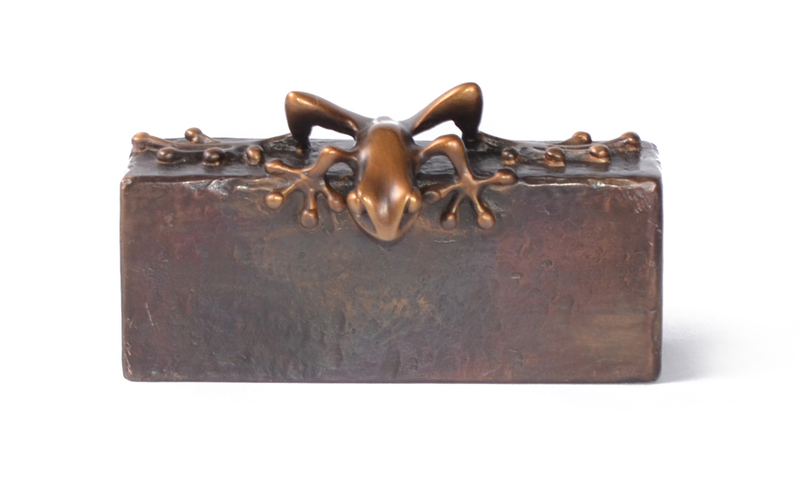 3.75" X 1.25" X 2"
The Frogman | Horizontal Paperweight | Limited Edition Bronze Sculpture, Edition of 500 | 3.75" X 1.25" X 2"
The Frogman | Hug | Limited Edition Bronze Sculpture with Patina Finish, Edition of 5000 | 3" X 4" X 3"
The Frogman | Indigo | Limited Edition Bronze Sculpture with Patina Finish, Edition of 5000 | 2.75" X 3" X 2.5"
11.5" X 8.75" X 16.25"
The Frogman | Iris | Limited Edition Bronze Sculpture with Patina Finish, Edition of 2000 | 11.5" X 8.75" X 16.25"
6.25" X 6.75" X 10.75"
The Frogman | I-Spy | Limited Edition Bronze Sculpture with Patina Finish | 6.25" X 6.75" X 10.75"
The Frogman | Jasmine | limited edition bronze sculpture with patina finish, Edition of 1000 | 3.5" X 2" X 2"
3.5" X 7.5" X 5.5"
The Frogman | Jitterbug | Limited Edition Bronze Sculpture with Patina Finish,Edition of 2000 | 3.5" X 7.5" X 5.5"
The Frogman | Joy Ride | Limited Edition Bronze Sculpture | 5" X 5" X 3.5"
The Frogman | Juliet | Limited Edition Bronze Sculpture with Patina Finish,Edition of 5000 | 2.25" X 4" X 4.5"
4.75" X 10.25" X 5"
The Frogman | Jump Start | Limited Edition Bronze Sculpture with Patina Finish,Edition of 2000 | 4.75" X 10.25" X 5"
8" X 11" X 11.5"
The Frogman | Lady Spencer - Orange | limited edition bronze sculpture with patina finish, edition of 300 | 8" X 11" X 11.5"
Welcome, Lady Spencer-Tim Cotterill's new large "leg over" frog. 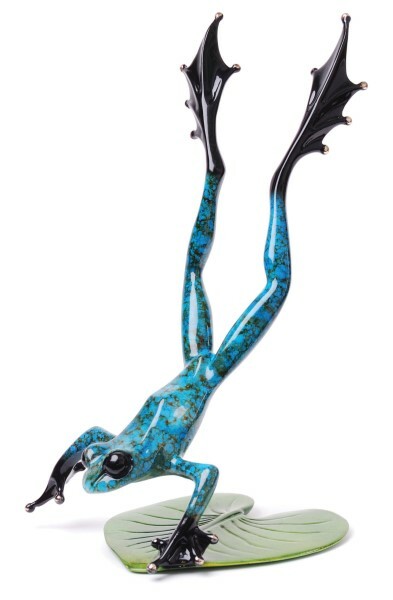 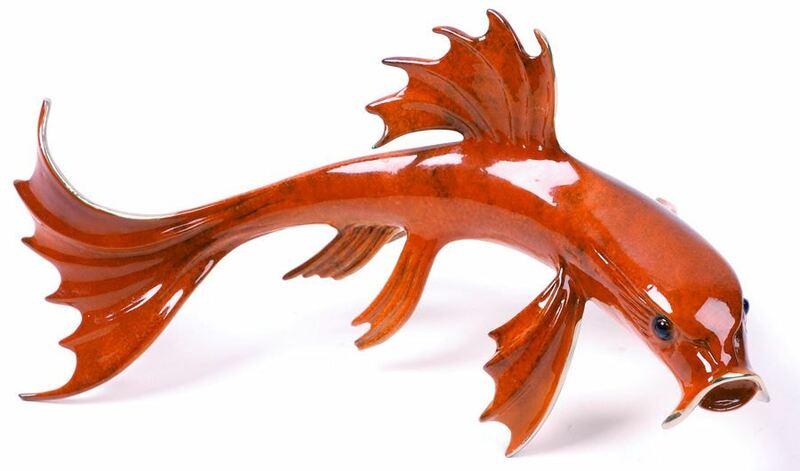 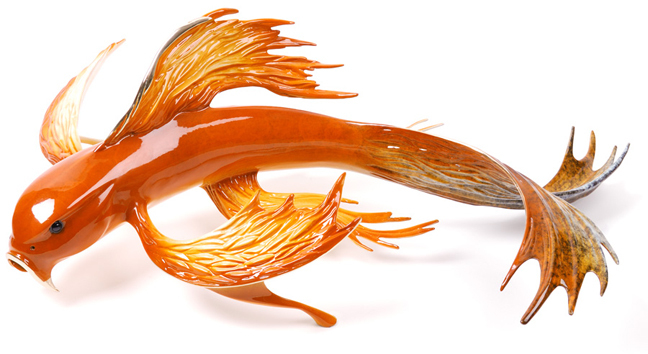 The labor intensive, richly patterned patina clearly accents the fluid lines of this graceful sculpture. 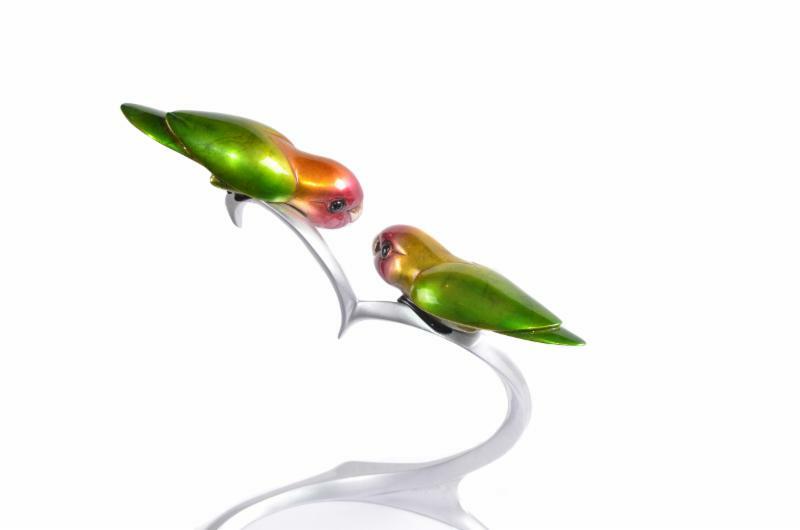 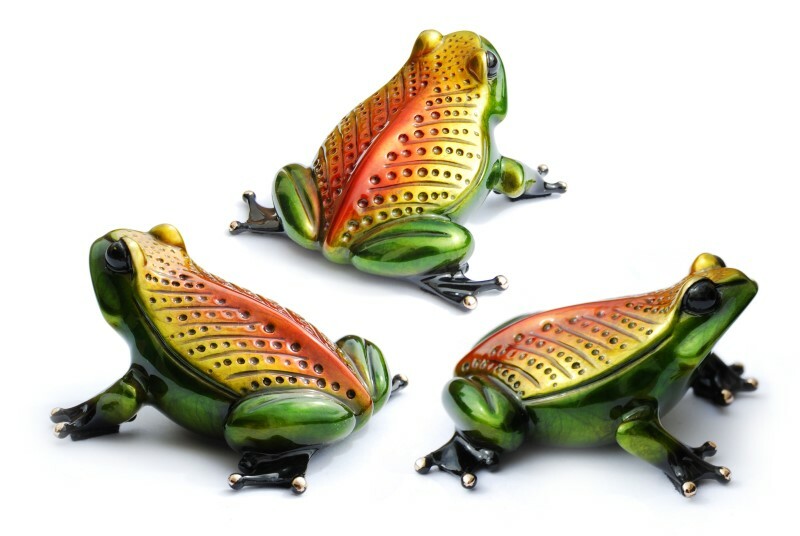 Lady Spencer is offered to collectors in a choice of two stunning tri-colored patinas. 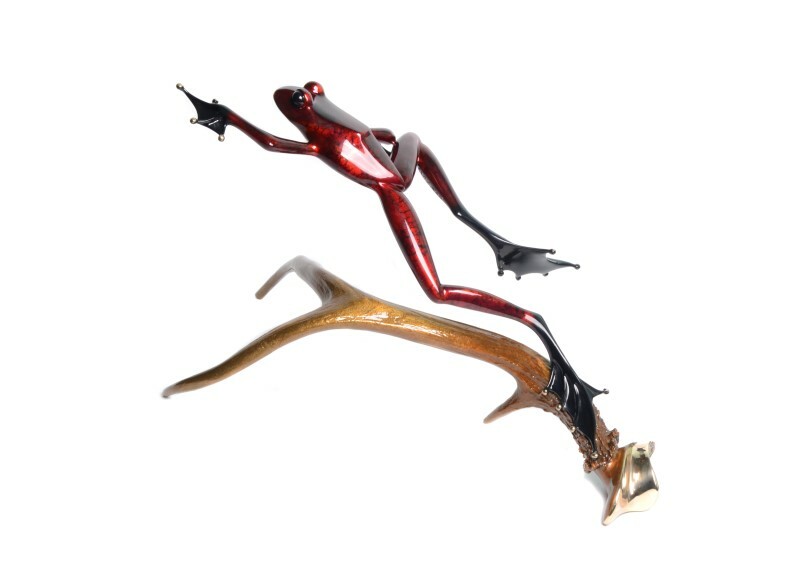 13" X 7" X 21"
The Frogman | Lazy River | Signed and Numbered Limited Edition Bronze Sculpture with Patina Finish, Edition of 400 | 13" X 7" X 21"
30" X 24.75" X 21.5"
The Frogman | Let's Do Lunch | Limited Edition Bronze Sculpture with Patina Finish,Edition of 250 | 30" X 24.75" X 21.5"
15" X 5" X 5.5"
The Frogman | Lily of the Valley | Limited Edition Bronze Sculpture with Patina Finish, Edition of 350 | 15" X 5" X 5.5"
A vivid red frog spies a ladybug resting on a delicate sprig of Lily of the Valley flowers. 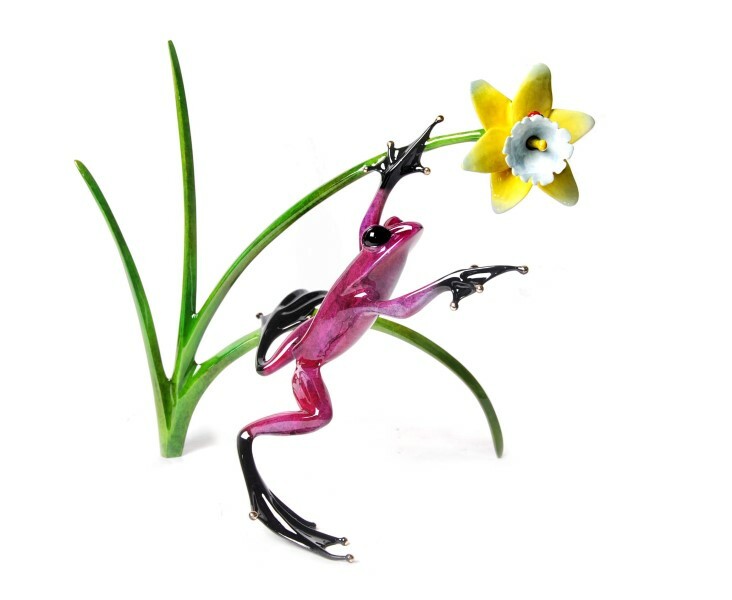 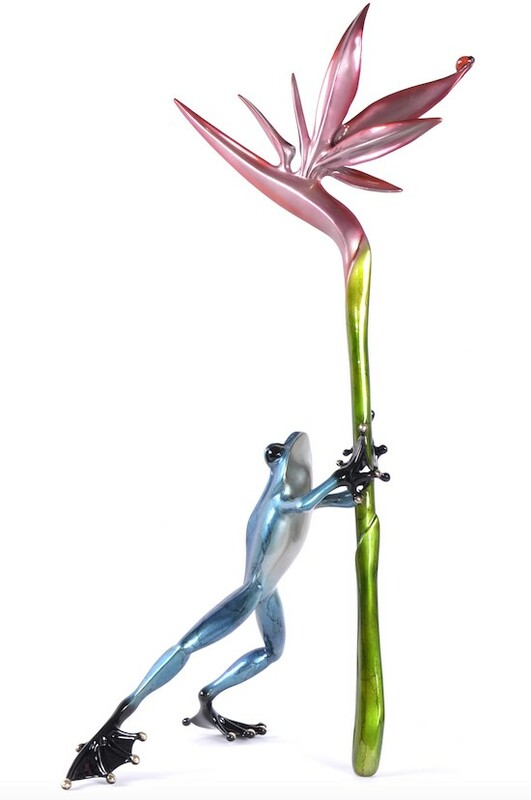 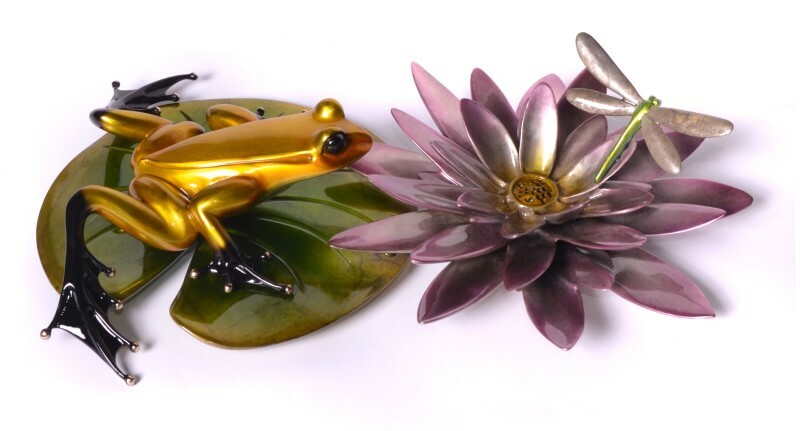 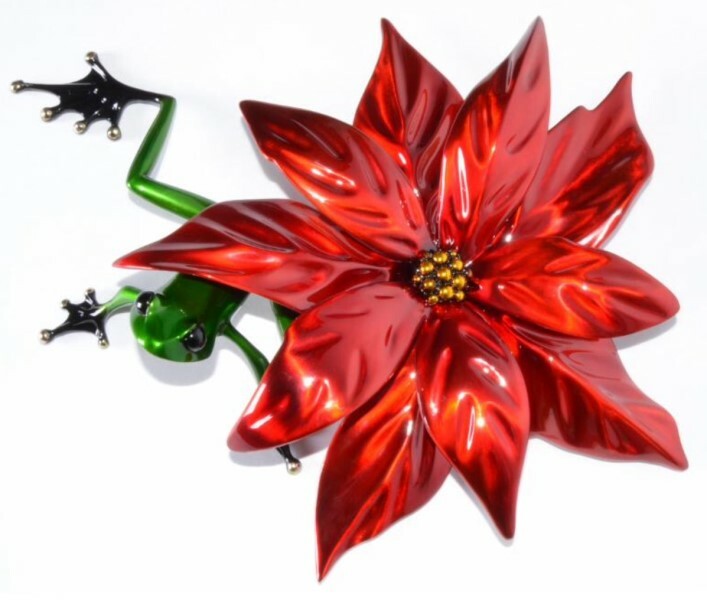 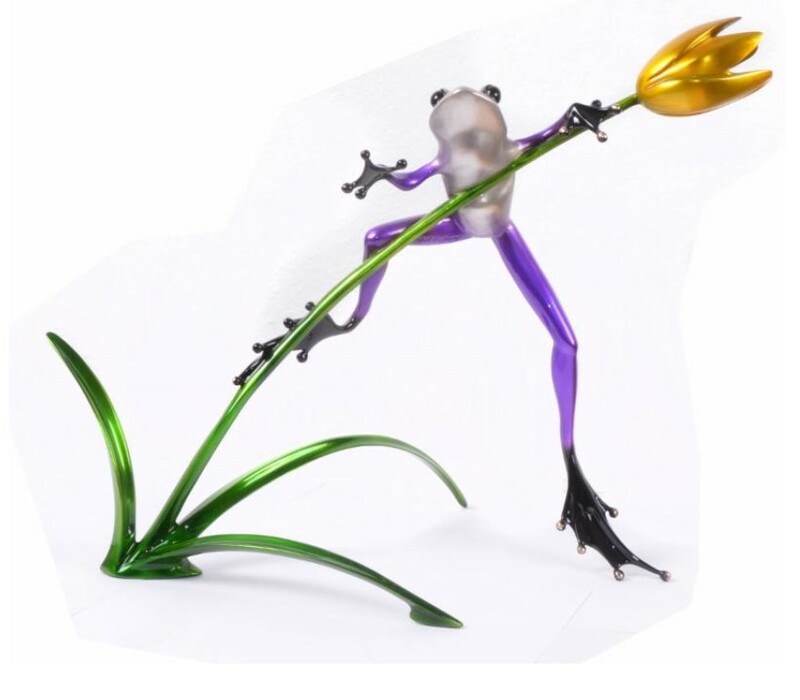 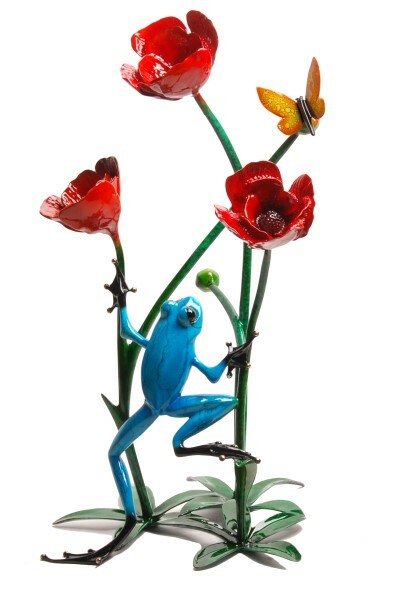 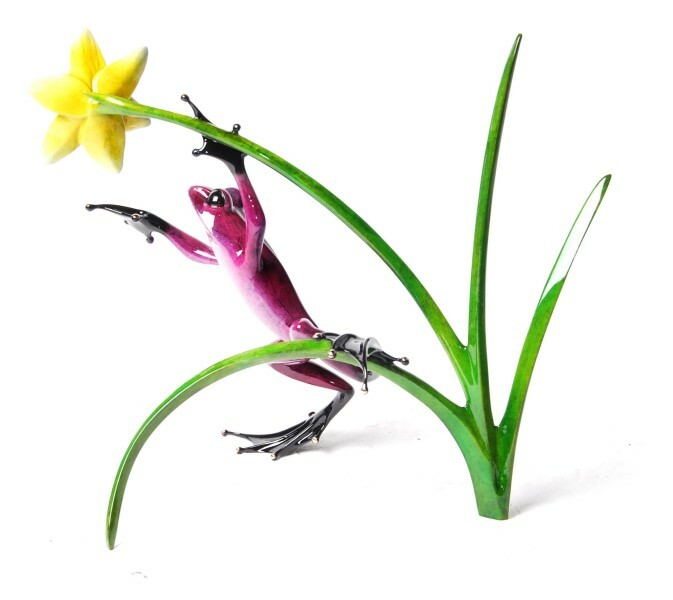 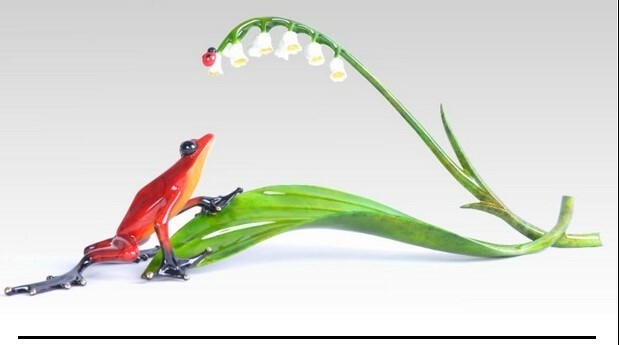 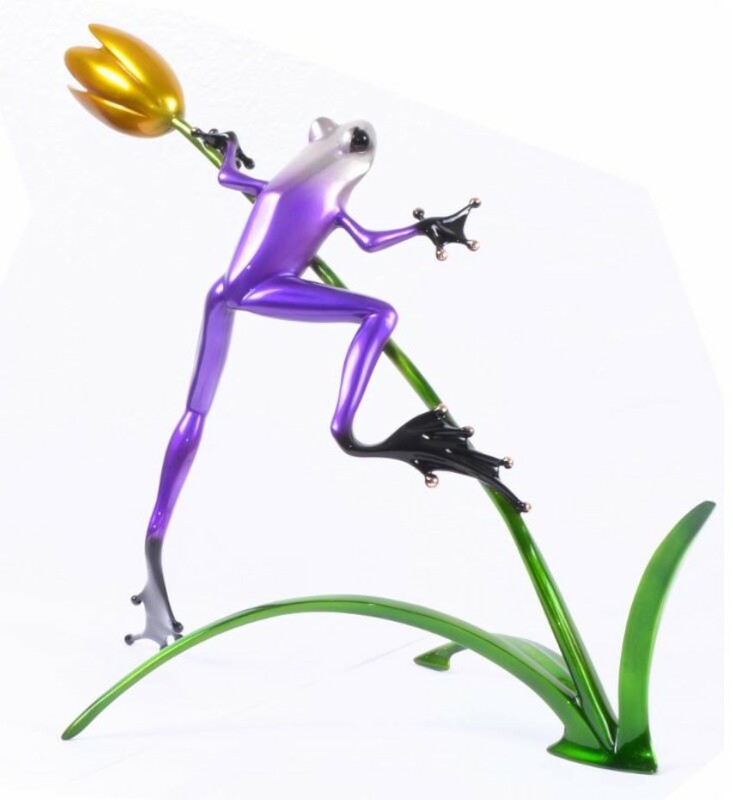 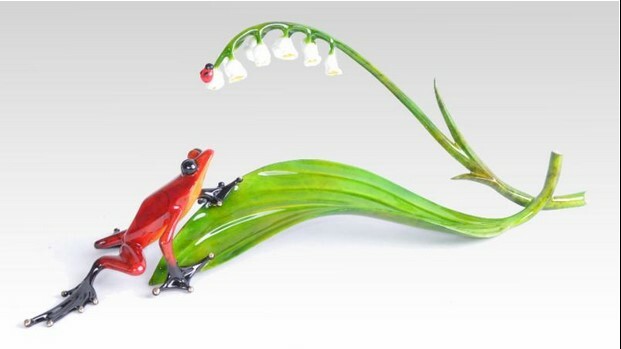 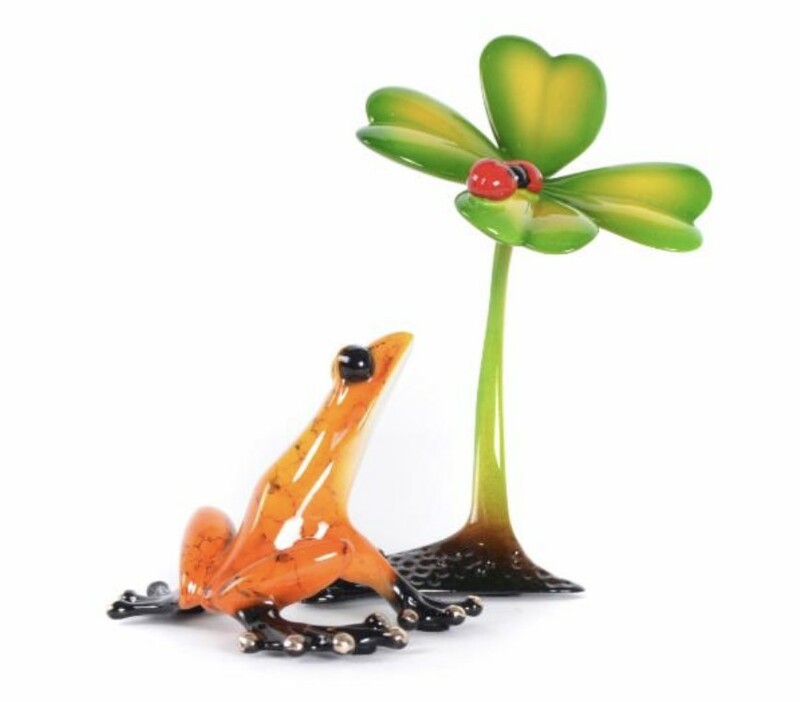 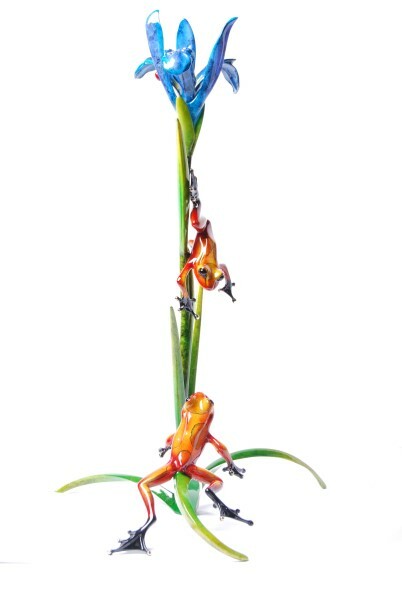 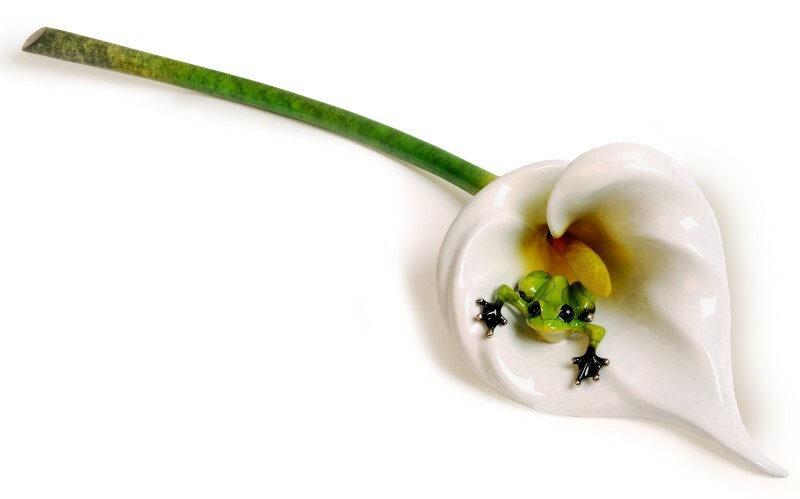 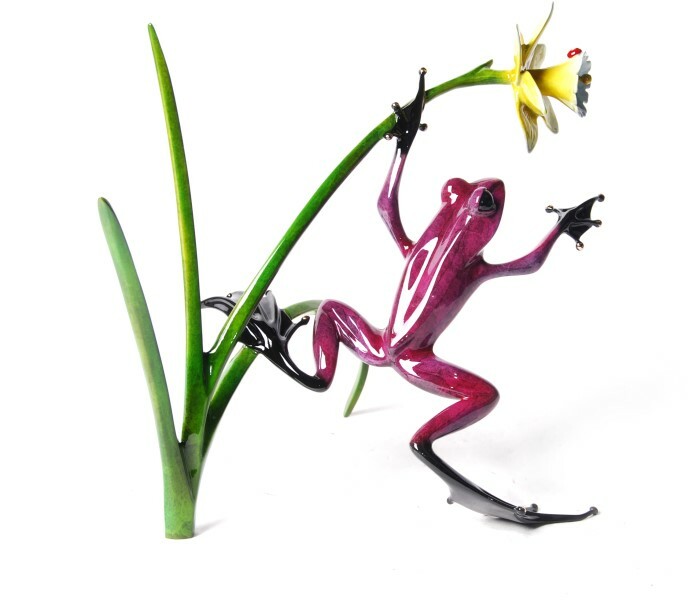 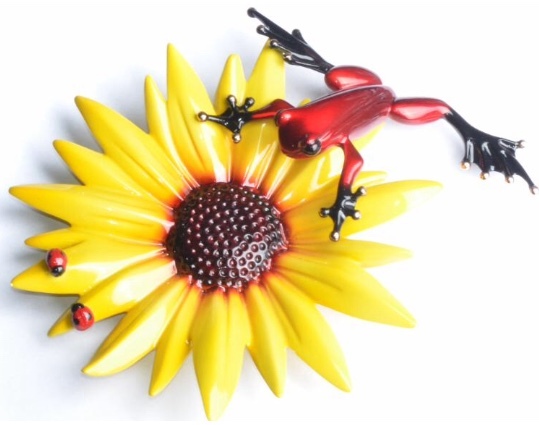 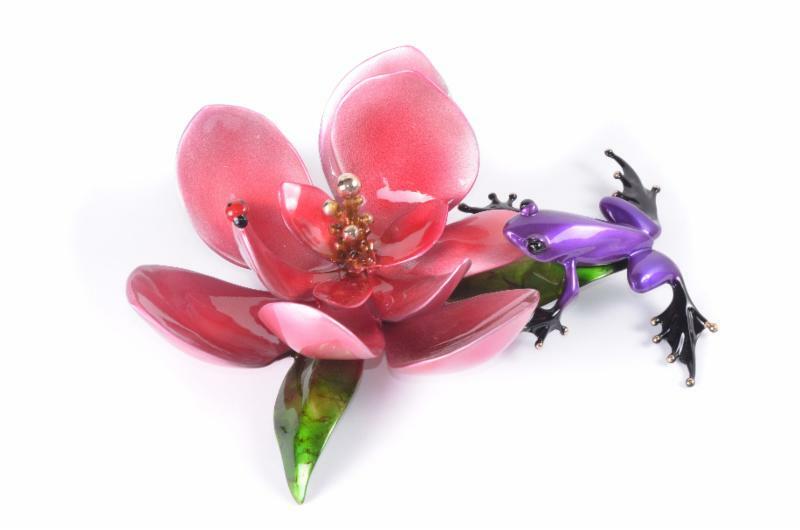 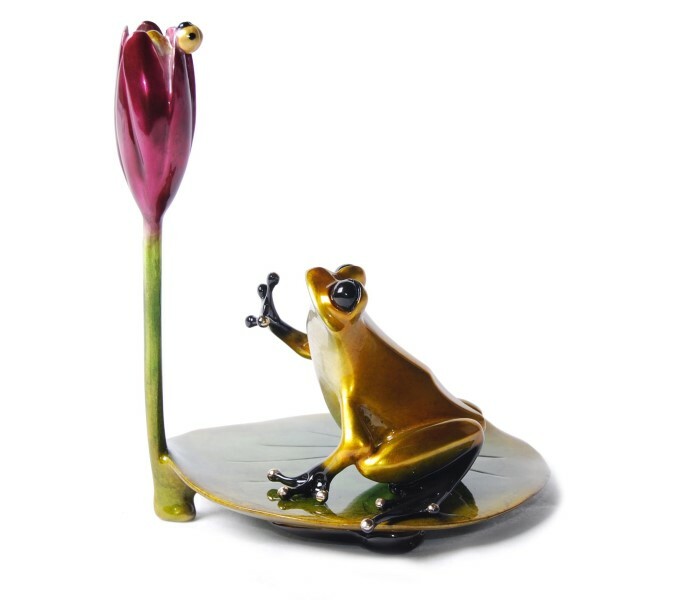 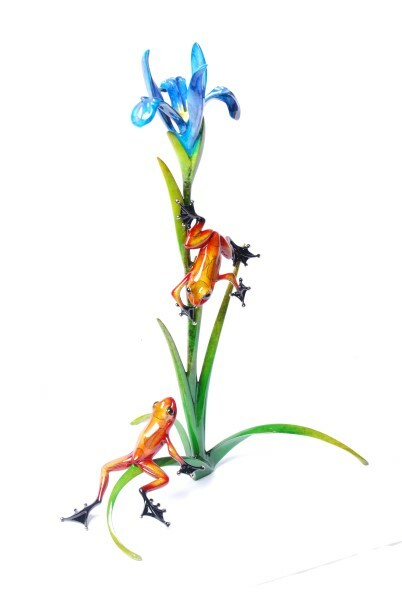 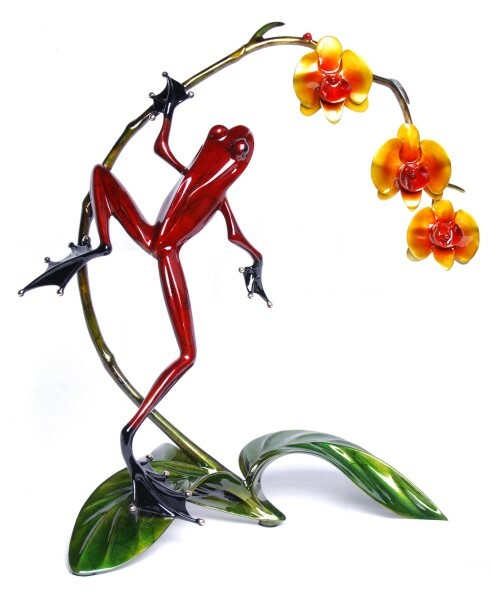 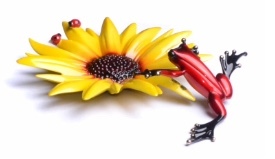 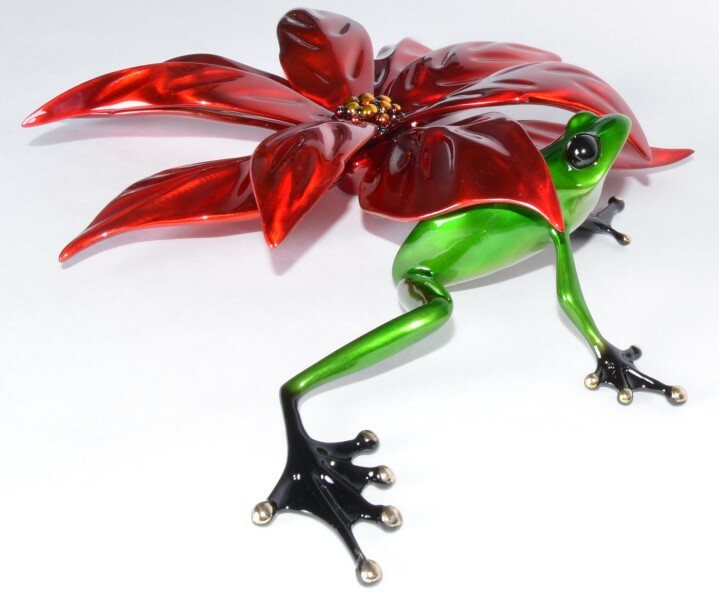 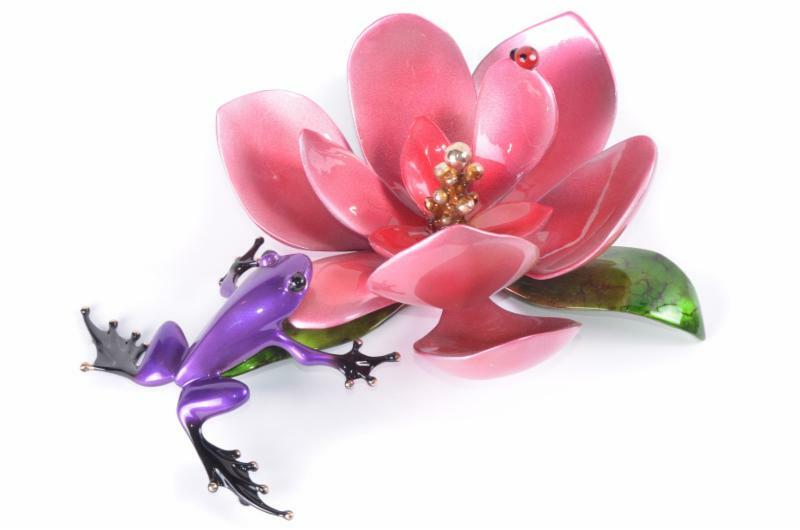 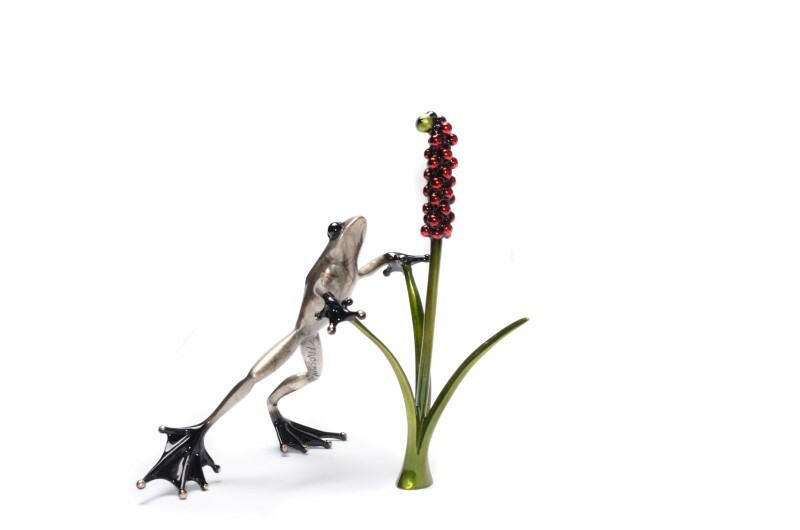 The graceful arc that is formed by the flowers, leaf and the frog reminds us, once again, of the harmony of nature. 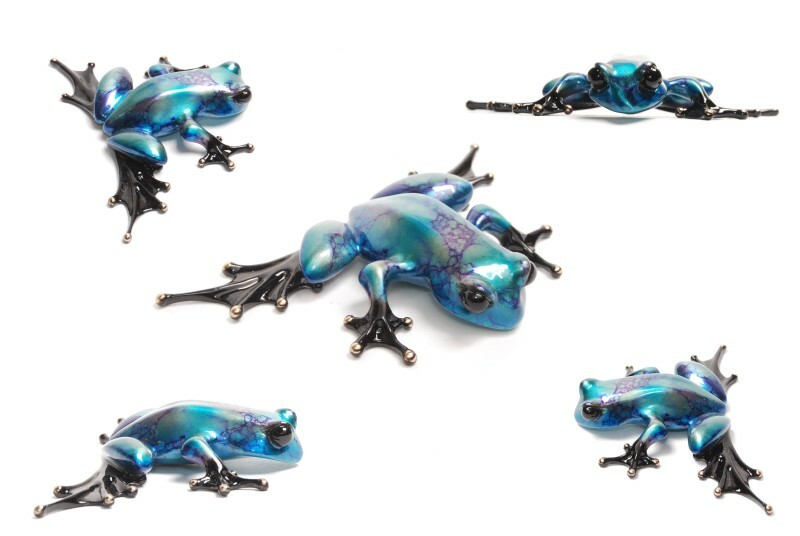 6" X 4" X 2.75"
The Frogman | Little Ladies | Limited Edition Bronze Sculpture with Patina Finish, Edition of 5000 | 6" X 4" X 2.75"
3.75" X 5" X 2.5"
The Frogman | Little Wally | Limited Edition Bronze Sculpture with Patina Finish,Edition of 5000 | 3.75" X 5" X 2.5"
8" X 2" X 6"
The Frogman | Lookin' For Love | Limited Edition Bronze Sculpture With Patina Finish, Edition of 500 | 8" X 2" X 6"
4.5" X 5.25" X 5.75"
The Frogman | Lords and Ladies | Limited Edition Bronze Sculpture with Patina Finish, Edition of 2000 | 4.5" X 5.25" X 5.75"
4" X 7.25" X 1.5"
The Frogman | Love | Limited Edition Bronze Sculpture with Patina Finish, Edition of 2000 | 4" X 7.25" X 1.5"
19" X 10" X 16"
The Frogman | Lovebirds | Limited Edition Bronze Sculpture with Patina Finish, Edition of 200 | 19" X 10" X 16"
The Frogman | Lucky Bug | Limited Edition Bronze Sculpture with Patina Finish, Edition of 5000 | 1" X 3" X 3"
5" X 5.25" X 3.5"
The Frogman | Mad Hatter | Limited Edition Bronze Sculpture with Patina Finish, Edition of 40 | 5" X 5.25" X 3.5"
8.5" X 7" X 3.5"
The Frogman | Magnolia | Limited Edition Bronze Sculpture with Patina Finish, Edition of 350 | 8.5" X 7" X 3.5"
14.25" X 8.25" X 3.5"
The Frogman | Mamacita | Limited Edition Bronze Sculpture with Patina Finish, Edition of 5000 | 14.25" X 8.25" X 3.5"
The Frogman | Margarita | Limited Edition Bronze Sculpture with Patina Finish, Edition of 5000 | 11" X 9" X 3.5"
10.5" X 4" X 4"
The Frogman | Mellow Yellow | Limited Edition Bronze Sculpture with Patina Finish, Edition of 2000 | 10.5" X 4" X 4"
15" X 8.25" X 3"
The Frogman | Midas Touch | Limited Edition Bronze Sculpture with Patina Finish, Edition of 500 | 15" X 8.25" X 3"
9.5" X 8.5" X 6.5"
The Frogman | Morning Glory | Limited Edition Bronze Sculpture with Patina Finish, Edition of 2000 | 9.5" X 8.5" X 6.5"
4.5" X 2.75" X 2.5"
The Frogman | Namaste | Limited Edition Bronze Sculpture with Patina Finish, Edition of 500 | 4.5" X 2.75" X 2.5"
The Frogman | Napoleon | Limited Edition Bronze Sculpture with Patina Finish, Edition of 300 | 4" X 4" X 22.5"
BF222 Napoleon Edition Size 300 SRP $1350 4" L x 4" W x 22.5" H (Owl dimensions 4"L x 3.5"W x 7"H) A studious and quite observant owl perches firmly atop a classically-inspired obelisk. 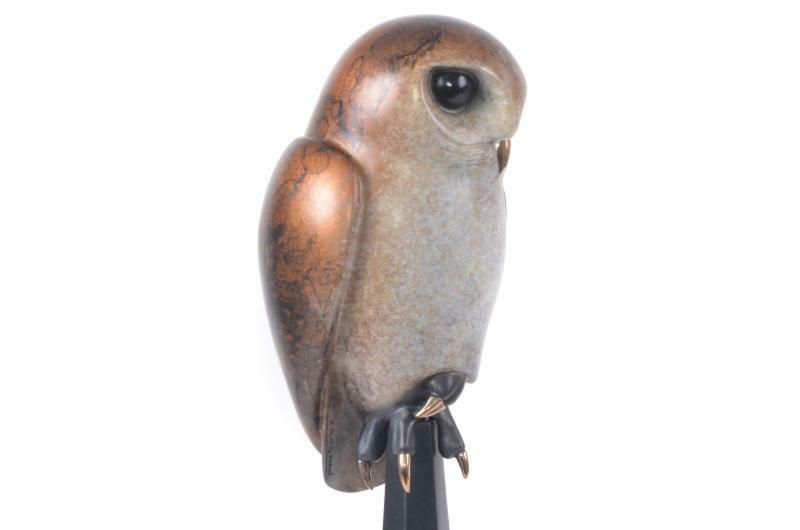 Napoleon, Tim Cotterill's newest addition to his parliament, sports a speckled bronze patina, seamlessly transitioning to burnished rust tones. 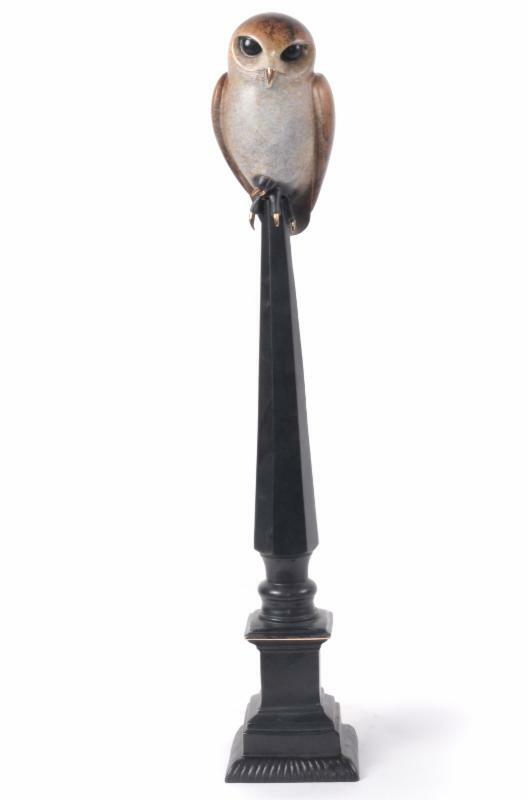 Napoleon - perhaps perusing his troops? 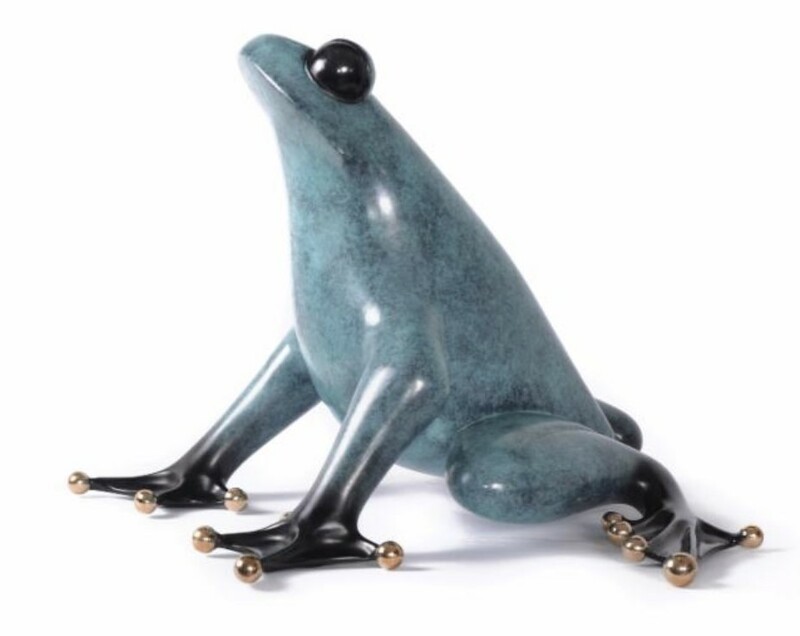 8" X 6" X 9.5"
The Frogman | Odyssey | Limited Edition Bronze Sculpture with Patina Finish, Edition of 500 | 8" X 6" X 9.5"
The Frogman | Ollie | Limited Edition Bronze Sculpture With Patina Finish, Edition of 1000 | 4" X 4" X 2"
The Frogman | Orchid | Limited Edition Bronze Sculpture with Patina Finish, Edition of 750 | 16" X 10.5" X 15.75"
7" X 10.2" X 5.75"
The Frogman | Out on a Limb | Limited Edition Bronze Sculpture with Patina Finish,Edition of 2000 | 7" X 10.2" X 5.75"
13" X 27.5" X 11.25"
The Frogman | Over the Top | Limited Edition Bronze Sculpture with Patina Finish,Edition of 750 | 13" X 27.5" X 11.25"
14" X 27" X 16"
The Frogman | Papillon | Limited Edition Bronze Sculpture with Patina Finish, Edition of 750 | 14" X 27" X 16"
The Frogman | Paradise | Limited Edition Bronze Sculpture with Patina Finish,Edition of 2000 | 18.25" X 8.5" X 9.5"
17" X 14" X 42"
The Frogman | Parliament | Limited Edition Bronze Sculpture with Patina Finish, Edition of 35 | 17" X 14" X 42"
3.75" X 2.75" X 1.25"
The Frogman | Pekoe | Limited Edition Bronze Sculpture with Patina Finish, Edition of 1000 | 3.75" X 2.75" X 1.25"
The Frogman | Poinsettia | Limited Edition Bronze Sculpture with Patina Finish, Edition of 500 | 11" X 9" X 3"
2" X 7.75" X 7"
The Frogman | Pond Pals | Limited Edition Bronze Sculpture with Patina Finish,Edition of 2500 | 2" X 7.75" X 7"
The Frogman | Poppy | Limited Edition Bronze Sculpture with Patina Finish, Edition of 500 | 13.25" X 11" X 20"
The Frogman | Portabello | Limited Edition Bronze Sculpture with Patina Finish, Edition of 2500 | 5.5" X 5.25" X 3.5"
2" X 3.5" X 3.75"
The Frogman | Prince Charming | Limited Edition Bronze Sculpture with Patina Finish, Edition of 2000 | 2" X 3.5" X 3.75"
21.25" X 12.25" X 11"
The Frogman | Quantum Leap | Limited Edition Bronze Sculpture with Patina Finish,Edition of 750 | 21.25" X 12.25" X 11"
The Frogman | Ready, Set, Go | Limited Edition Bronze Sculpture with Patina Finish,Edition of 5000 | 16" X 12" X 6"
10.75" X 37" X 12"
The Frogman | Rendezvous | Limited Edition Bronze Sculpture with Patina Finish,Edition of 500 | 10.75" X 37" X 12"
4.25" X 2.75" X 4"
The Frogman | Rockefeller | Limited Edition Bronze Sculpture with Patina Finish, Edition of 2500 | 4.25" X 2.75" X 4"
The Frogman | Salsa | Limited Edition Bronze Sculpture with Patina Finish, Edition of 2000 | 2" X 2" X 2"
The Frogman | Sangria | Limited Edition Bronze Sculpture with Patina Finish, Edition of 100 | 0" X 0"
1" X 4" X 2.25"
The Frogman | Scooter | Limited Edition Bronze Sculpture with Patina Finish, Edition of 5000 | 1" X 4" X 2.25"
11" X 8" X 16.25"
The Frogman | Shakespeare | Limited Edition Bronze Sculpture with Patina Finish, Edition of 200 | 11" X 8" X 16.25"
1.5" X 2.25" X 2.25"
The Frogman | Sherwood | Limited Edition Bronze Sculpture with Patina Finish,Edition of 5000 | 1.5" X 2.25" X 2.25"
6" X 5.75" X 2.25"
The Frogman | Sidekick | Limited Edition Bronze Sculpture with Patina Finish, Edition of 350 | 6" X 5.75" X 2.25"
BF211 Sidekick Edition Size 350 6" L x 5.75" W x 2.25" H Frogman delights us with his latest release, Sidekick. 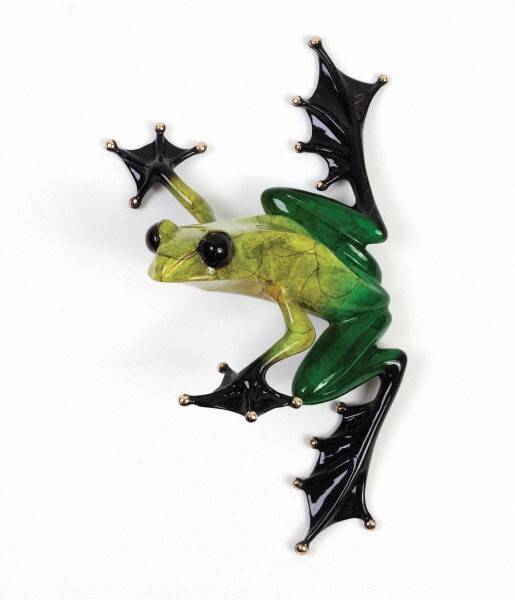 Vibrant nitrate patinas adorn this unlikely alliance. 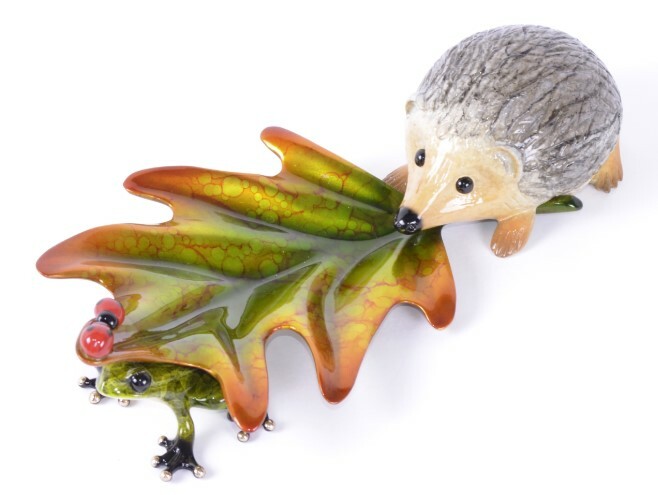 We can only imagine what highjinks these two are up to. 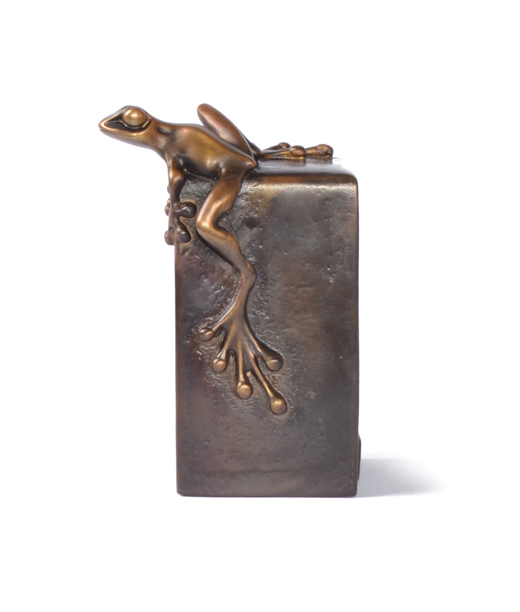 7.5" X 3" X 3.25"
The Frogman | Small Fry | Limited Edition Bronze Sculpture with Patina Finish, Edition of 2000 | 7.5" X 3" X 3.25"
2.25" X 5.75" X 5.5"
The Frogman | Sneaky Pete | Limited Edition Bronze Sculpture with Patina Finish,Edition of 5000 | 2.25" X 5.75" X 5.5"
7.25" X 4.5" X 3.75"
The Frogman | Spot On | Limited Edition Bronze Sculpture with Patina Finish, Edition of 1000 | 7.25" X 4.5" X 3.75"
Spot On by Tim Cotterill. 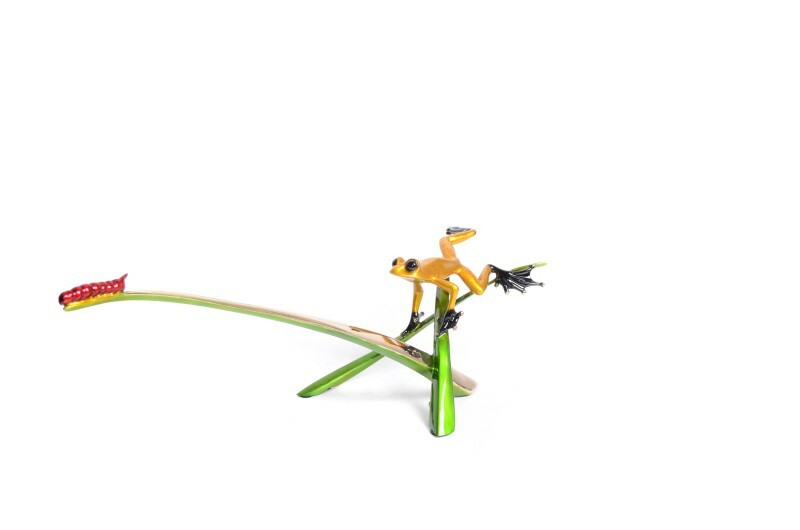 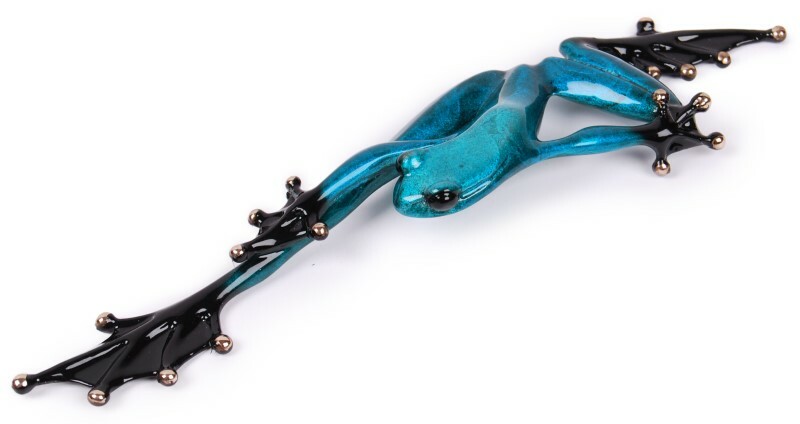 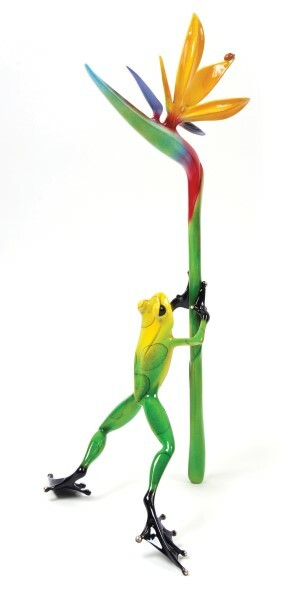 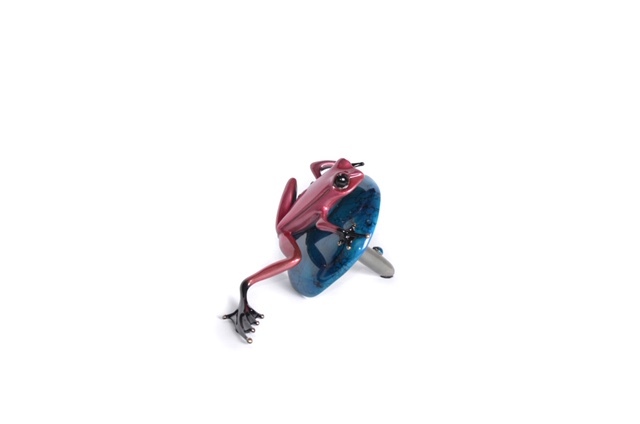 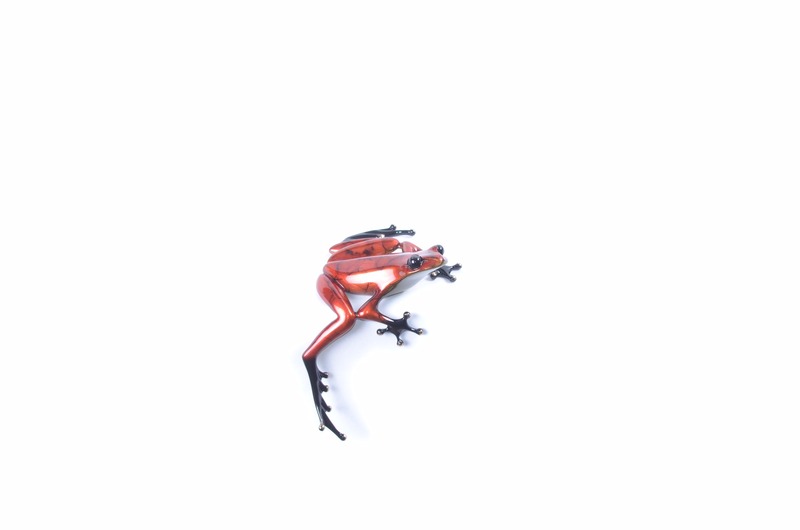 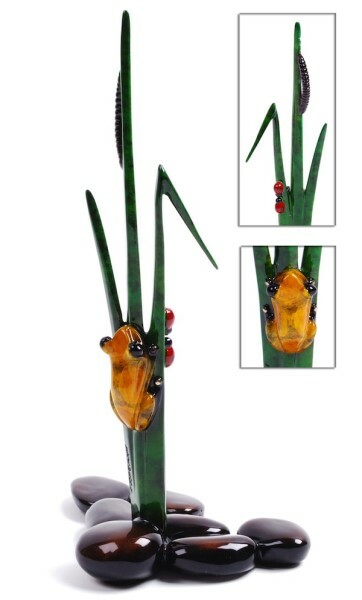 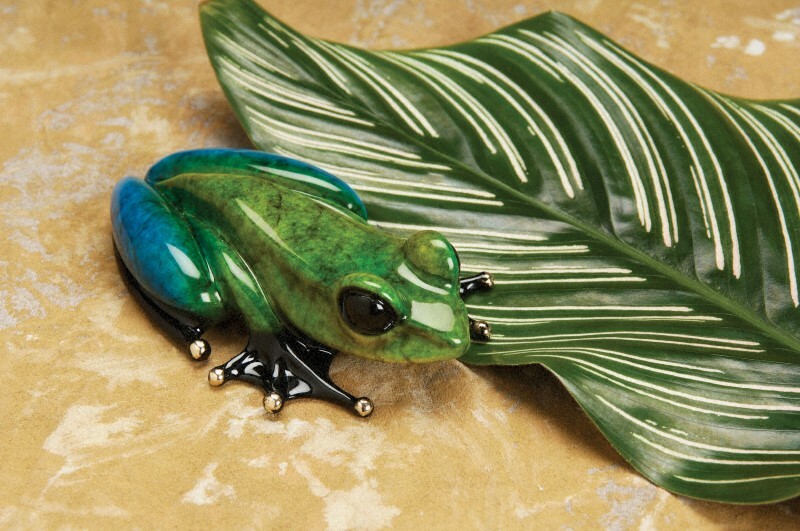 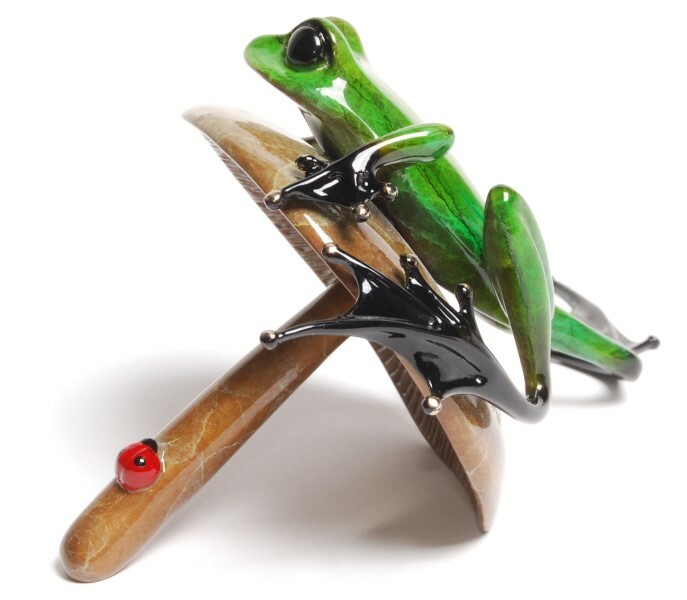 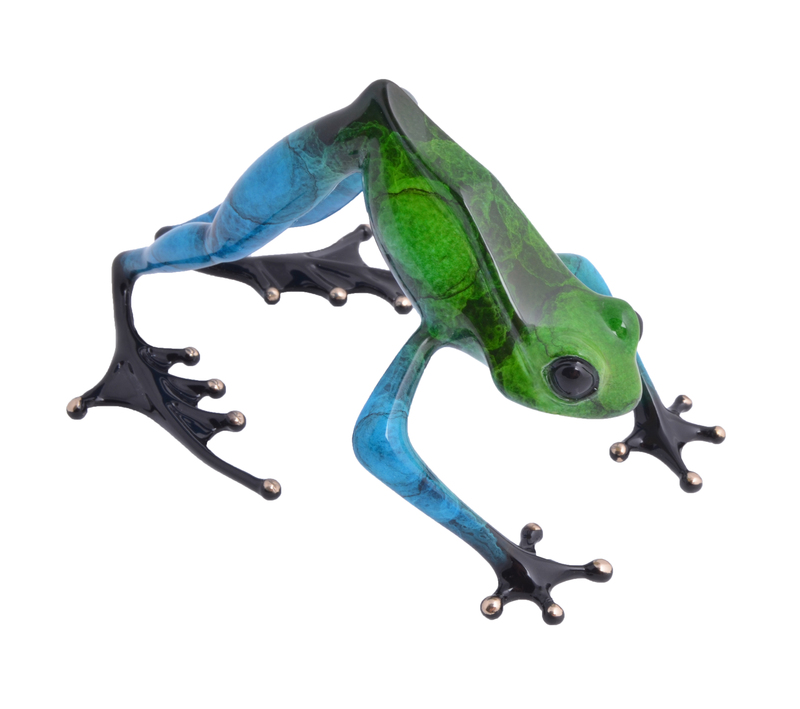 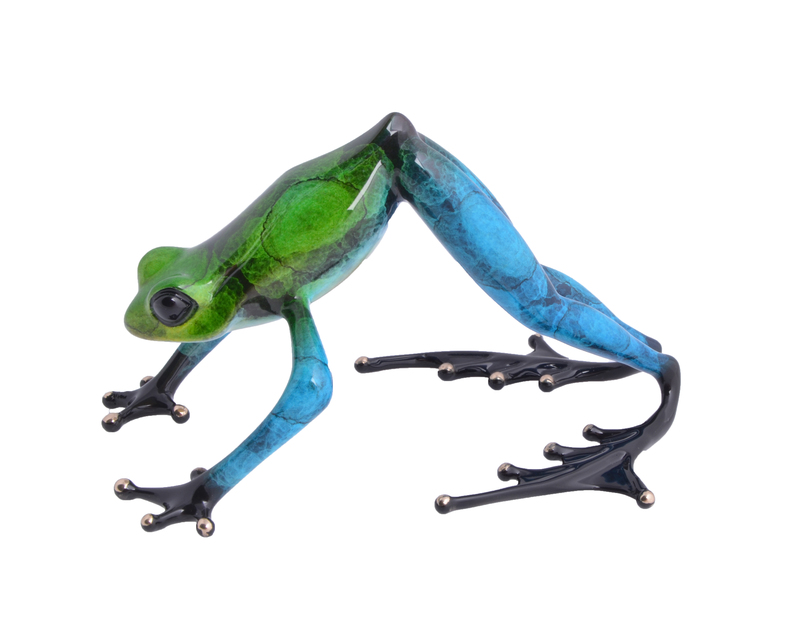 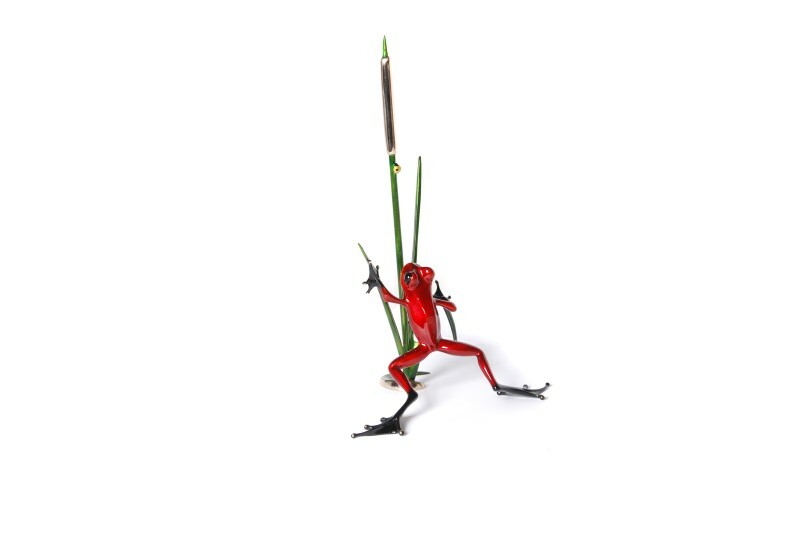 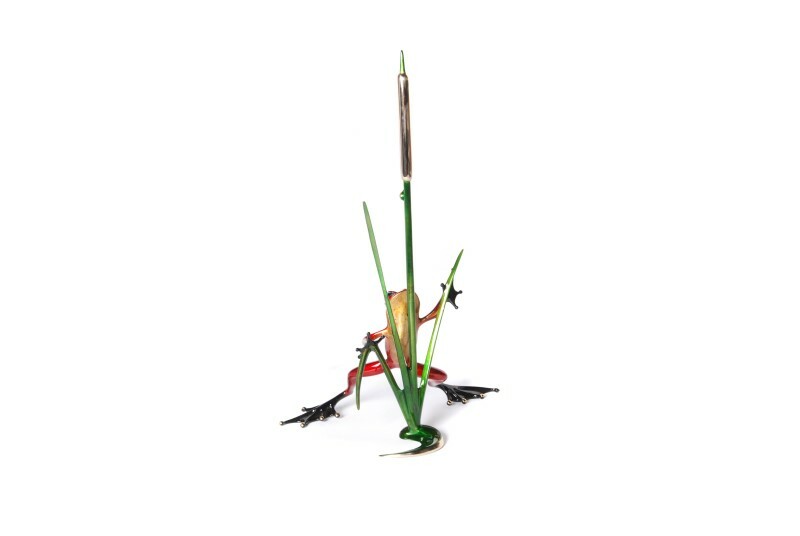 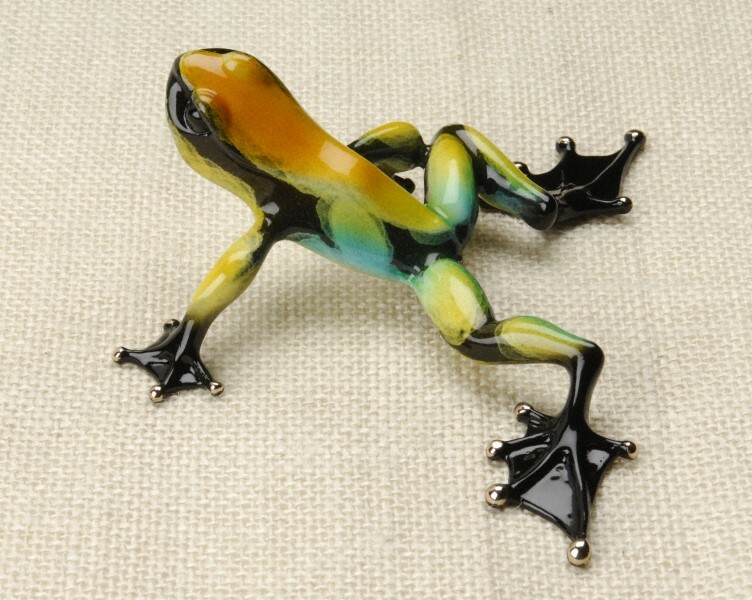 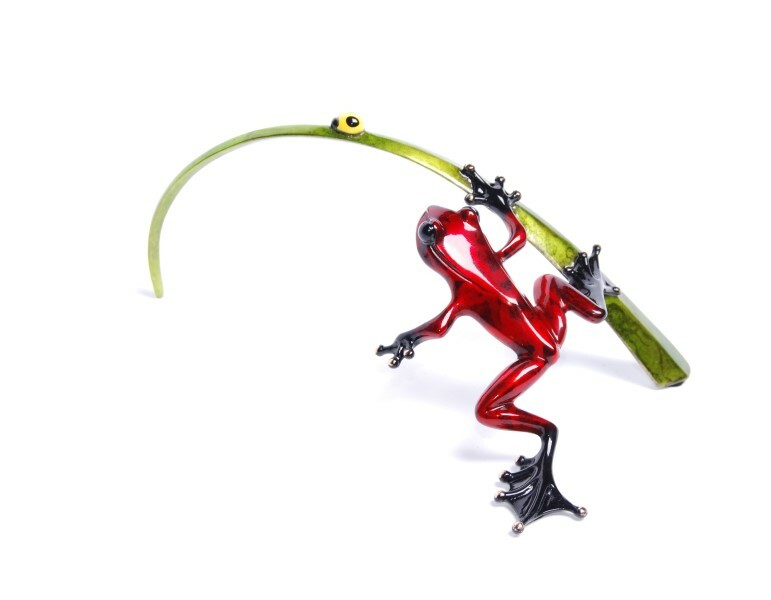 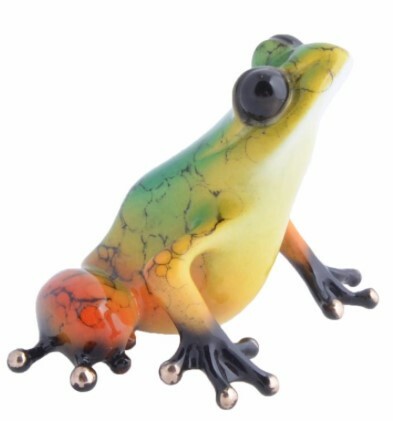 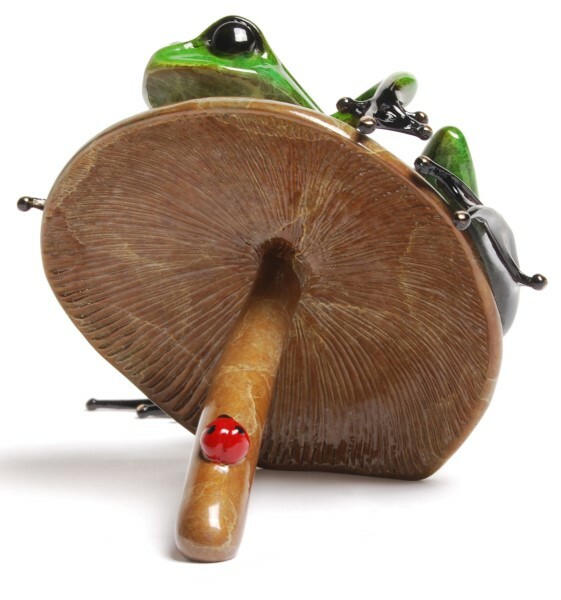 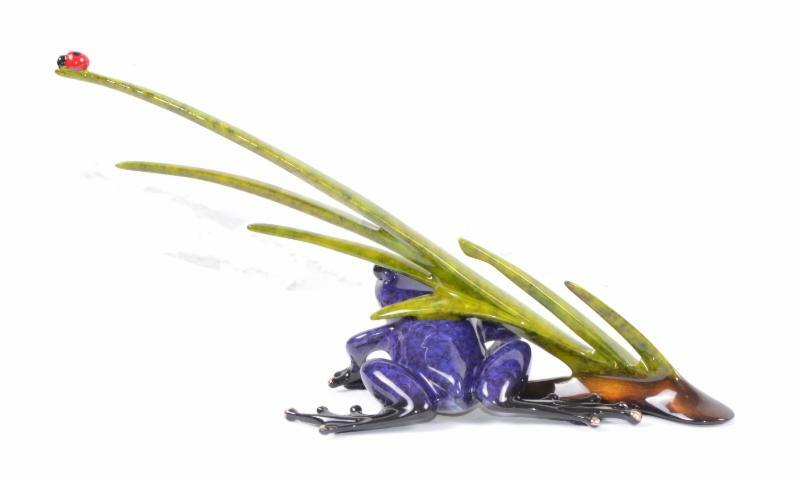 A striking, boldly patterned bi-colored frog clings to a textured green reed, cautiously contemplating his next move. 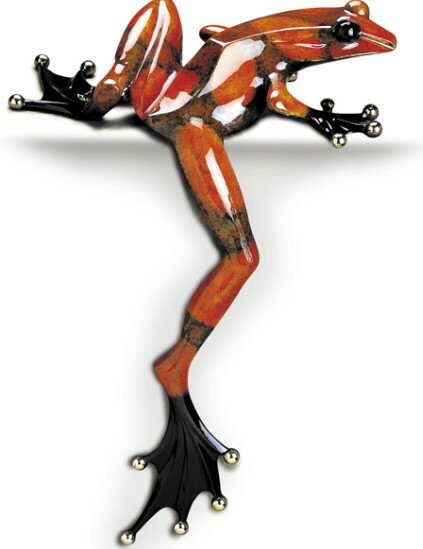 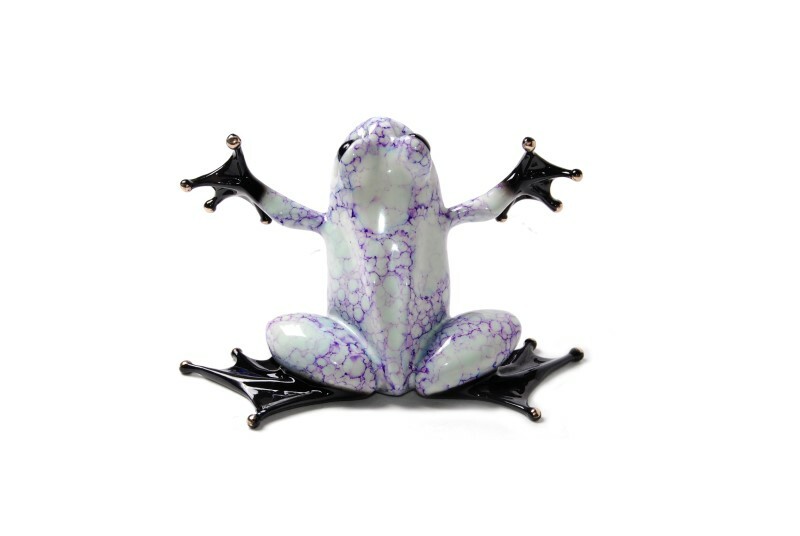 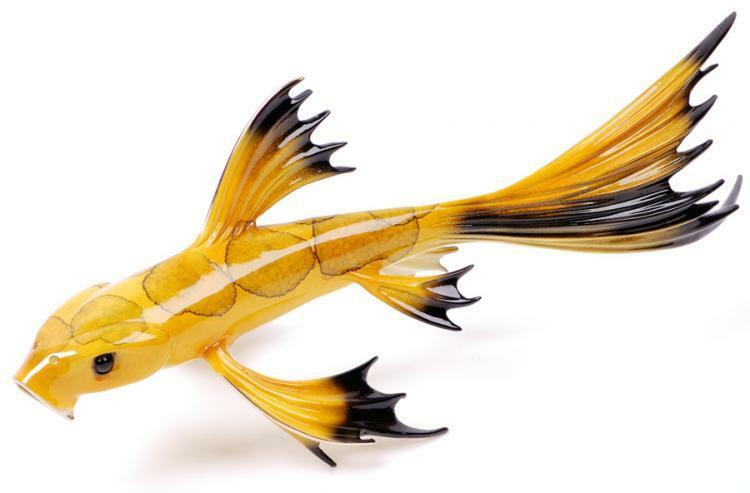 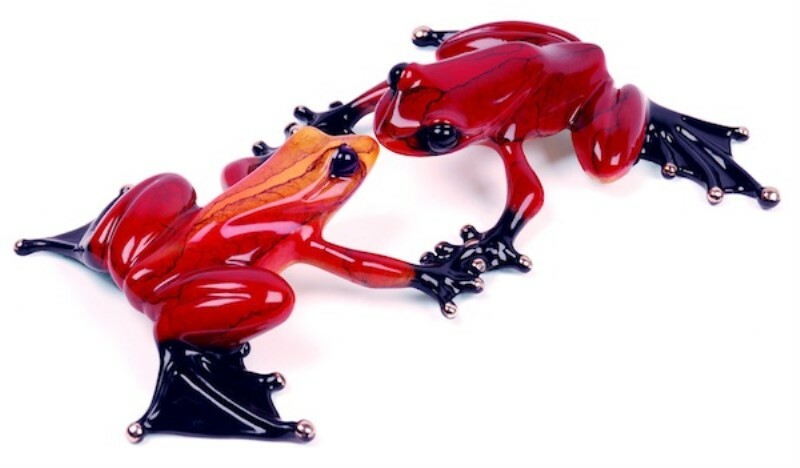 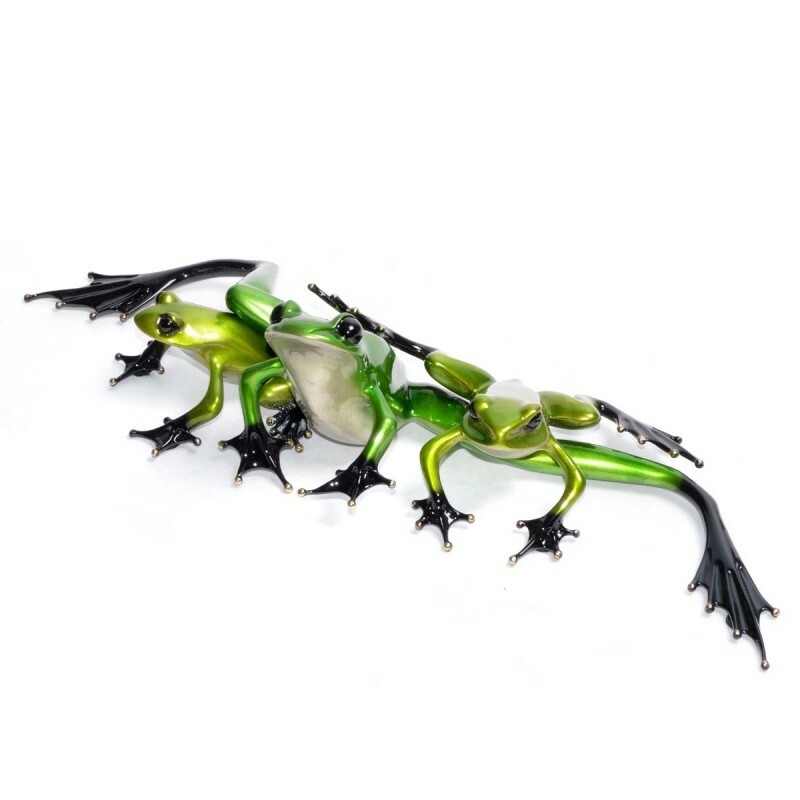 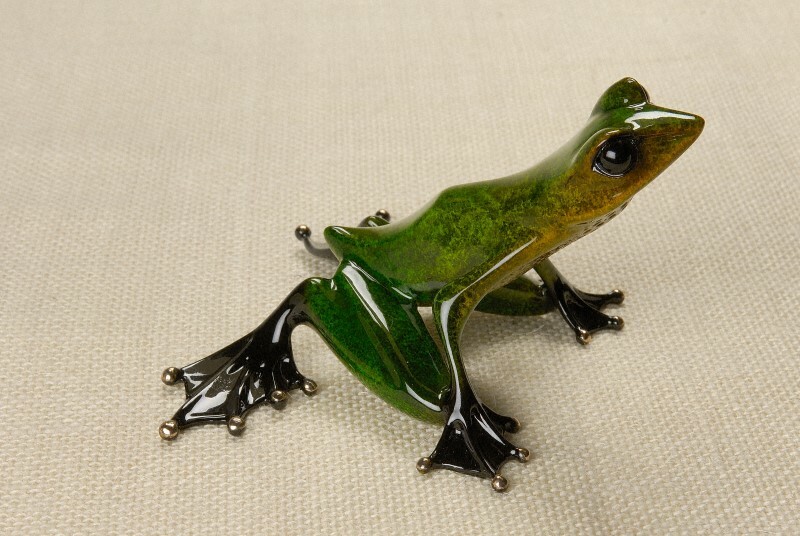 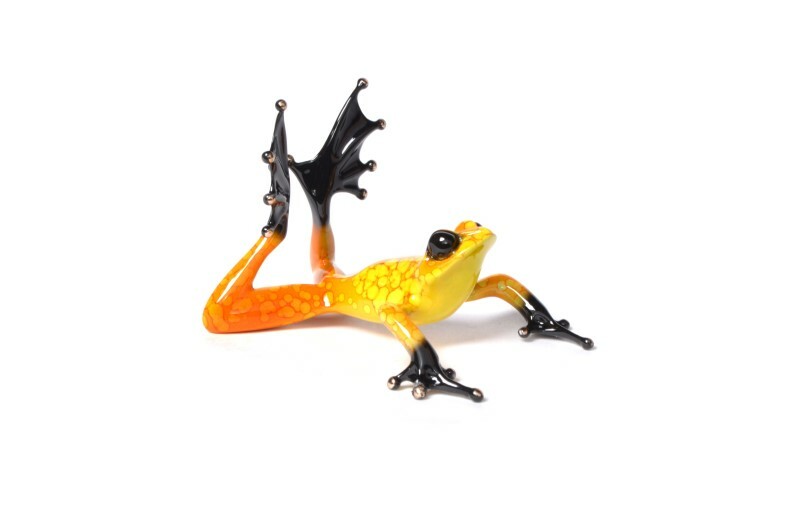 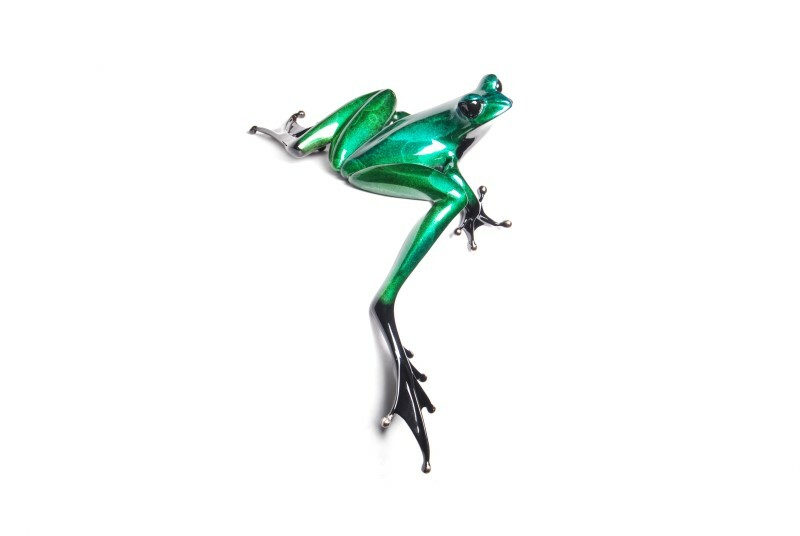 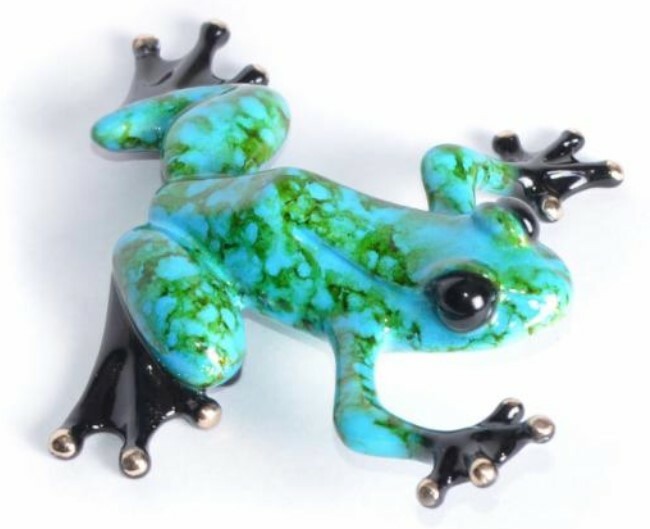 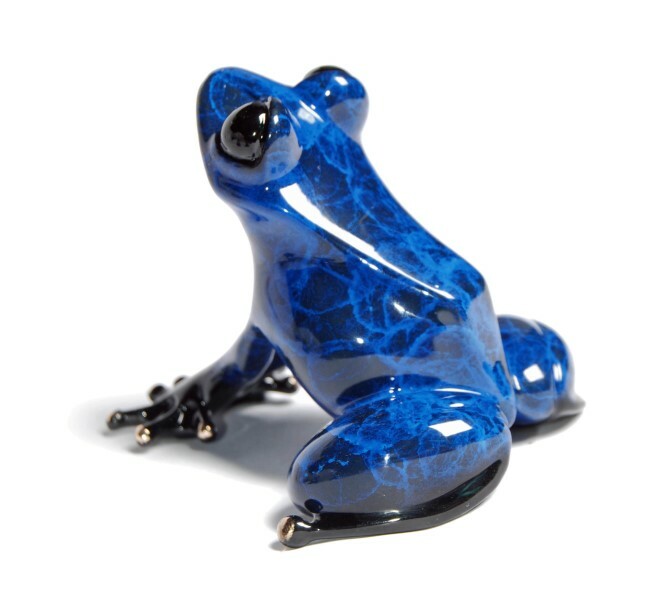 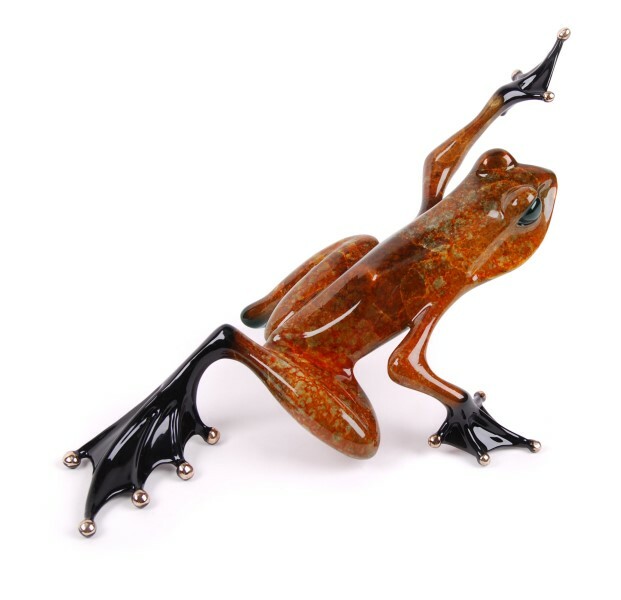 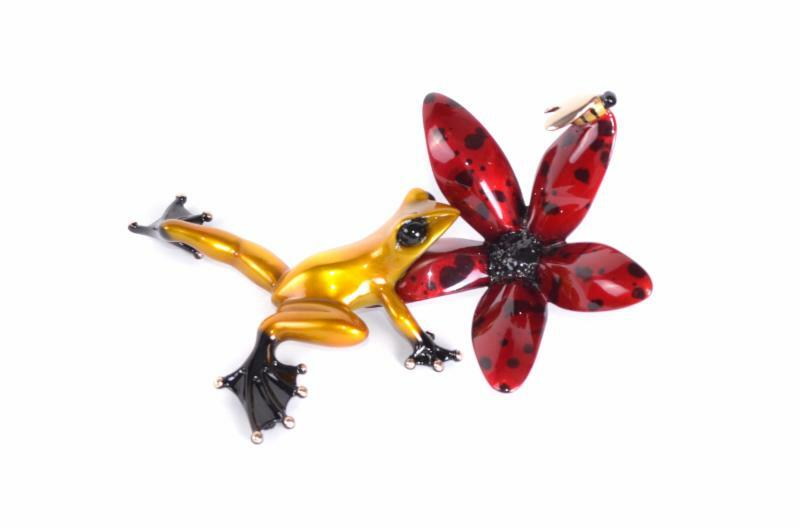 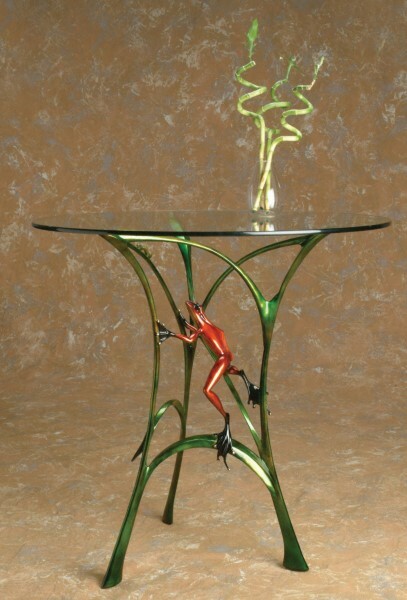 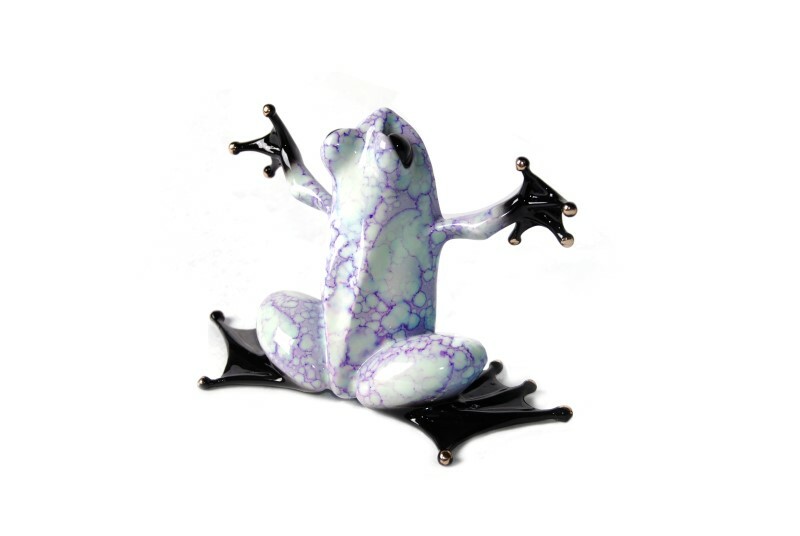 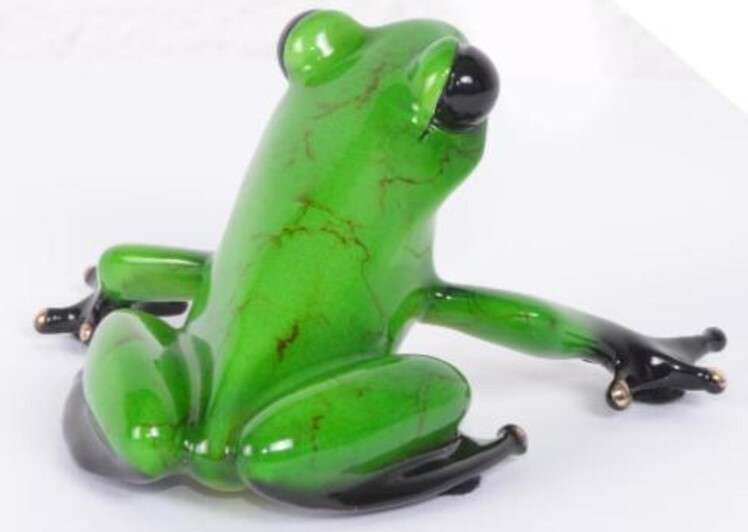 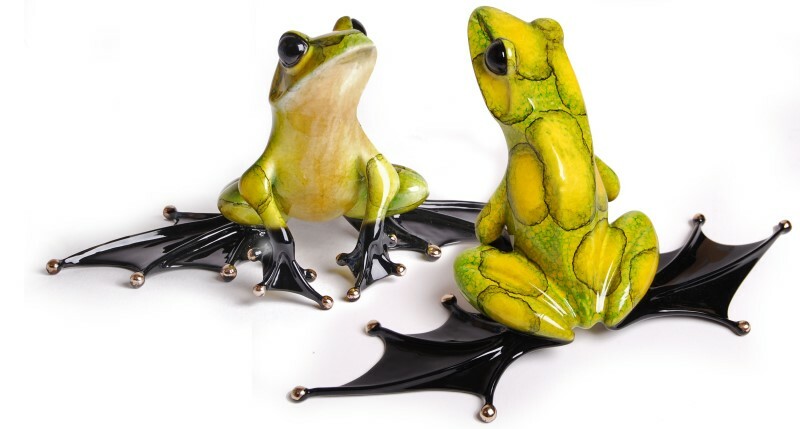 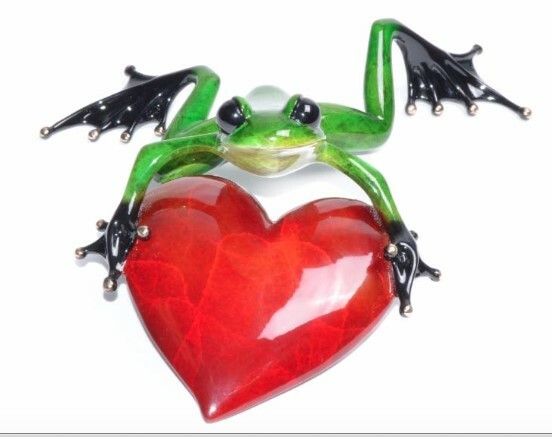 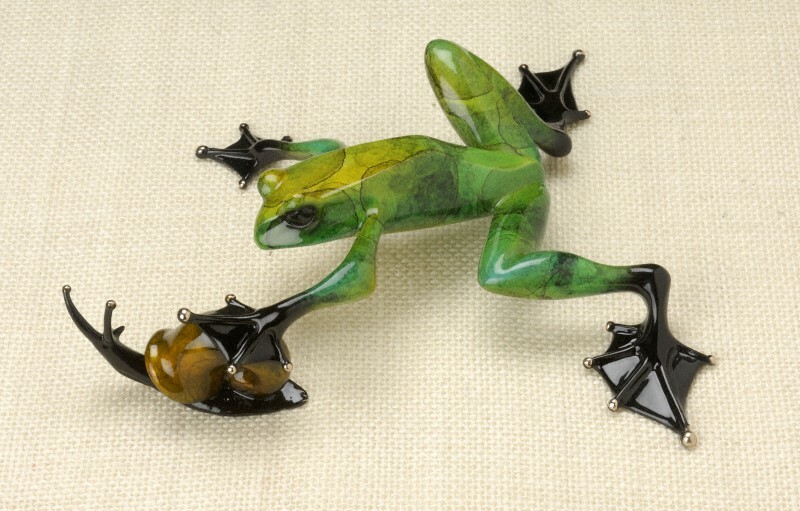 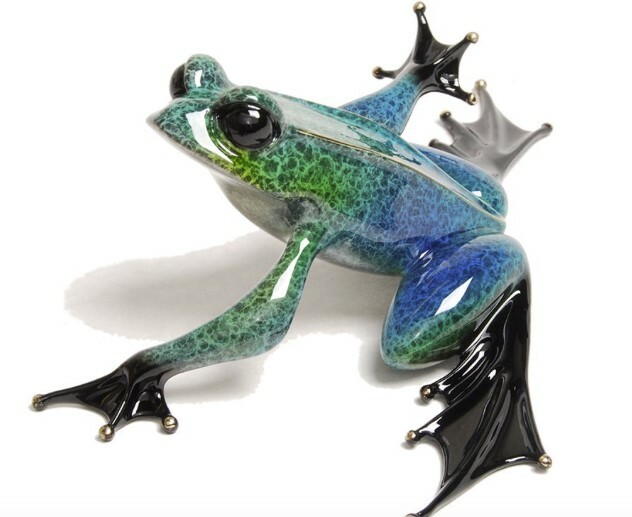 Frogman's "SPOT ON"- a classic case of art imitating life! 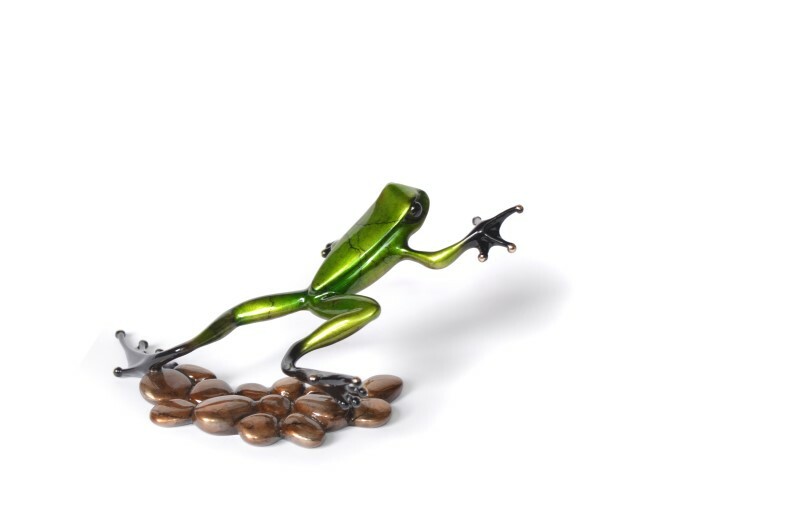 8.5" X 5.25" X 3.25"
The Frogman | Sprout | Limited Edition Bronze Sculpture with Patina Finish,Edition of 5000 | 8.5" X 5.25" X 3.25"
20" X 10.5" X 12"
The Frogman | Stag's Leap - Dark Antler | Limited Edition Bronze Sculpture with Patina Finish, Edition of 150 | 20" X 10.5" X 12"
The Frogman | Stag's Leap- Light Antler | Limited Edition Bronze Sculpture with Patina Finish, Edition of 150 | 20" X 10.5" X 12"
The Frogman | Stakeout | Limited Edition Bronze Sculpture with Patina Finish, Edition of 1000 | 11.5" X 7" X 5.25"
18" X 6" X 3"
The Frogman | Stealth | Limited Edition Bronze Sculpture with Patina Finish,Edition of 5000 | 18" X 6" X 3"
4.5" X 4.25" X 2.5"
The Frogman | Stepping Stone | Limited Edition Bronze Sculpture with Patina Finish, Edition of 5000 | 4.5" X 4.25" X 2.5"
The Frogman | Strata | Limited Edition Bronze Sculpture with Patina Finish | 0" X 0"
3.5" X 3" X 2.25"
The Frogman | Sunbather | Limited Edition Bronze Sculpture with Patina Finish, Edition of 5000 | 3.5" X 3" X 2.25"
1.75" X 5.5" X 6.5"
The Frogman | Sunflower | limited edition bronze sculpture with patina finish, Edition of 1000 | 1.75" X 5.5" X 6.5"
Spring comes early with Tim Cotterill's 11th release in the much anticipated Mother's Day flower sculpture series. 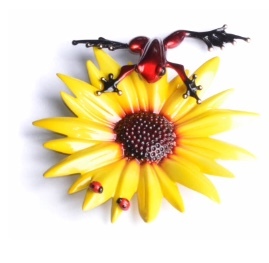 Sunflower is sure to shine bright among your collection. 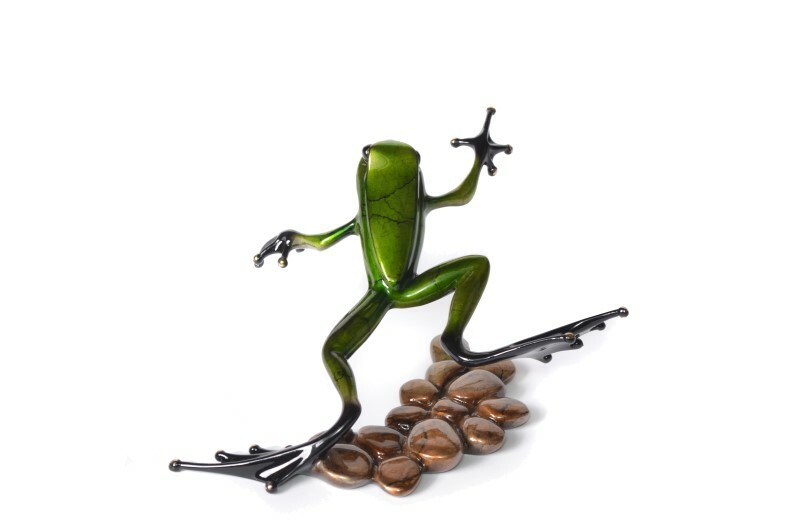 1" X 8" X 6.5"
The Frogman | Tag | Limited Edition Bronze Sculpture with Patina Finish,Edition of 2500 | 1" X 8" X 6.5"
0.5" X 6.25" X 1.5"
The Frogman | Tahiti | Limited Edition Bronze Sculpture with Patina Finish | 0.5" X 6.25" X 1.5"
13.25" X 7" X 2"
The Frogman | Taking Flight | Limited Edition Bronze Sculpture with Patina Finish, Edition of 1000 | 13.25" X 7" X 2"
3" X 2" X 2.75"
The Frogman | Tea Garden | Limited Edition Bronze Sculpture with Patina Finish, Edition of 1000 | 3" X 2" X 2.75"
15" X 5.5" X 2.5"
The Frogman | The Hunt | Limited Edition Bronze Sculpture with Patina Finish | 15" X 5.5" X 2.5"
0.75" X 5.75" X 3.5"
The Frogman | The Kiss | Limited Edition Bronze Sculpture with Patina Finish, Edition of 5000 | 0.75" X 5.75" X 3.5"
15" X 5.5" X 3"
The Frogman | Three's Company | Limited Edition Bronze Sculpture with Patina Finish, Edition of 350 | 15" X 5.5" X 3"
The Frogman | Toady | Limited Edition Bronze Sculpture with Patina Finish,Edition of 5000 | 6.25" X 5" X 3"
The Frogman | Tortola | Limited Edition Bronze Sculpture with Patina Finish | 0.5" X 6.25" X 1.5"
17.75" X 14.75" X 5.75"
The Frogman | Treasure Hunt | Limited Edition Bronze Sculpture with Patina Finish, Edition of 500 | 17.75" X 14.75" X 5.75"
2.5" X 1.25" X 4"
The Frogman | Triangle Paperweight | Limited Edition Bronze Sculpture, Edition of 500 | 2.5" X 1.25" X 4"
10.25" X 21" X 12.25"
The Frogman | Turtle Creek | Limited Edition Bronze Sculpture with Patina Finish,Edition of 750 | 10.25" X 21" X 12.25"
1" X 4" X 3.5"
The Frogman | Twister | Limited Edition Bronze Sculpture with Patina Finish, Edition of 5000 | 1" X 4" X 3.5"
3.25" X 1.25" X 2"
The Frogman | Vertical Paperweight | Limited Edition Bronze Sculpture, Edition of 500 | 3.25" X 1.25" X 2"
The Frogman | Water Lily | Limited Edition Bronze Sculpture with Patina Finish, Edition of 2000 | 5.75" X 4.75" X 4.75"
11" X 8.5" X 3.5"
The Frogman | Water Lotus | Limited Edition Bronze Sculpture with Patina Finish, Edition of 750 | 11" X 8.5" X 3.5"
The Frogman | Whimsy | Limited Edition Bronze Sculpture with Patina Finish, Edition of 1000 | 7" X 3.5" X 3.75"
The Frogman | Willie Jump | Limited Edition Btronze Sculpture with Patina Finish, Edition of 500 | 0" X 0"
1" X 2.25" X 3.25"
The Frogman | Zen | Limited Edition Bronze Sculpture with Patina Finish, Edition of 5000 | 1" X 2.25" X 3.25"
2" X 5.75" X 4.5"
The Frogman | Zorro | Limited Edition Bronze Sculpture with Patina Finish,Edition of 2500 | 2" X 5.75" X 4.5"
The Frogman | Zest | Limited Edition Bronze Sculpture with Patina Finish, Edition of 1000 | 7" X 3.5" X 3.75"
The childhood adventures in the woods and streams of the English countryside were very influential in Tim Cotterill's development as an artist. 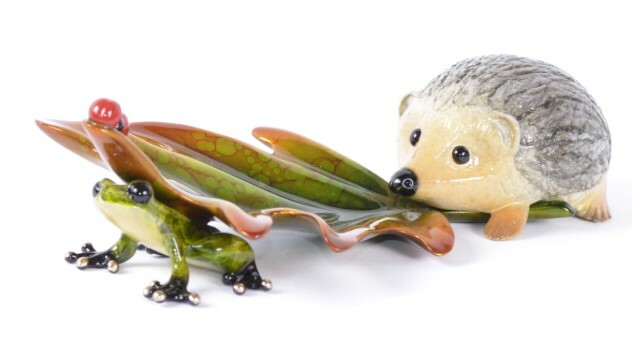 "This was the beginning of a life-long fascination with an animal whose nature and disposition would influence my own perspective on life and the joy to be found in it. 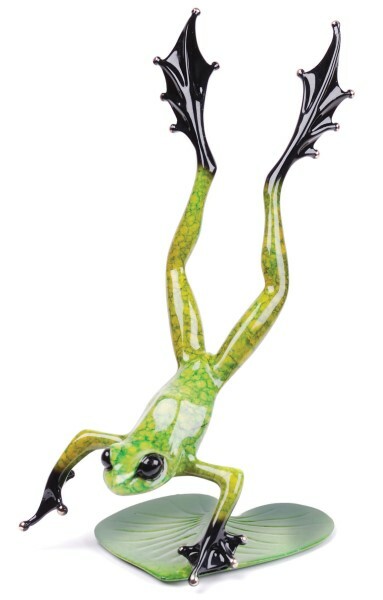 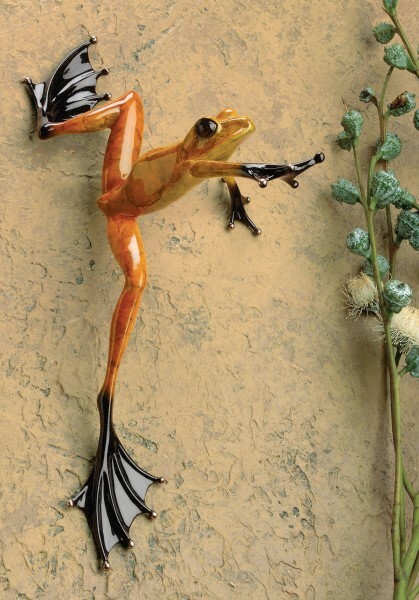 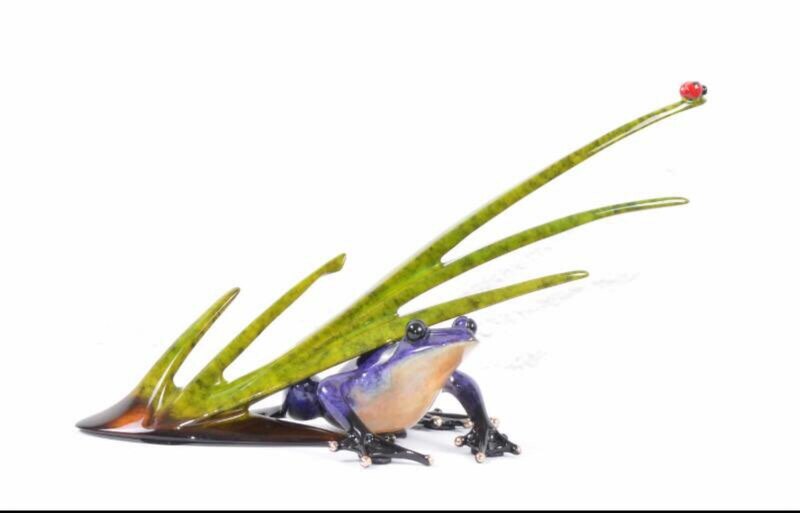 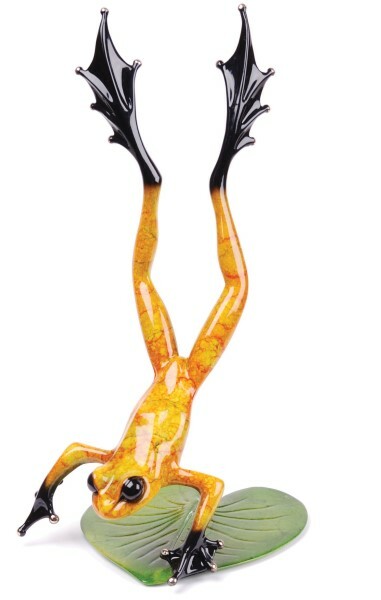 I didn't know then that I would someday be known as The Frogman." 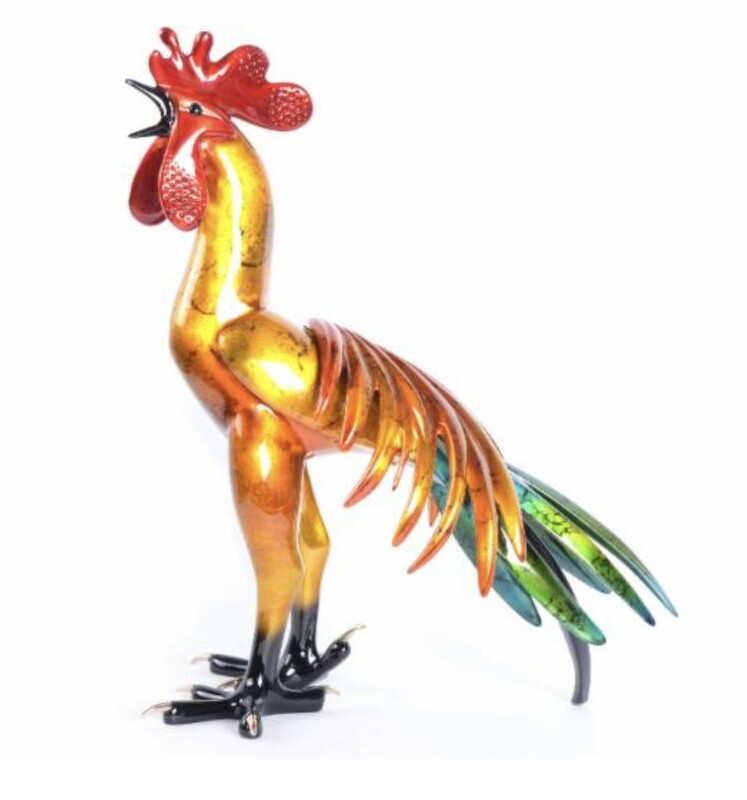 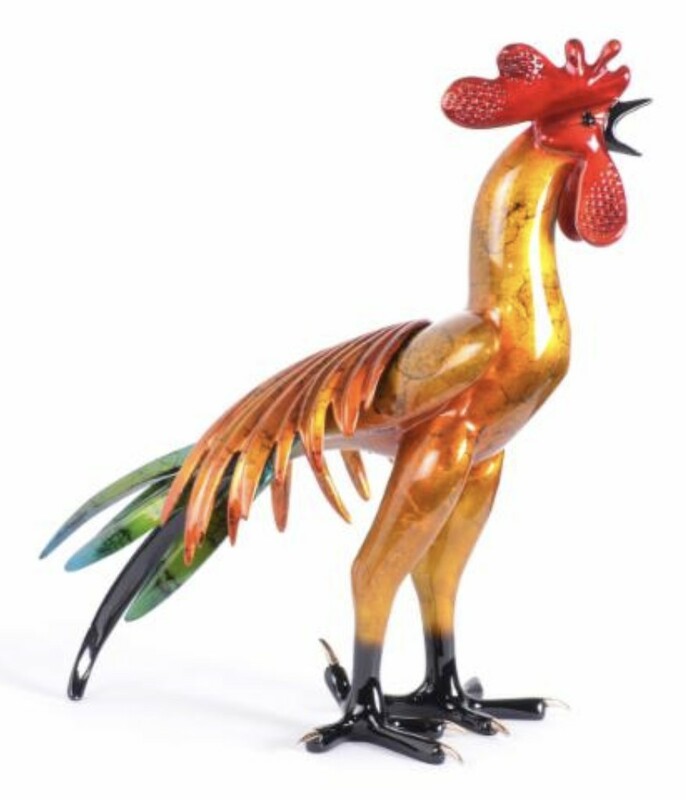 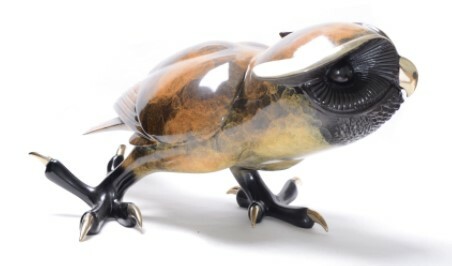 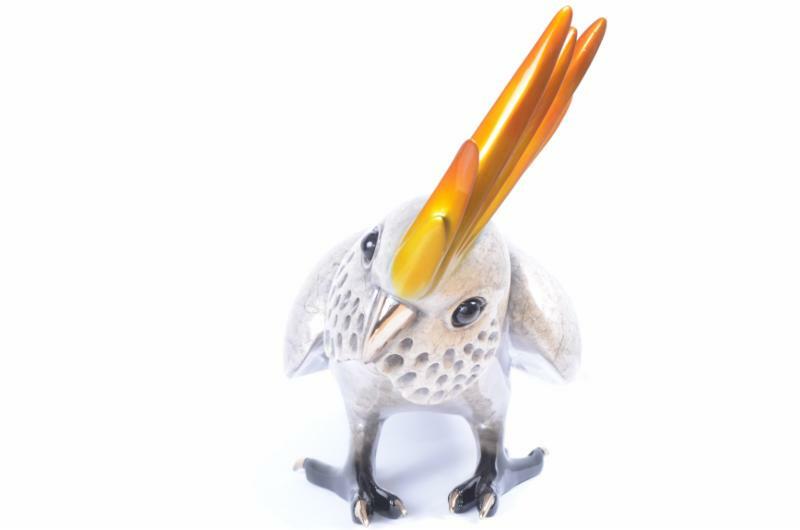 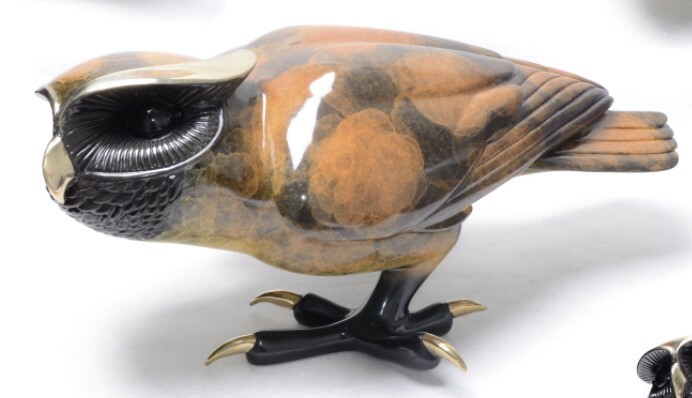 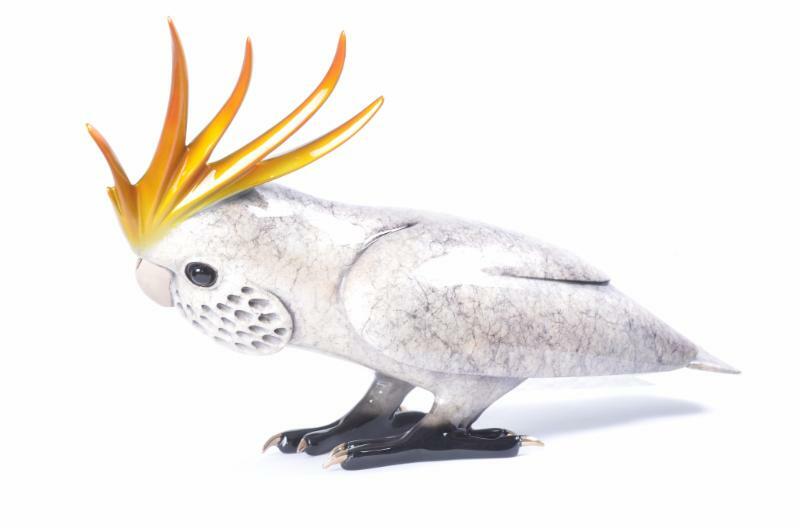 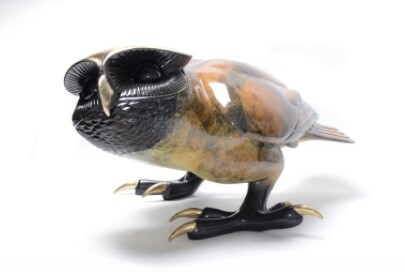 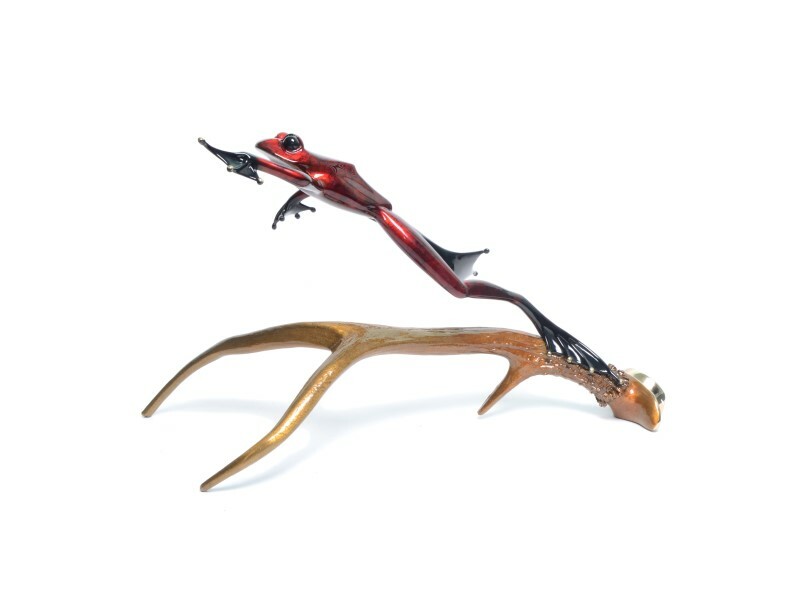 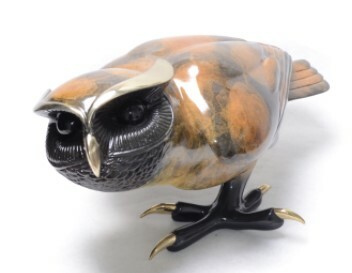 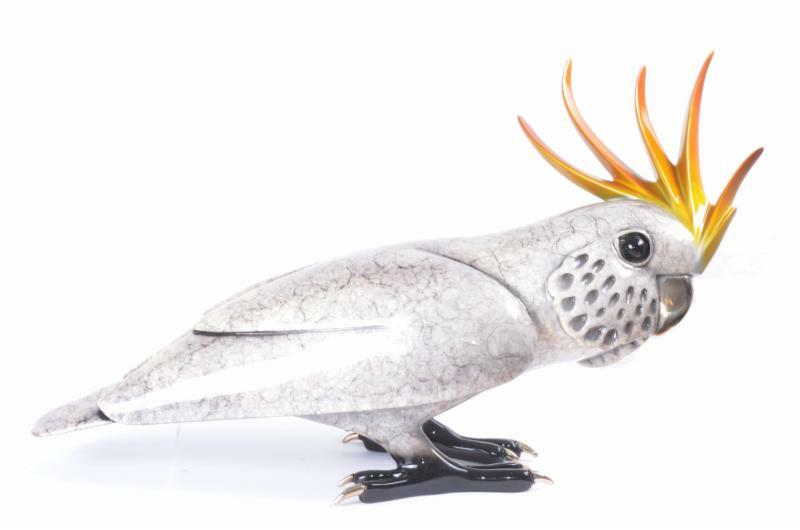 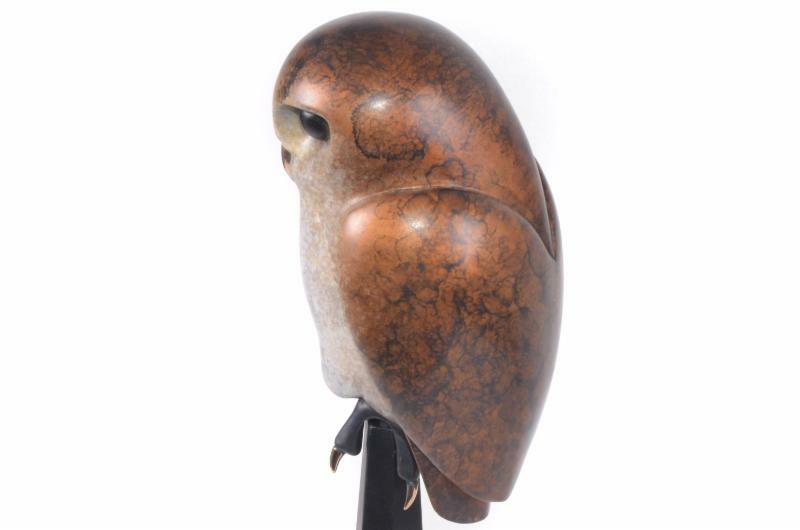 Tim began his life as an artist creating original steel, bronze and gold animal sculptures as well as an innovative collection of wheeled vehicles. 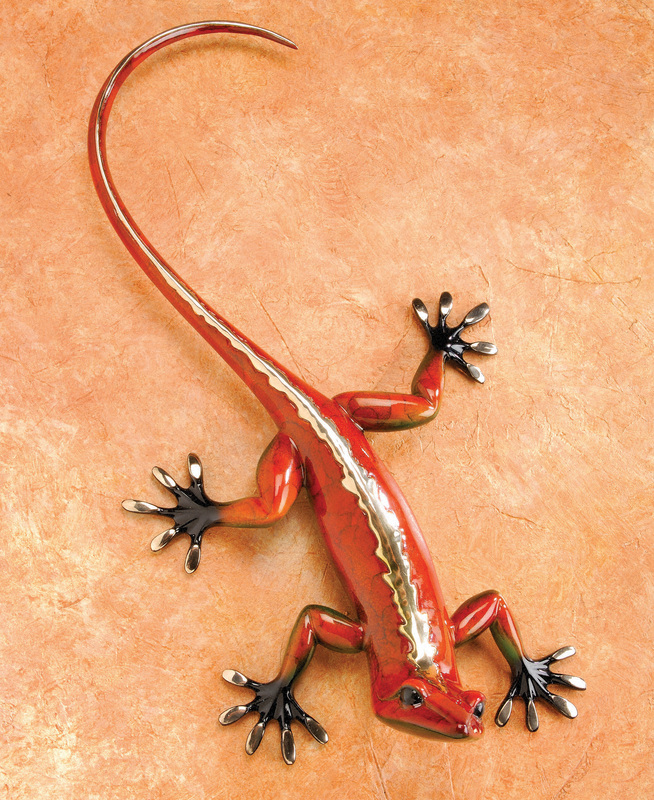 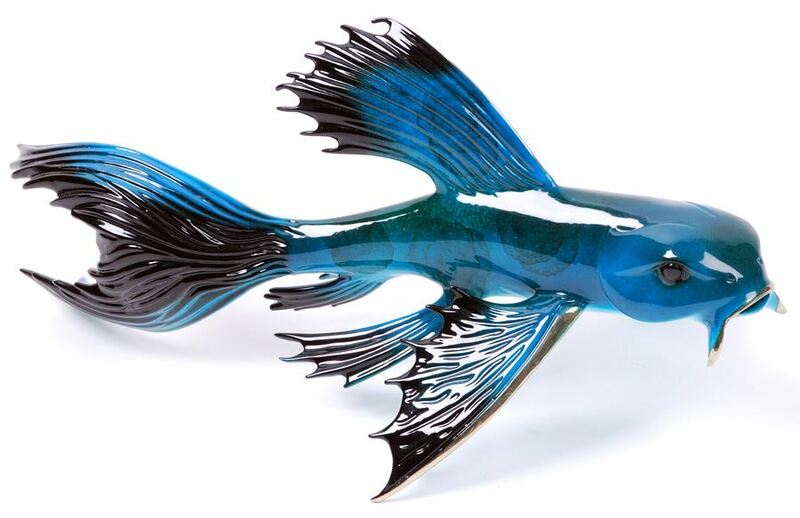 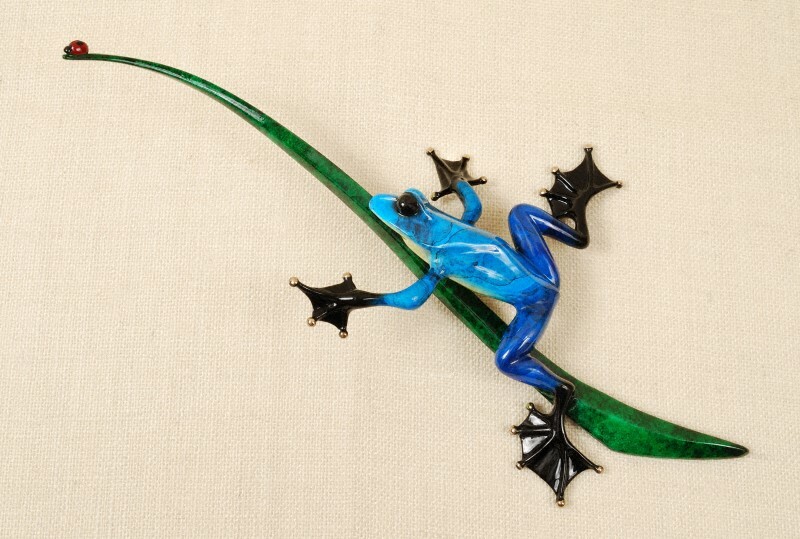 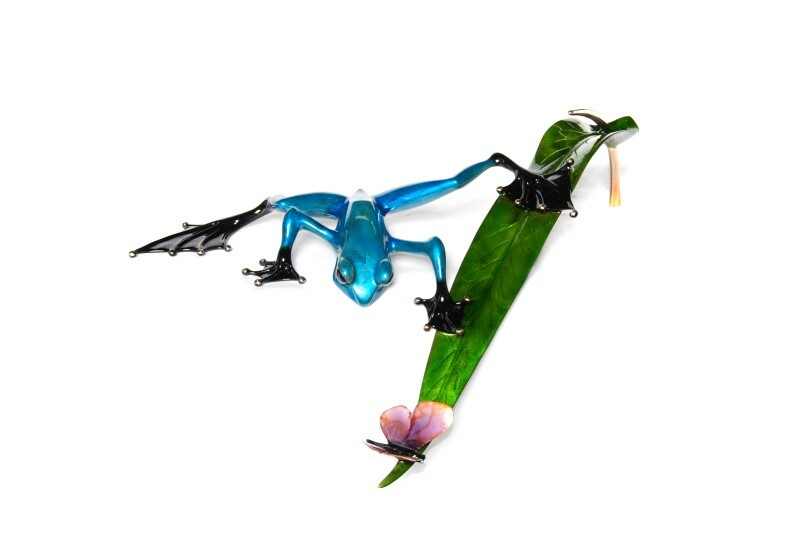 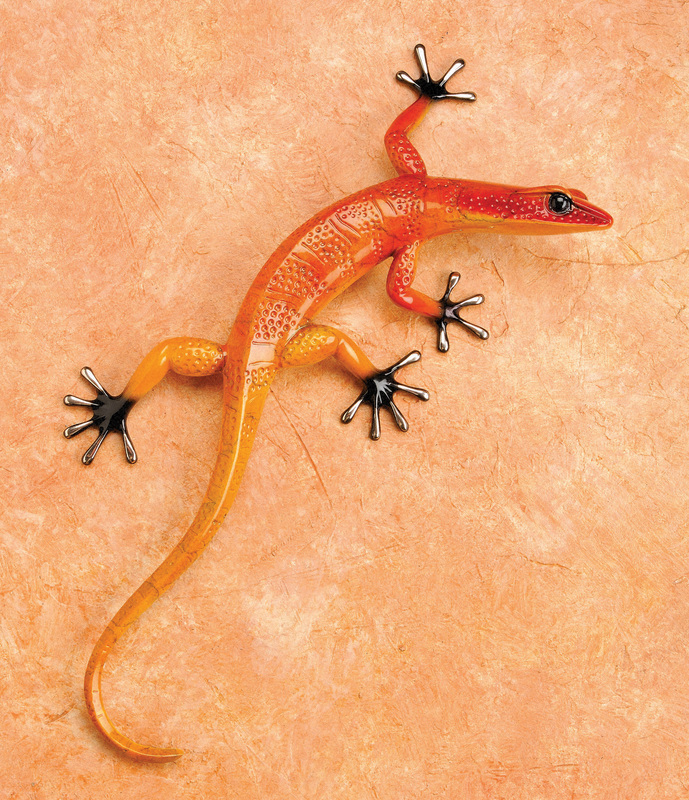 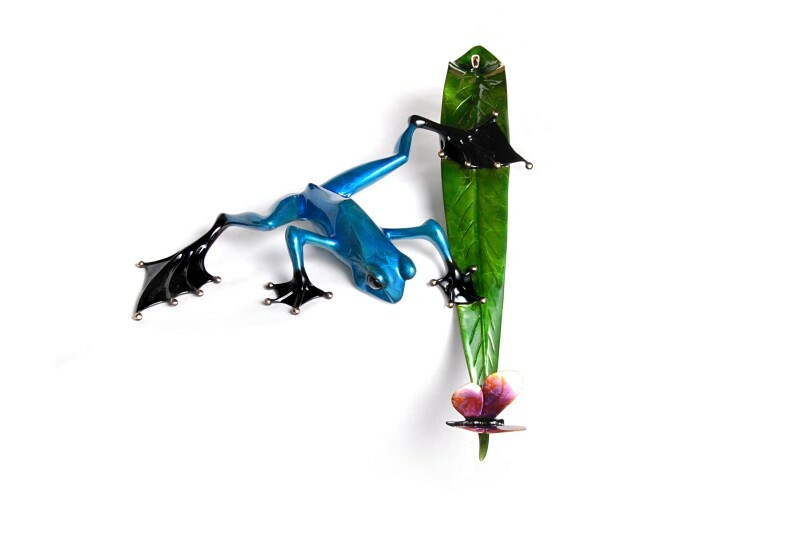 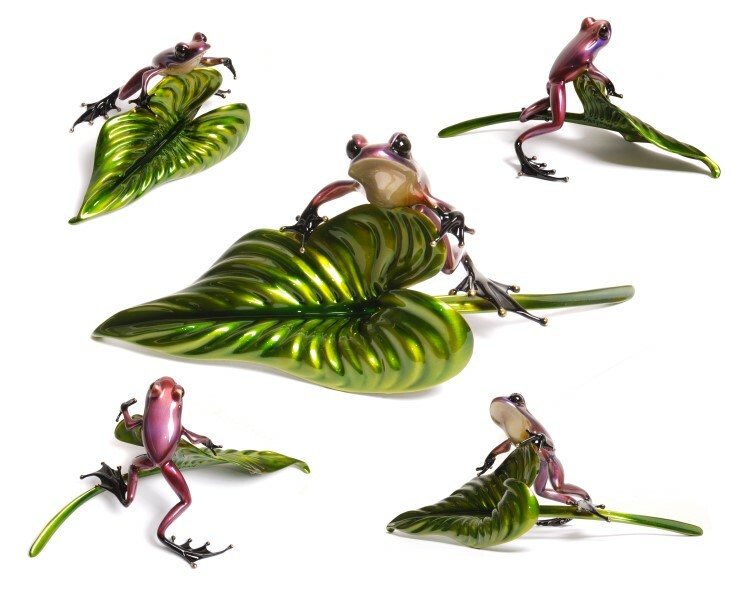 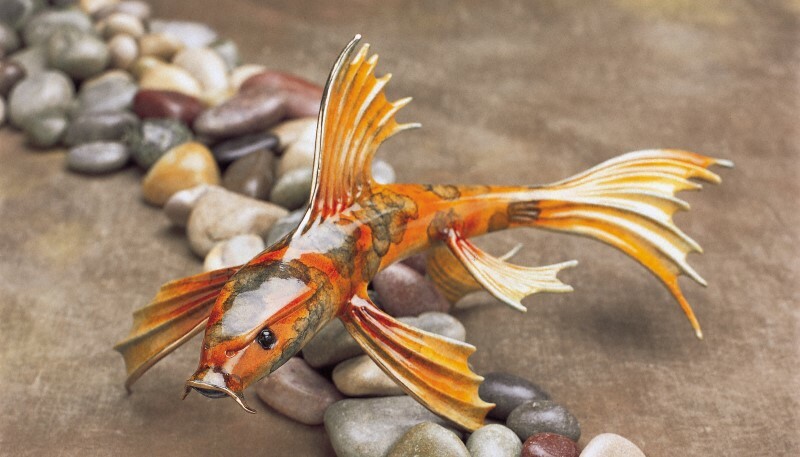 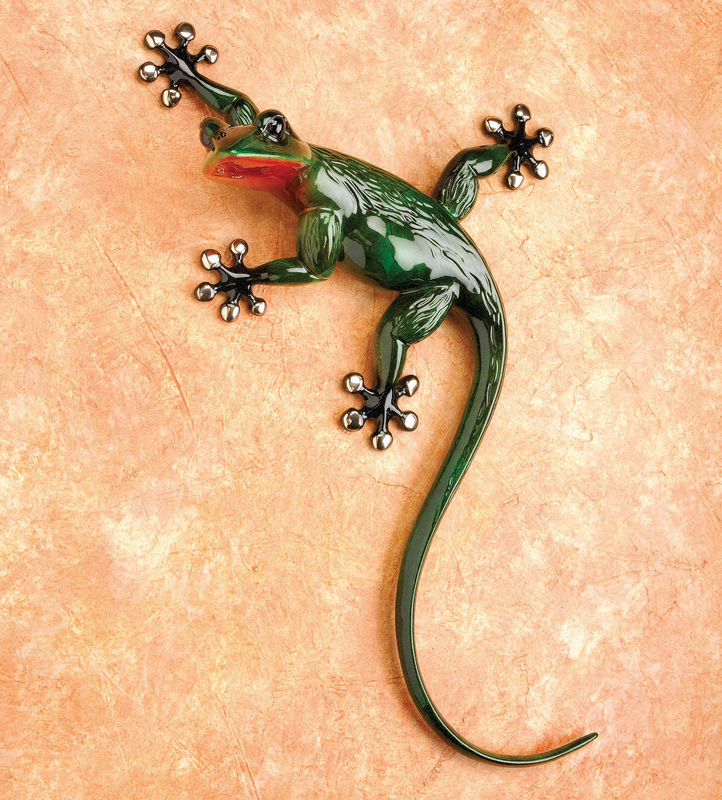 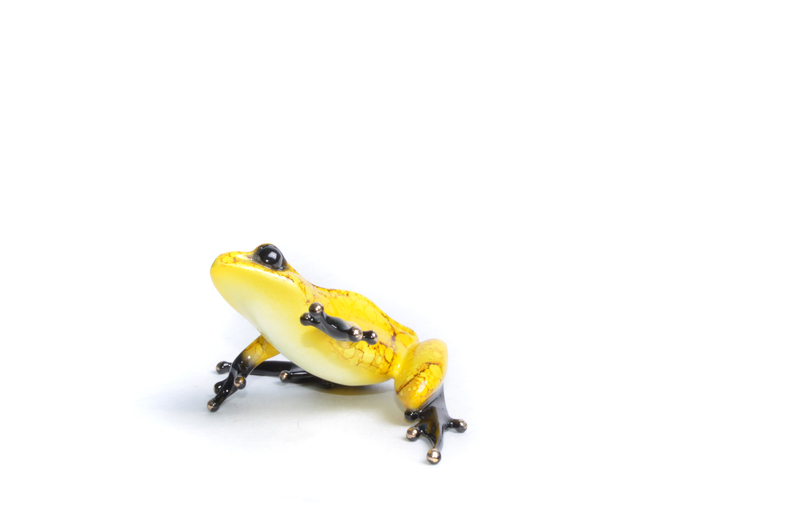 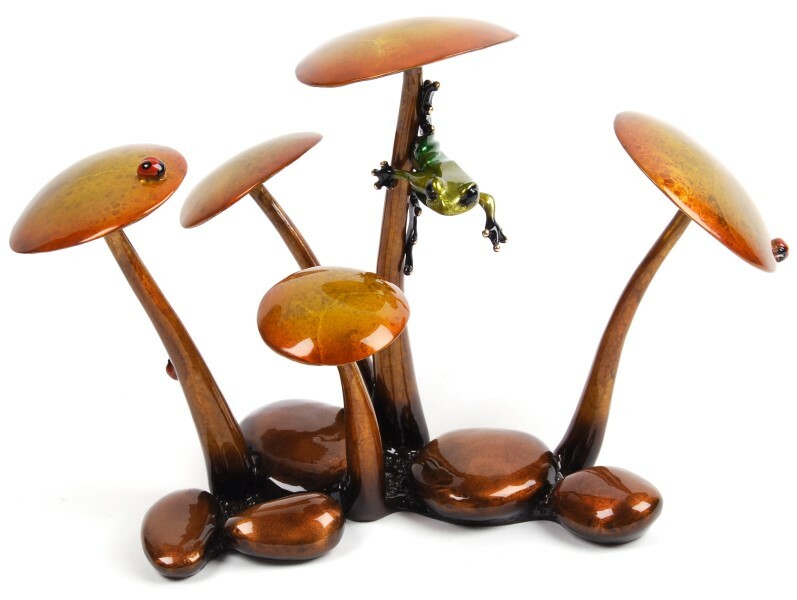 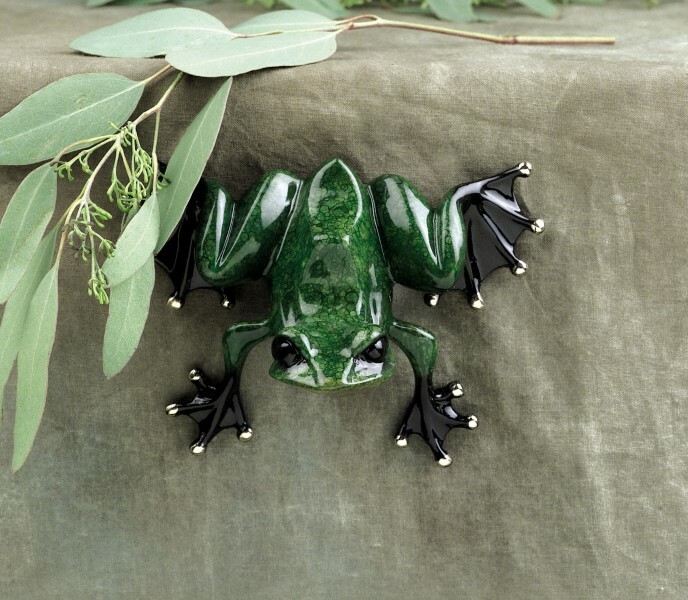 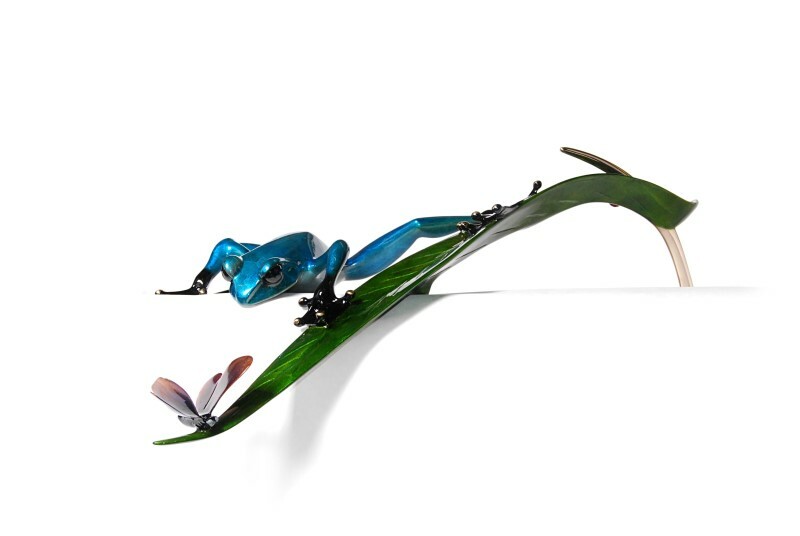 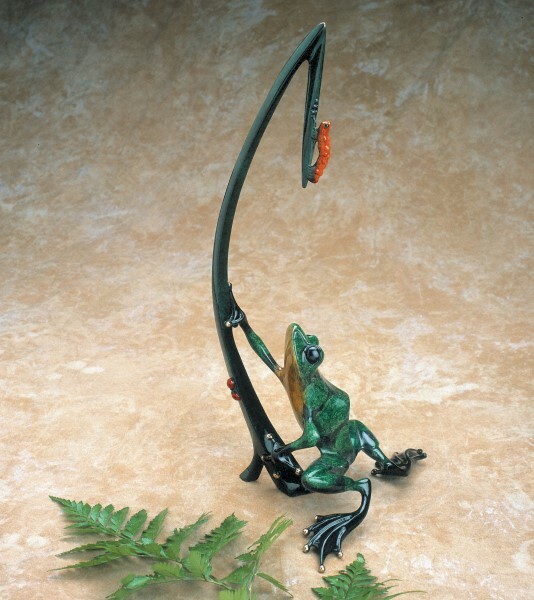 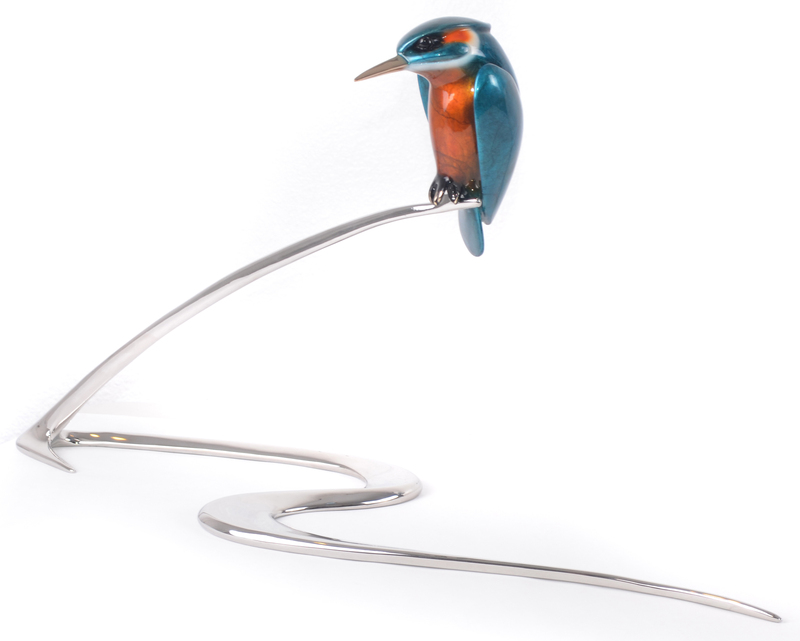 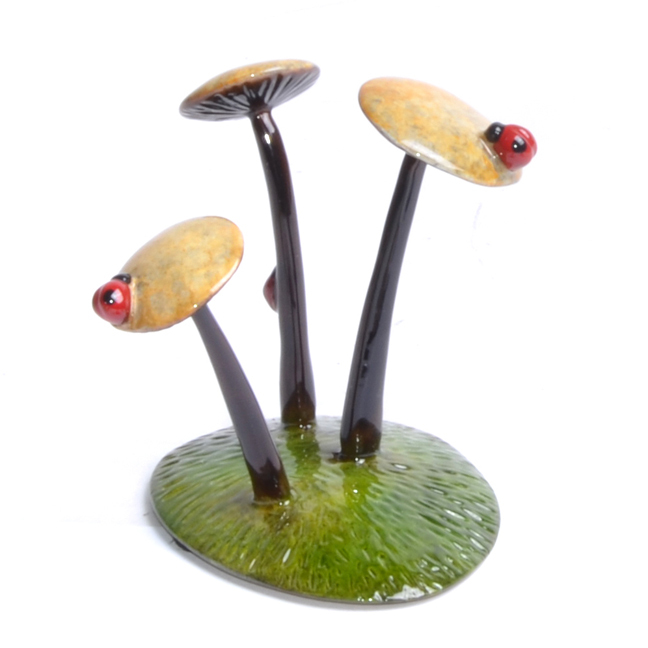 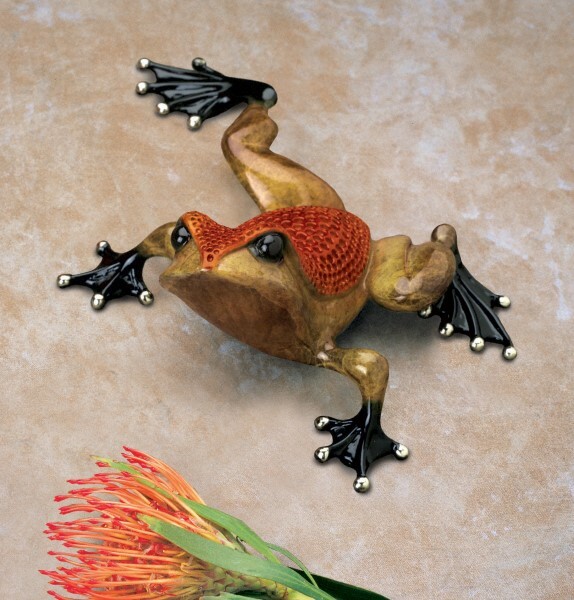 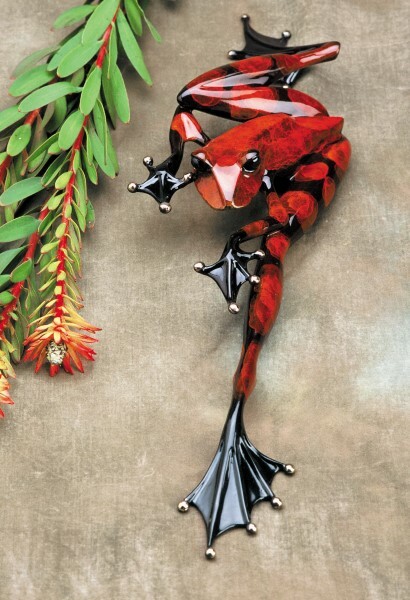 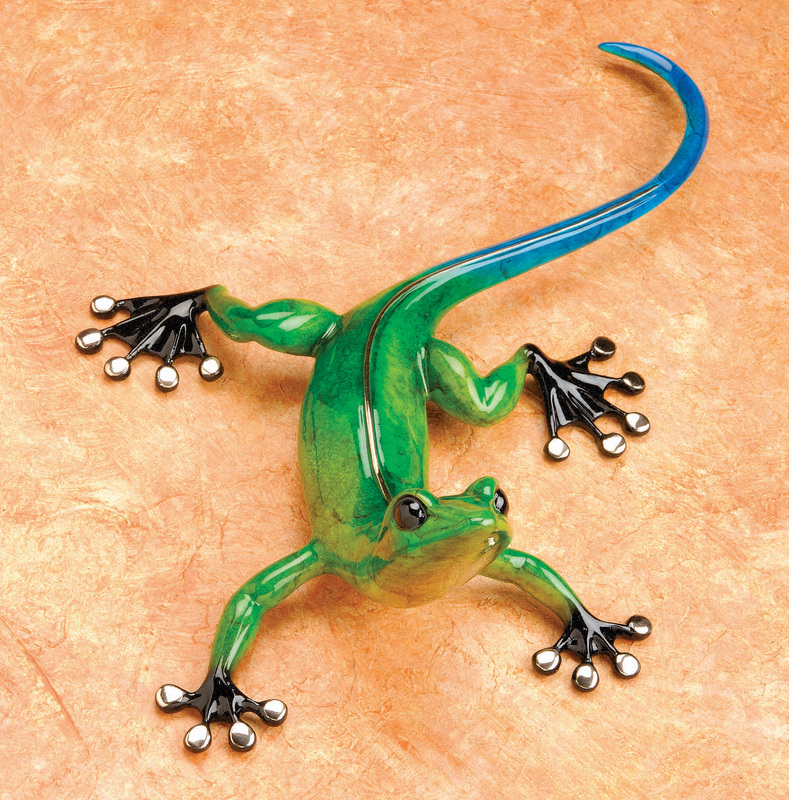 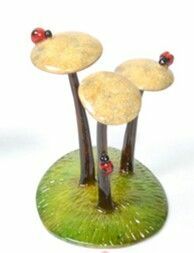 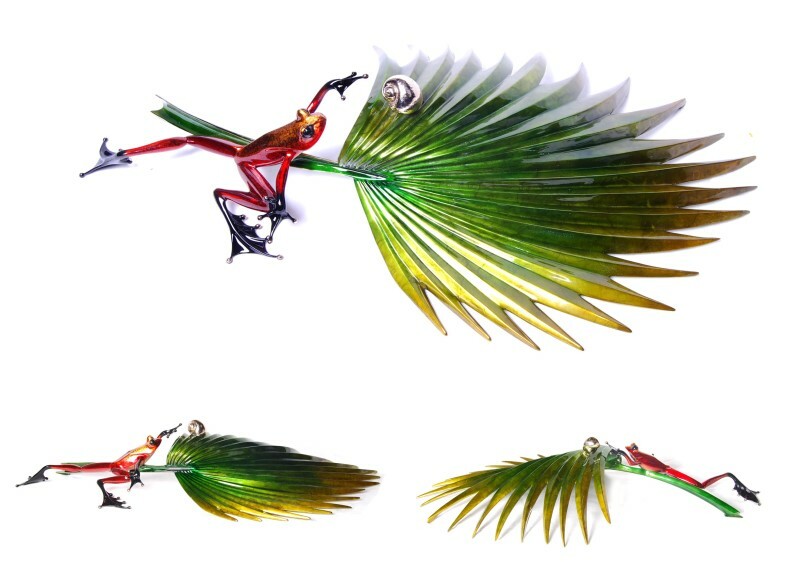 Tim moved to California in 1990 and built his Venice Beach studio, 'Paradise', complete with a frog and koi pond. 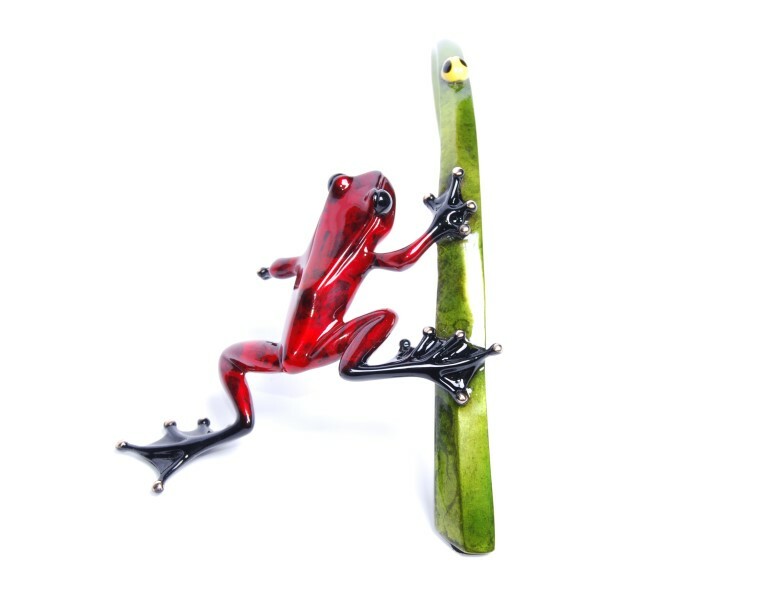 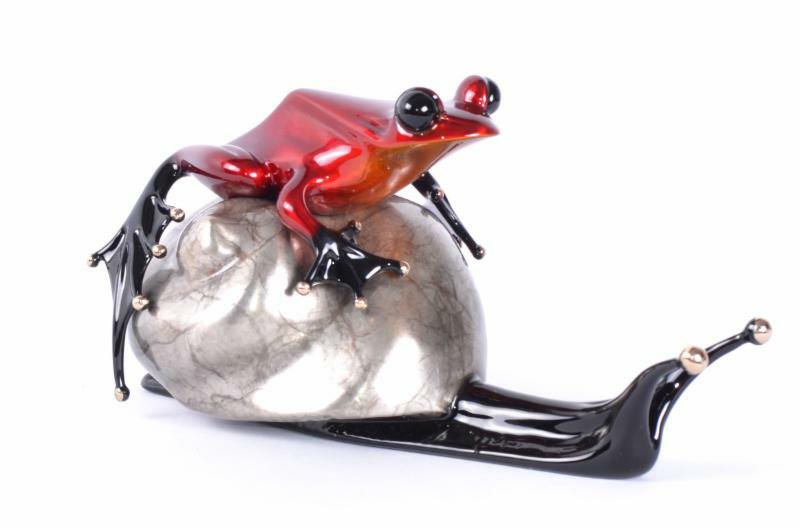 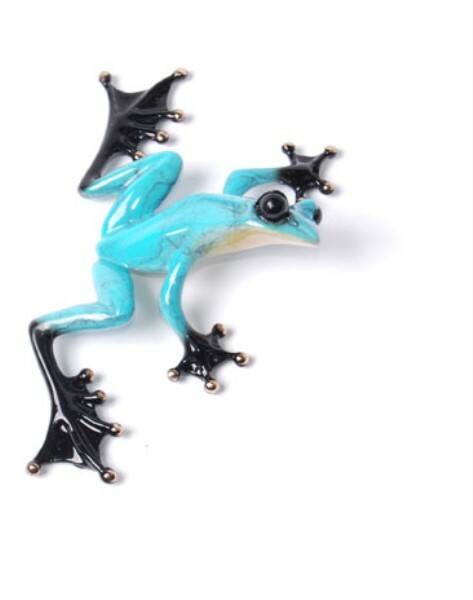 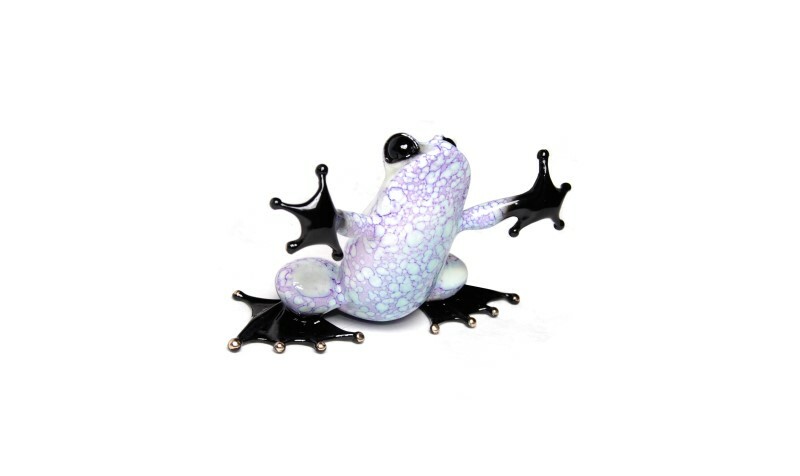 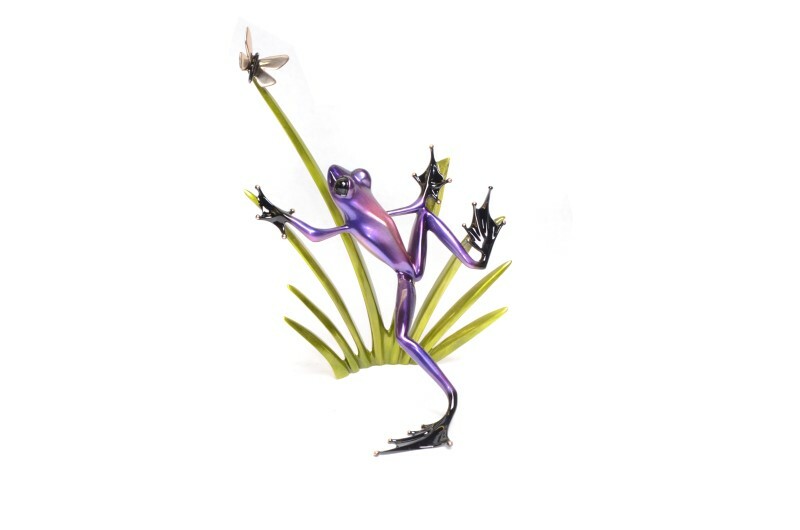 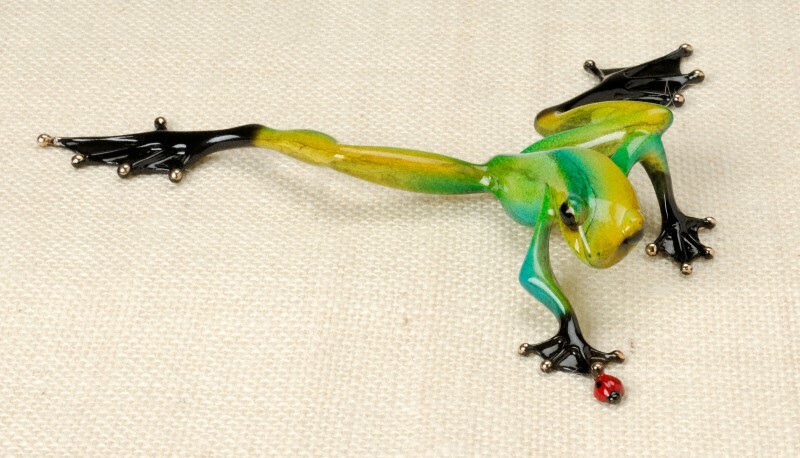 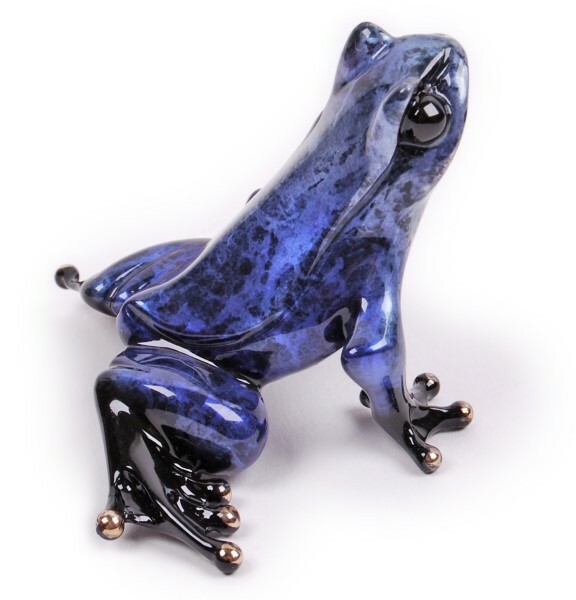 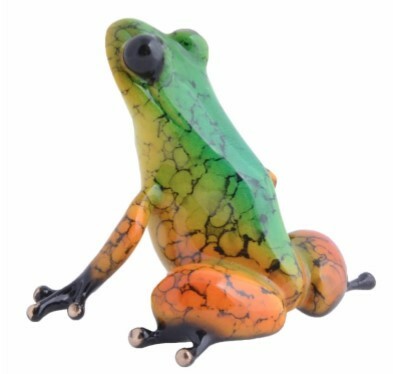 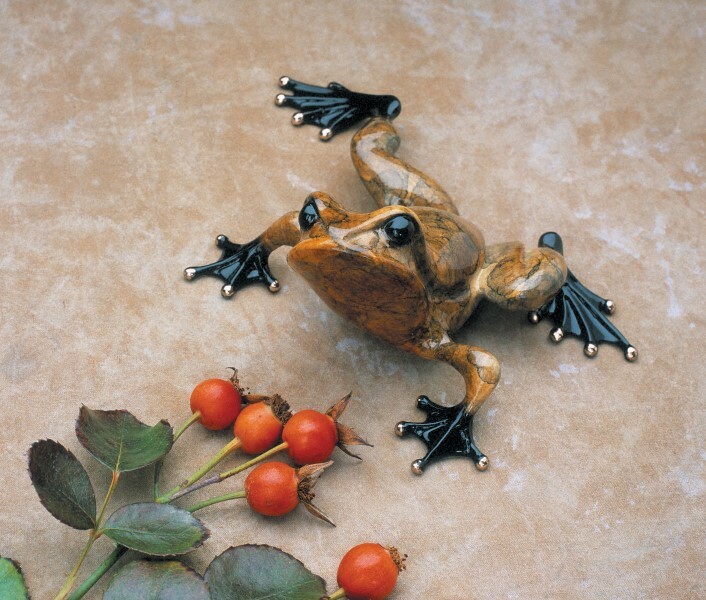 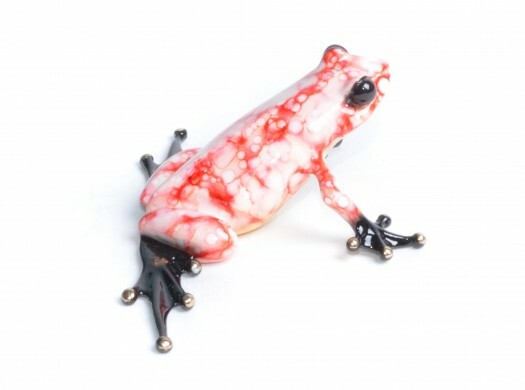 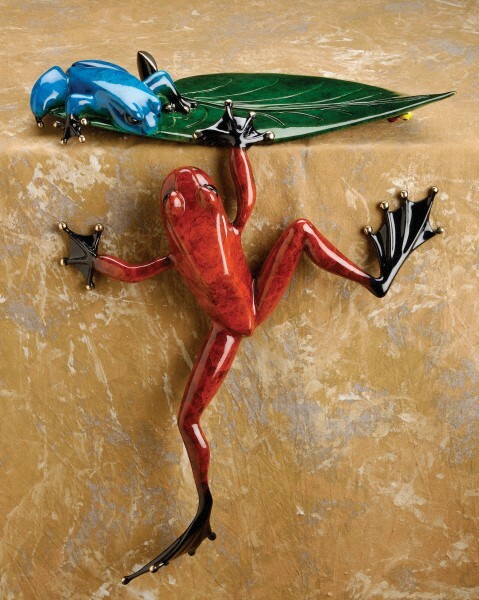 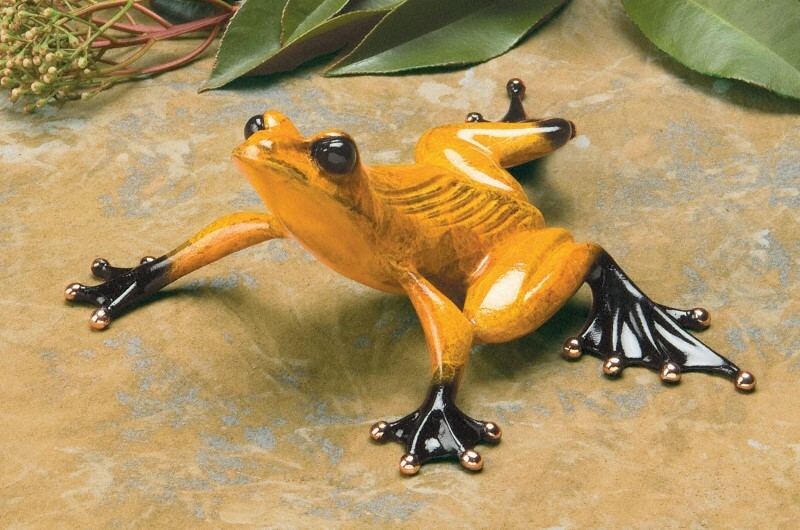 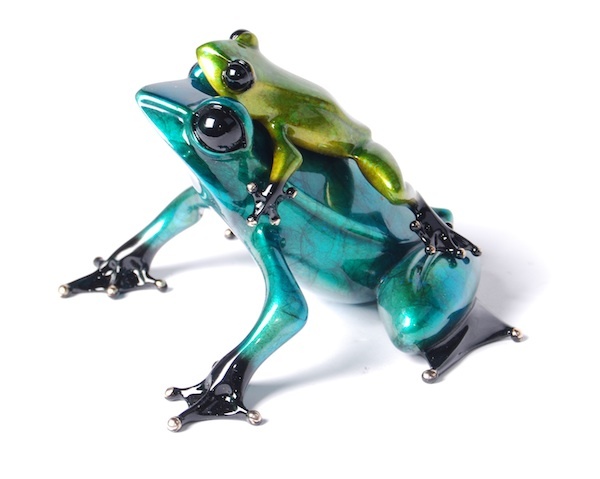 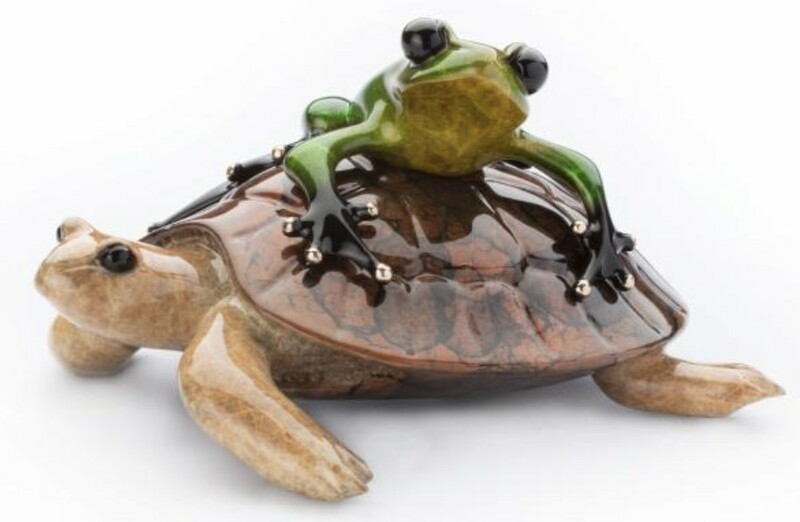 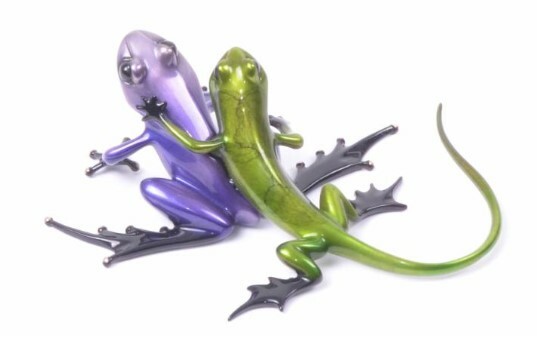 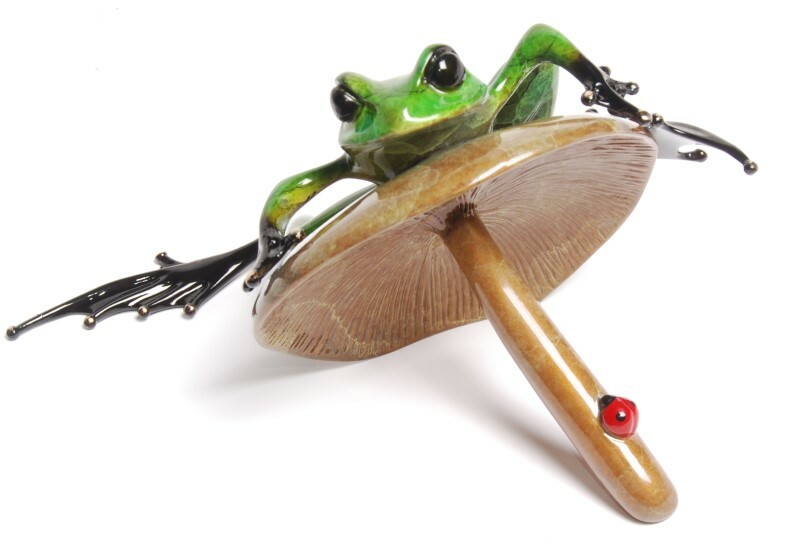 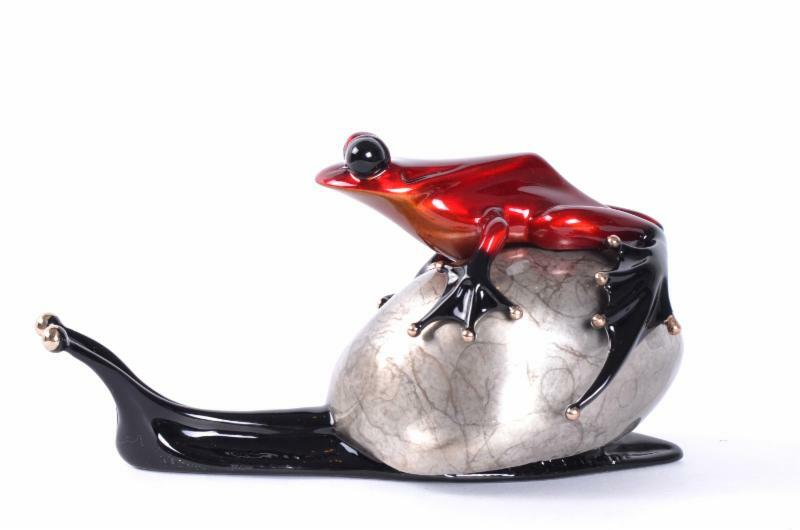 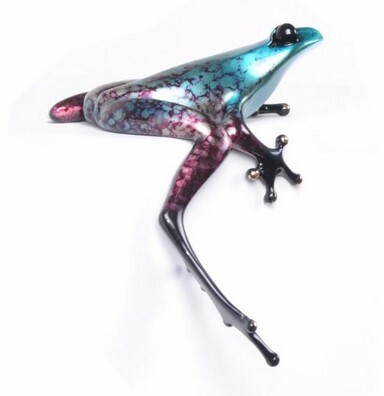 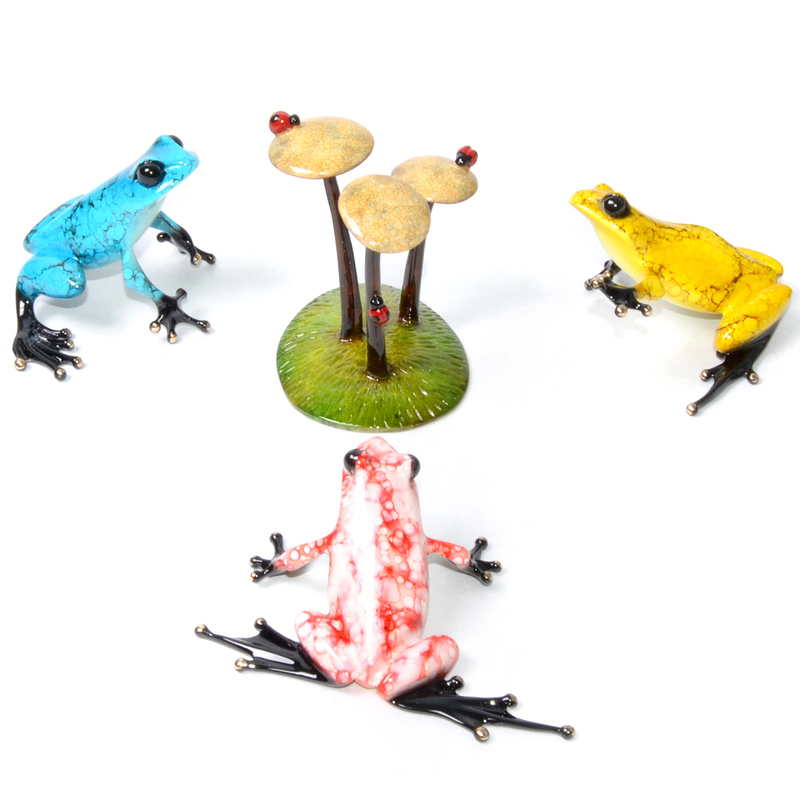 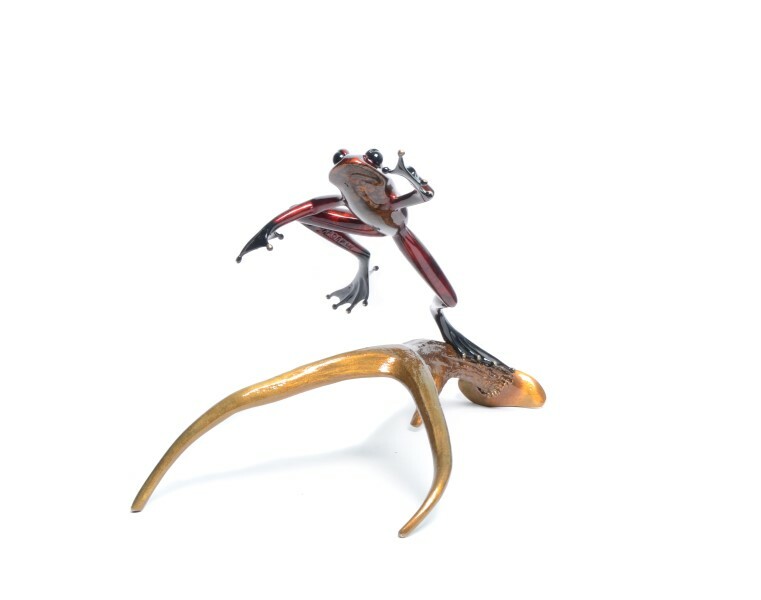 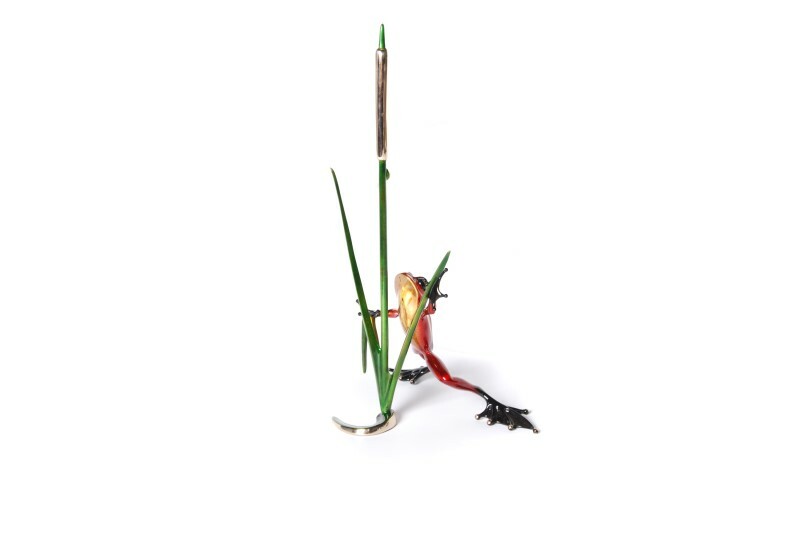 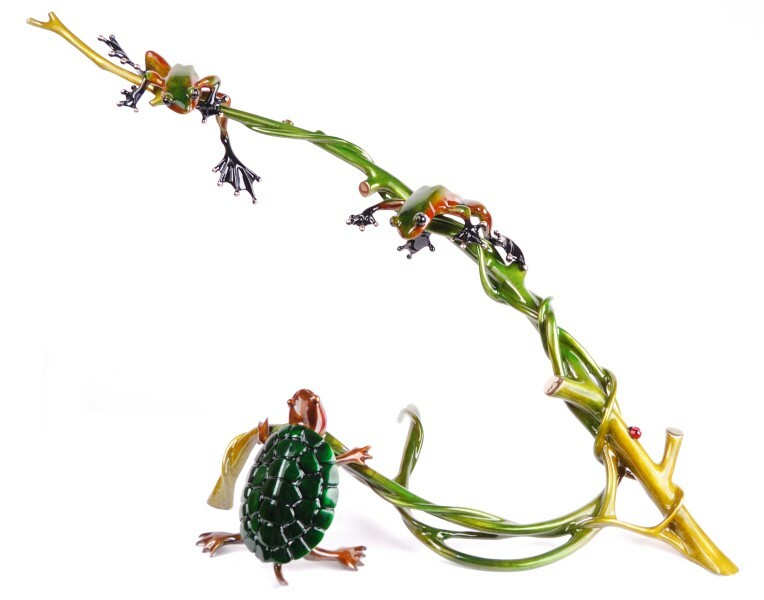 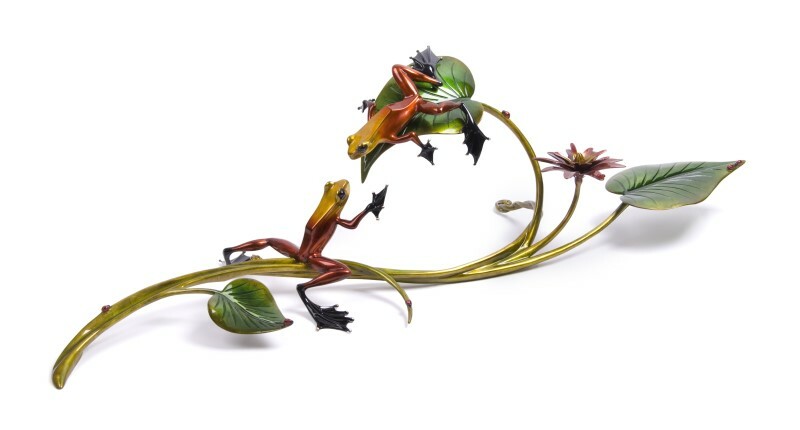 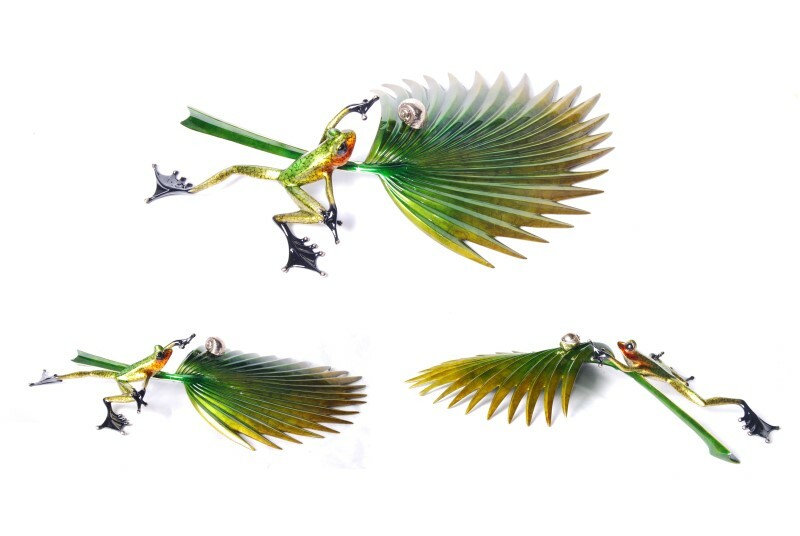 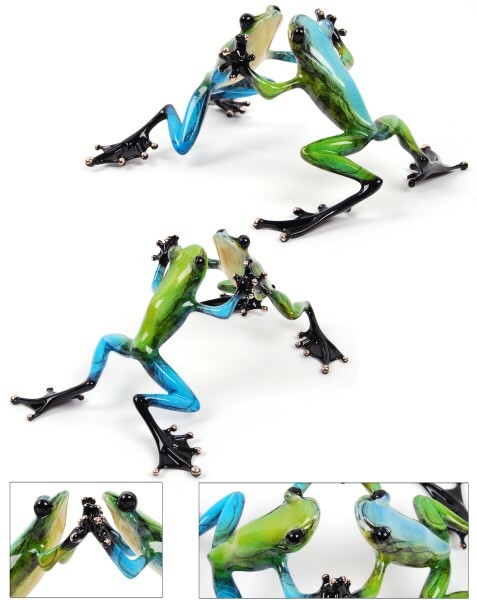 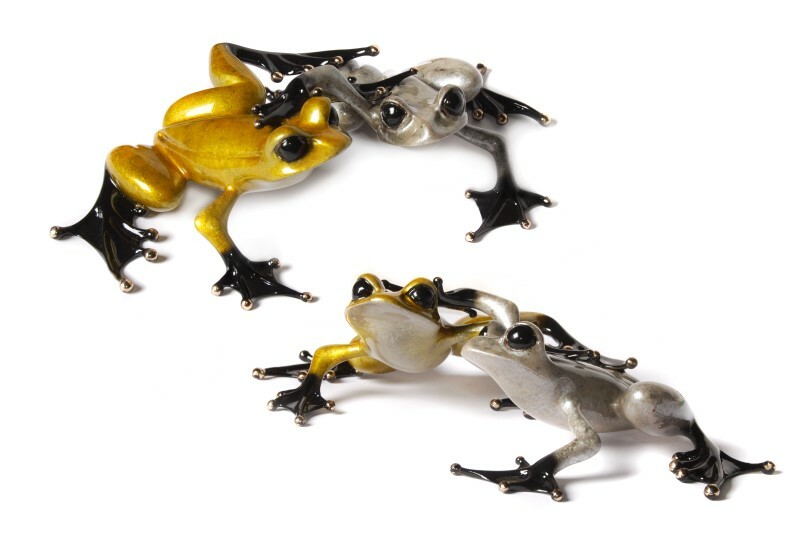 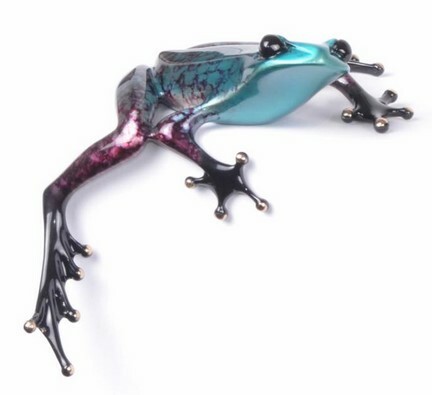 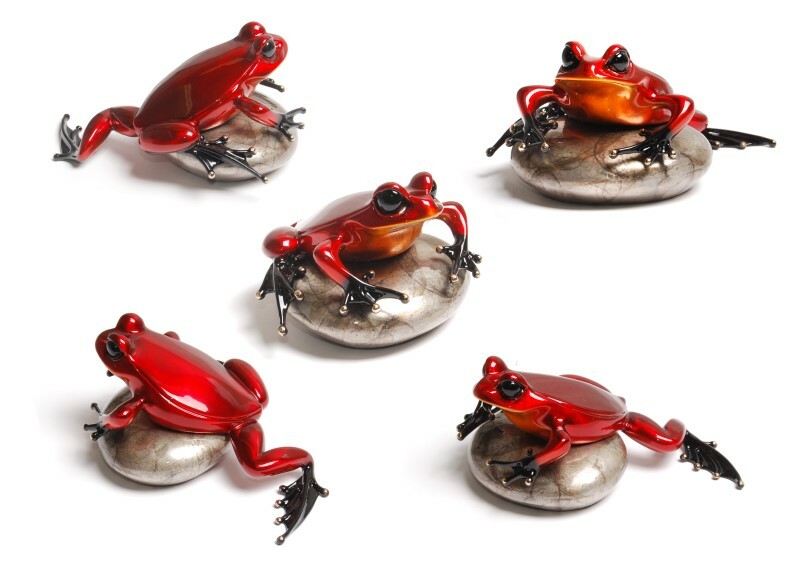 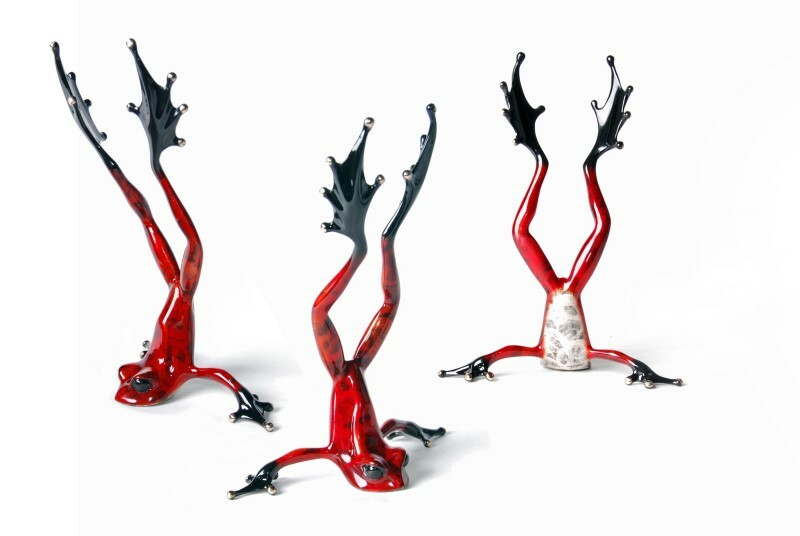 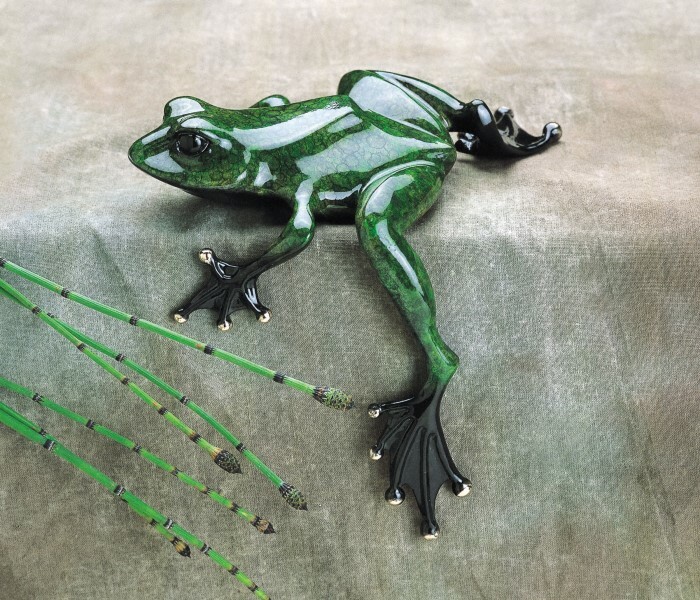 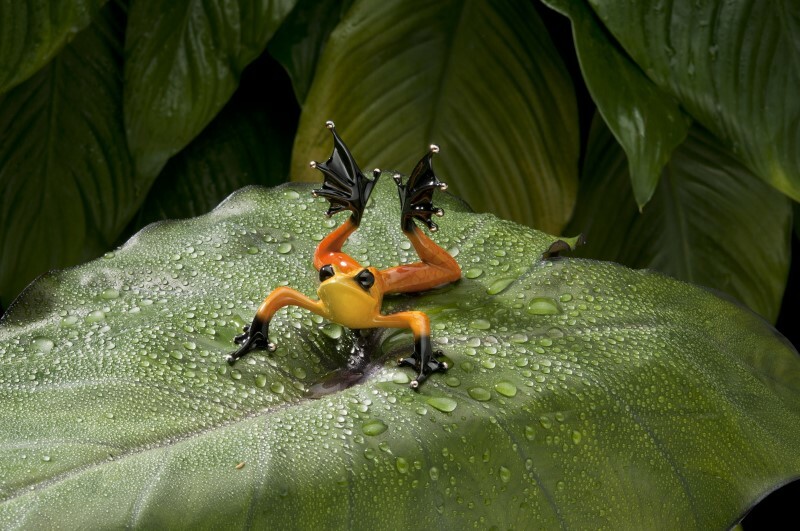 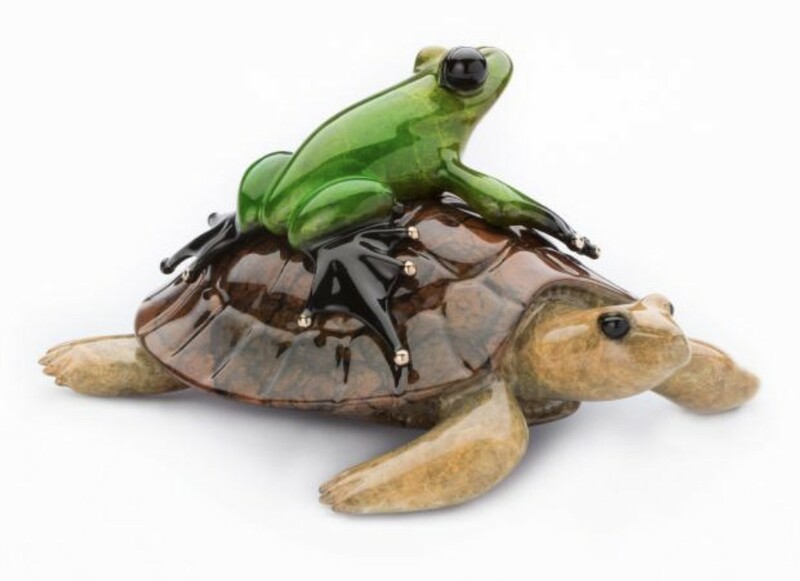 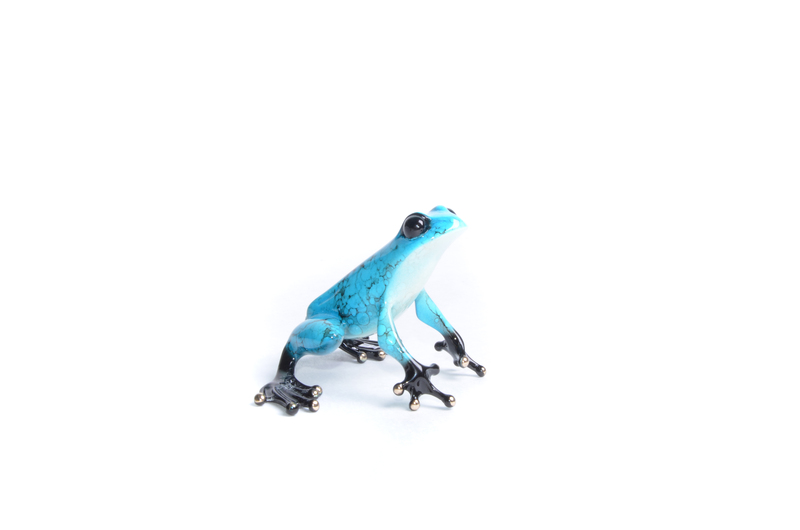 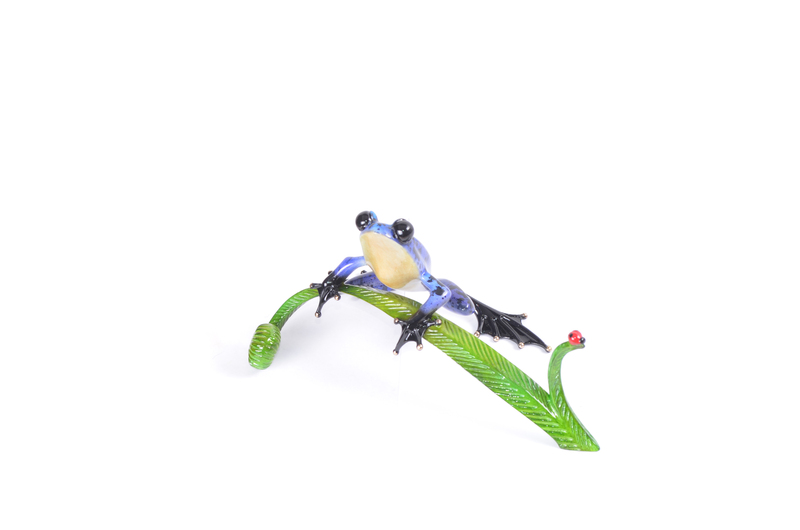 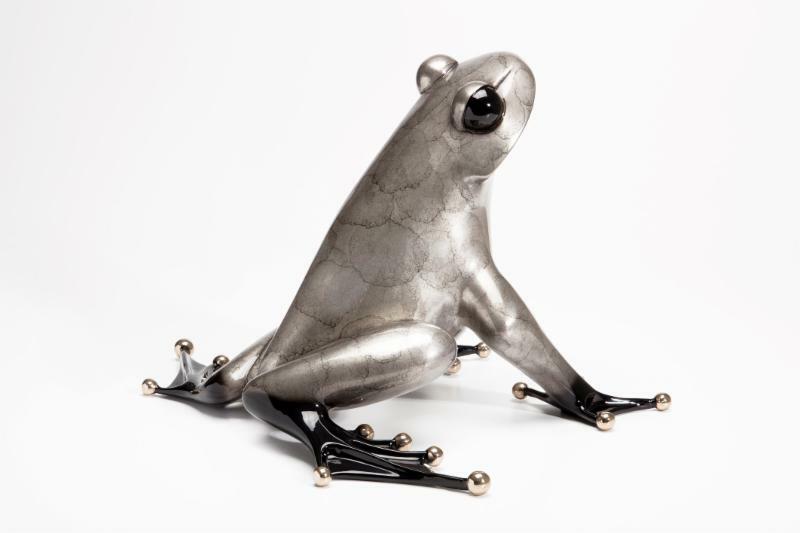 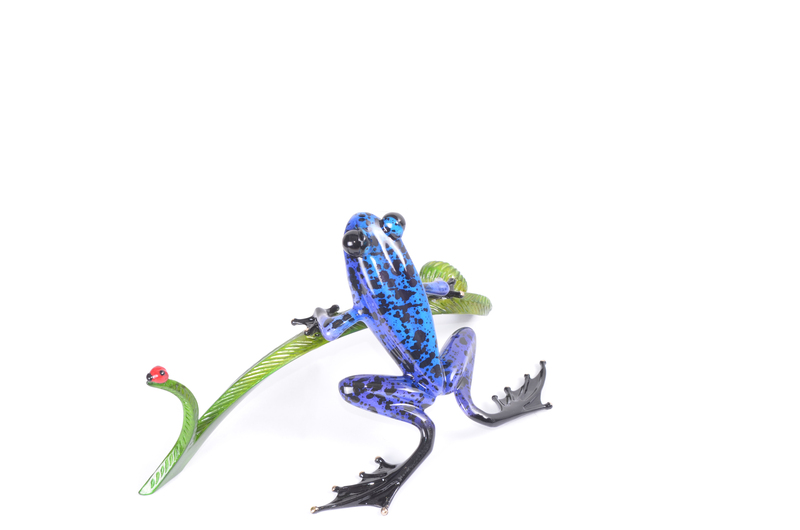 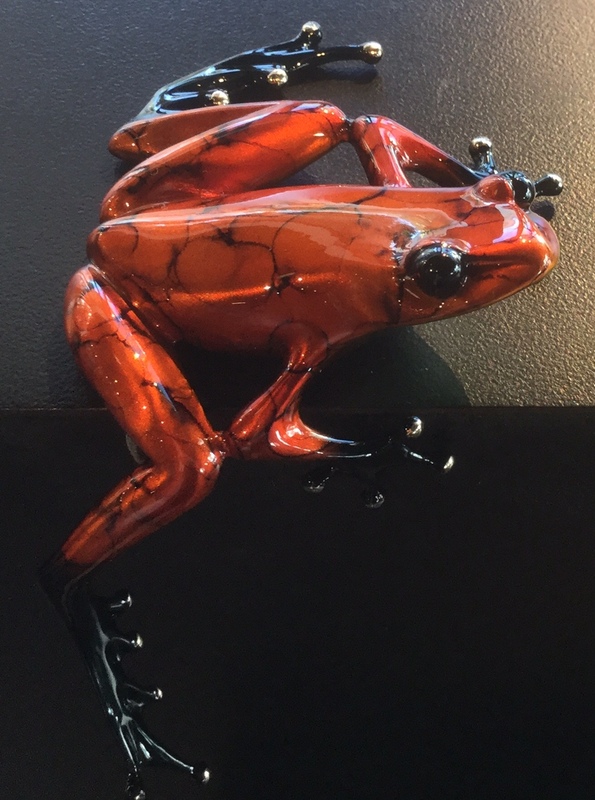 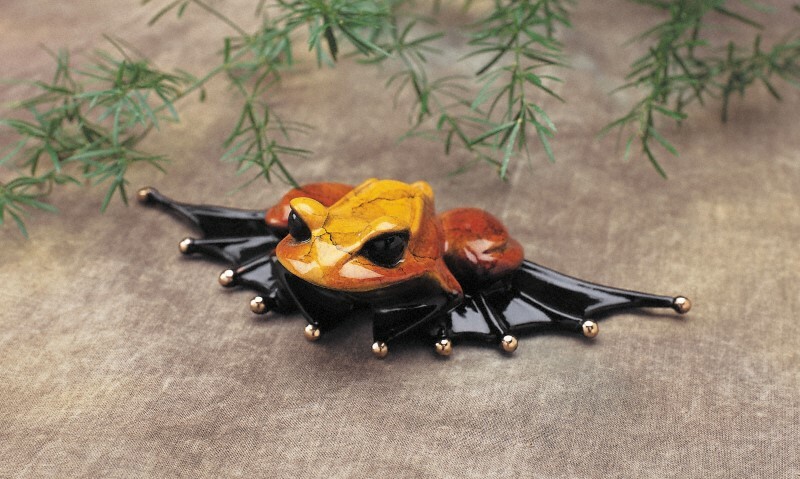 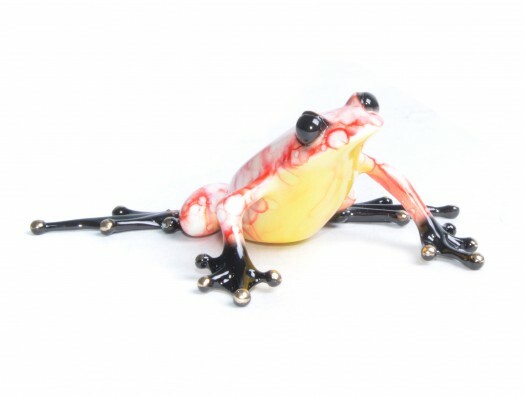 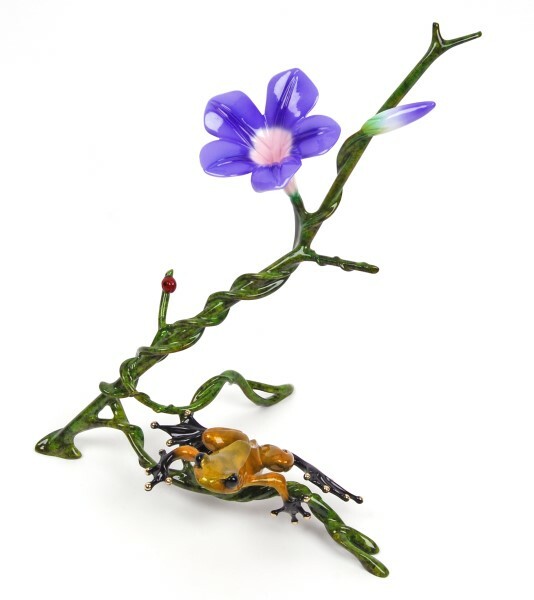 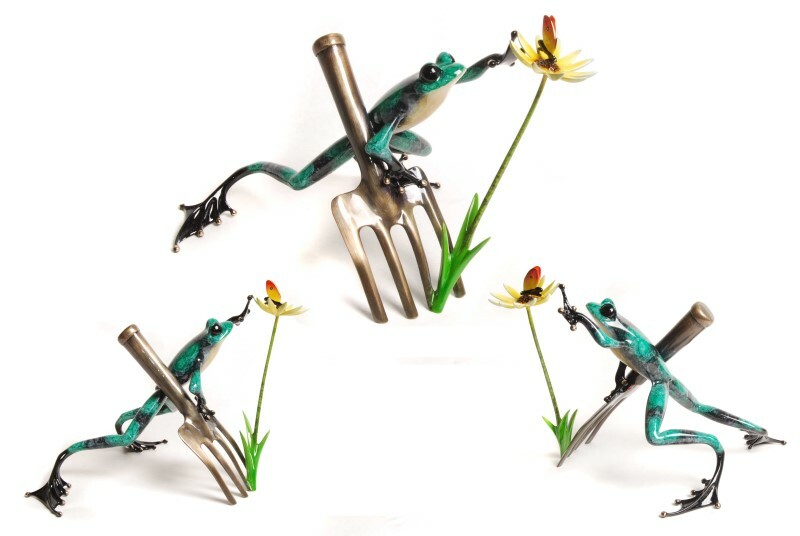 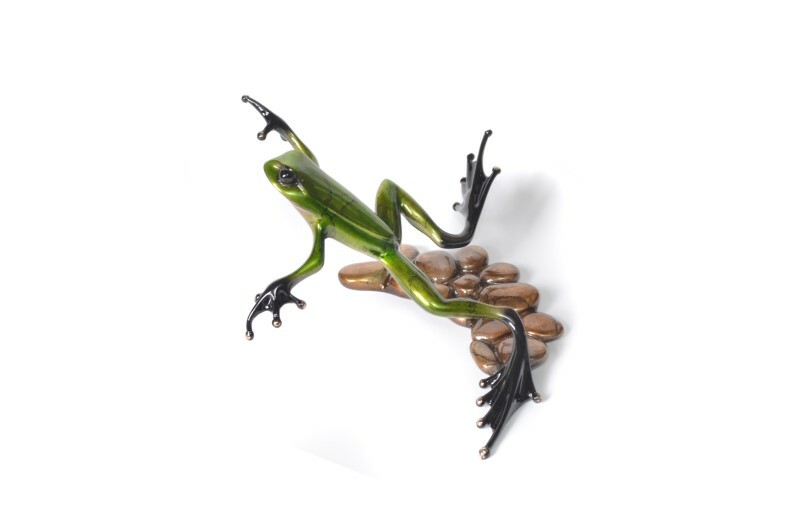 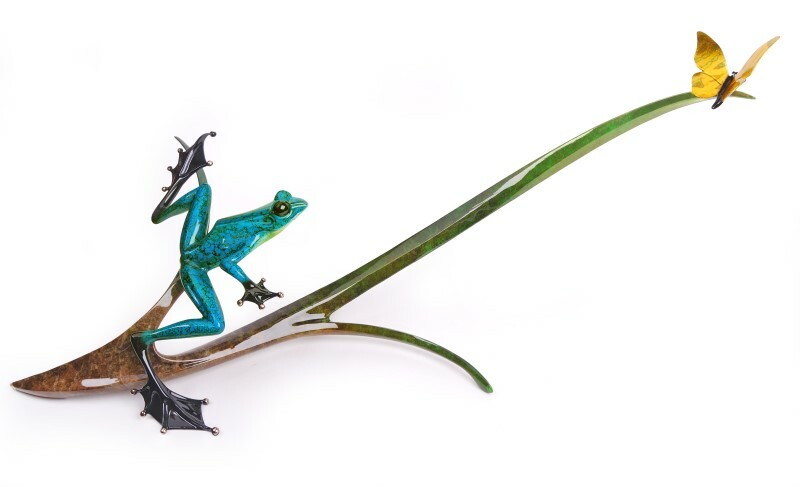 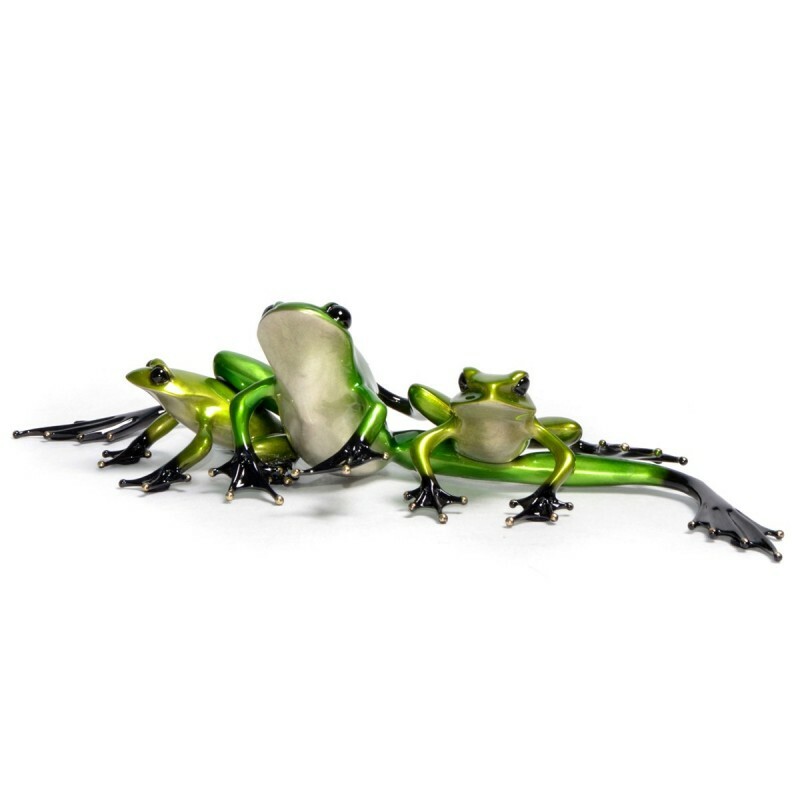 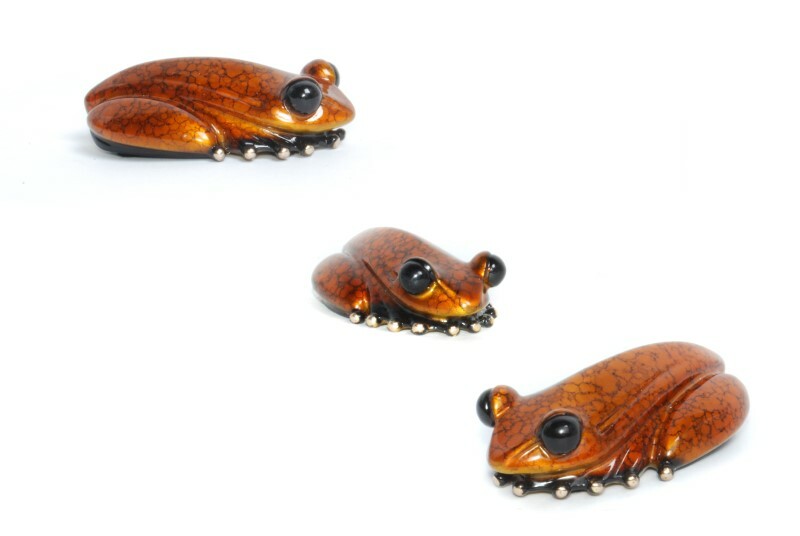 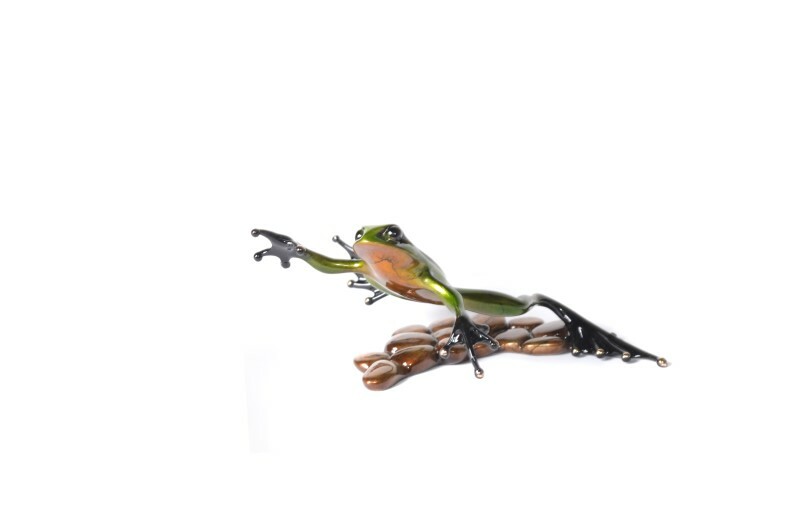 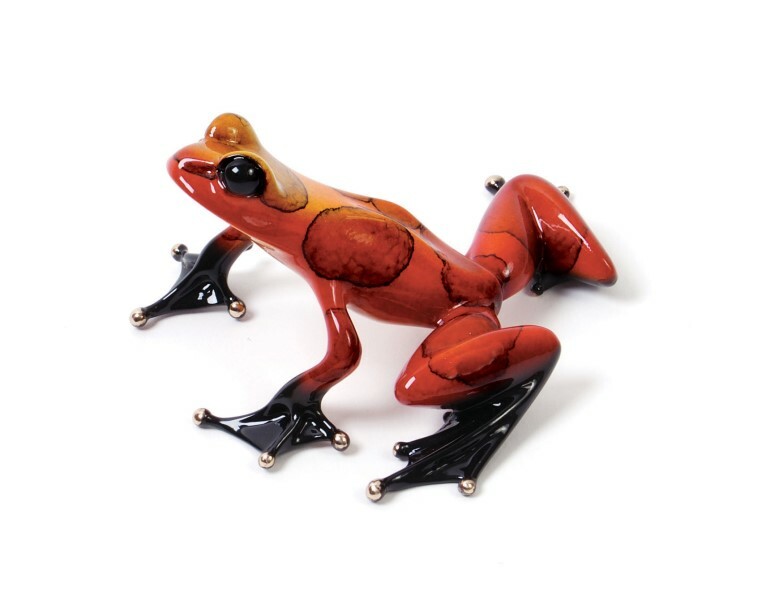 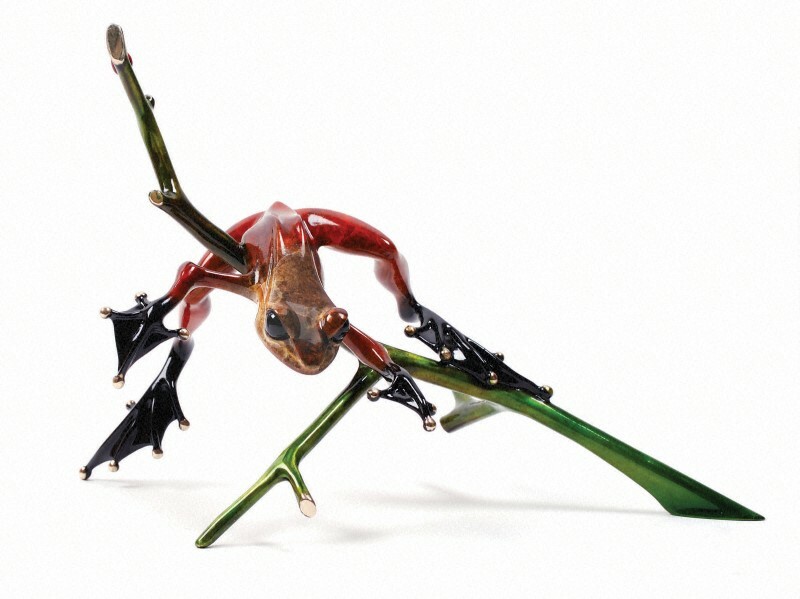 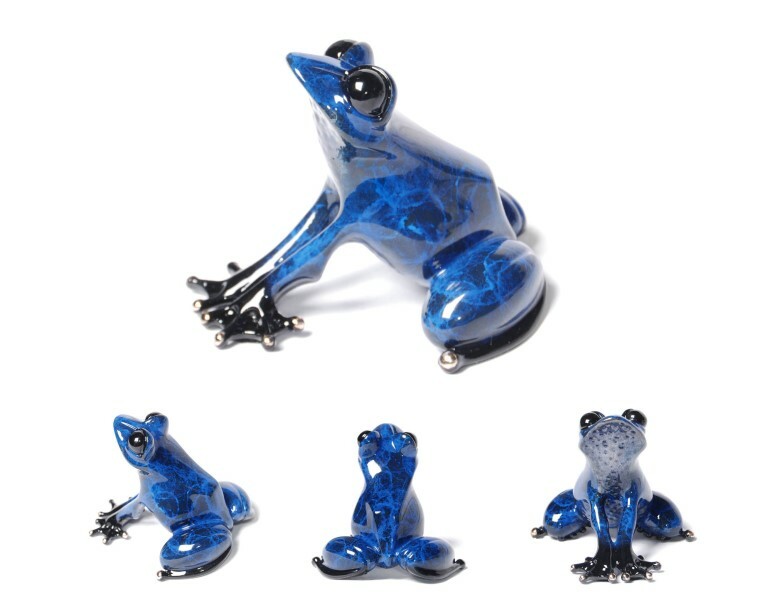 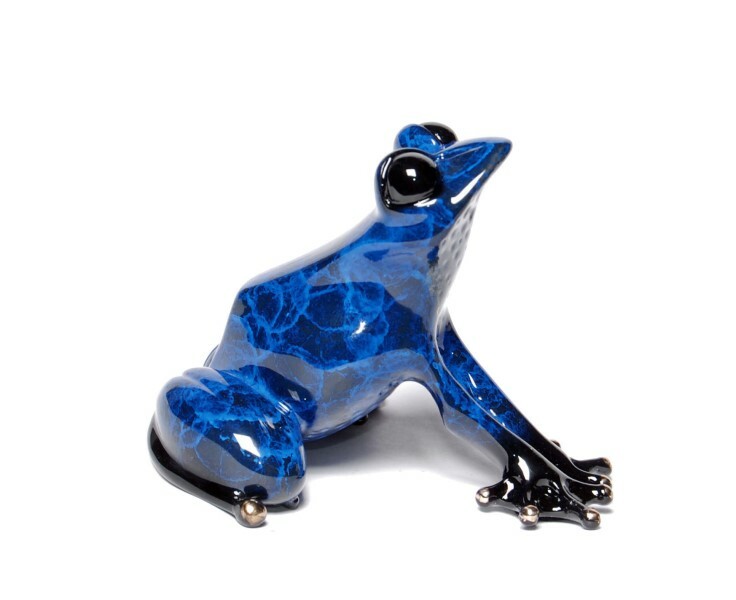 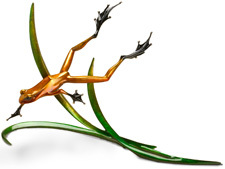 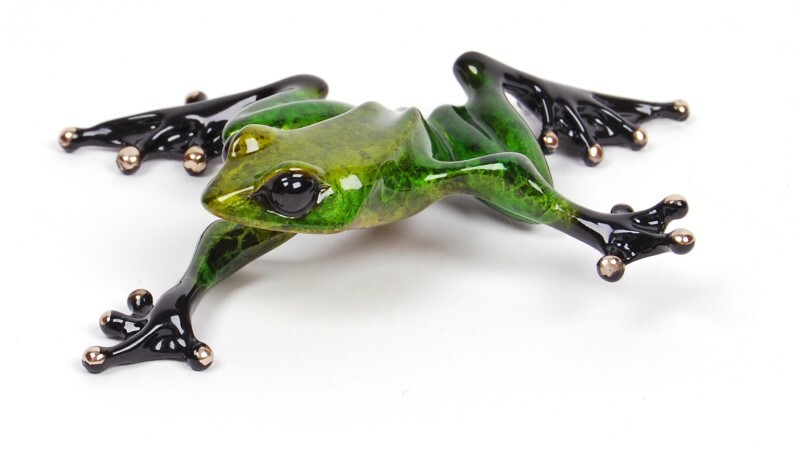 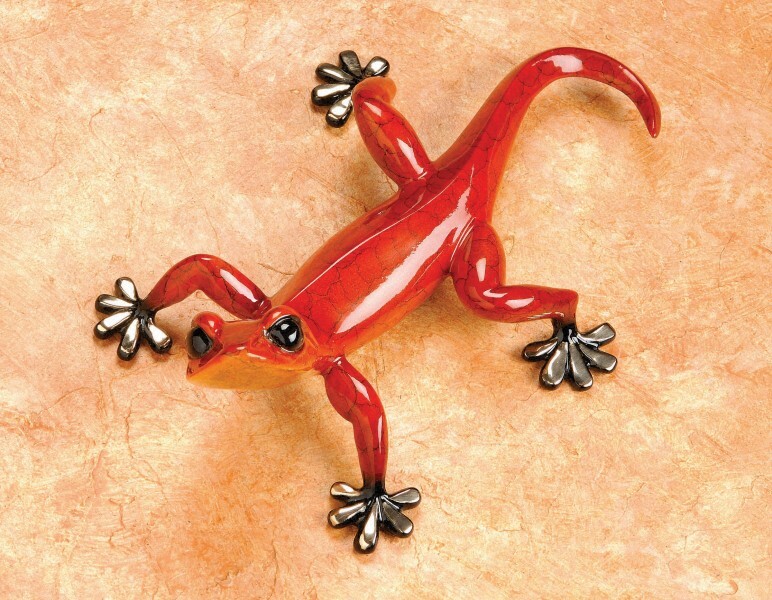 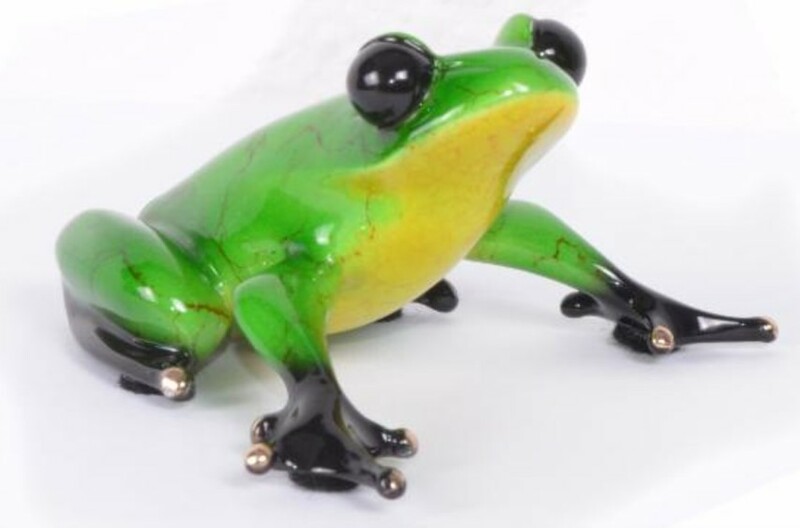 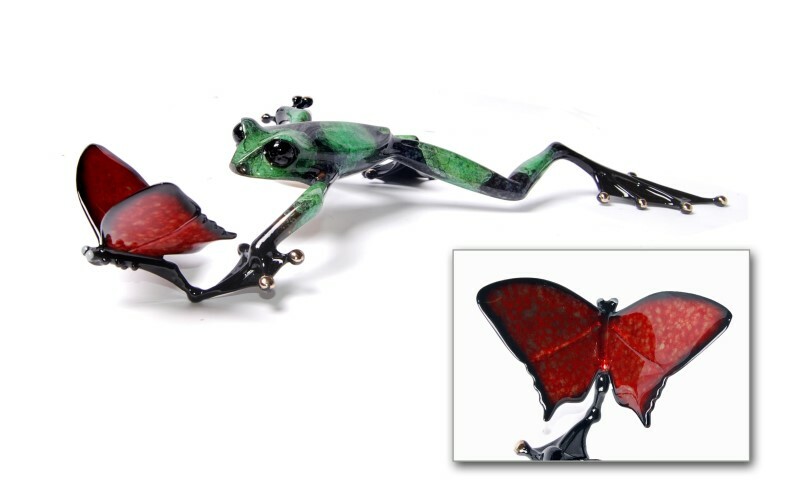 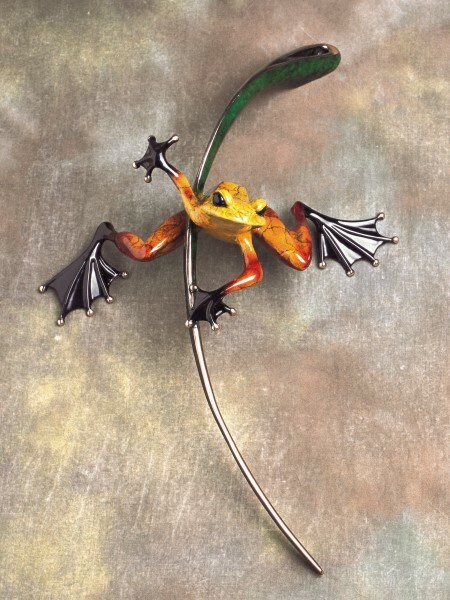 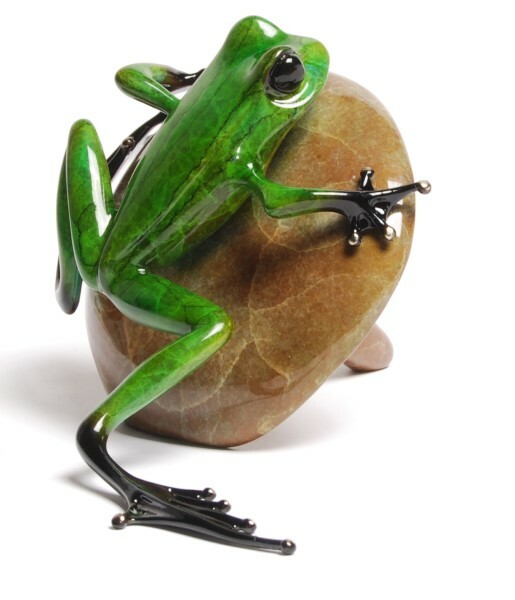 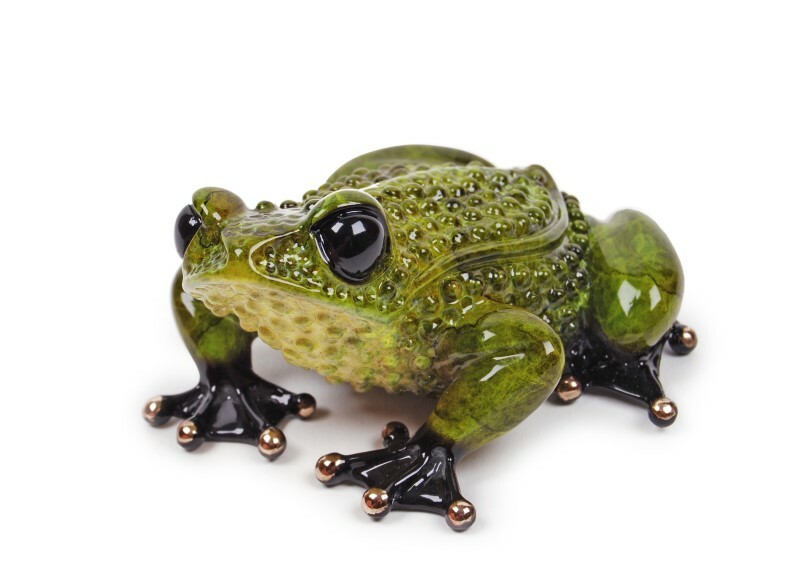 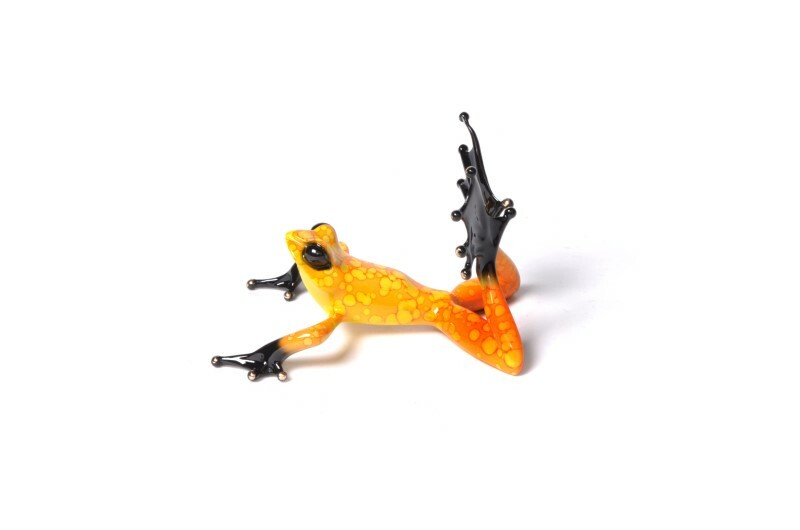 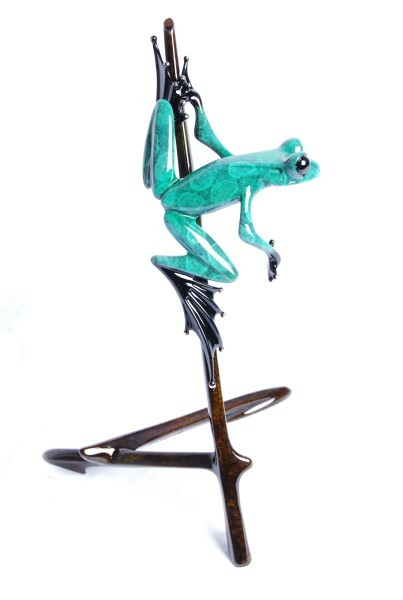 Here, he devotes himself to the creation of his unique bronze frog sculptures. 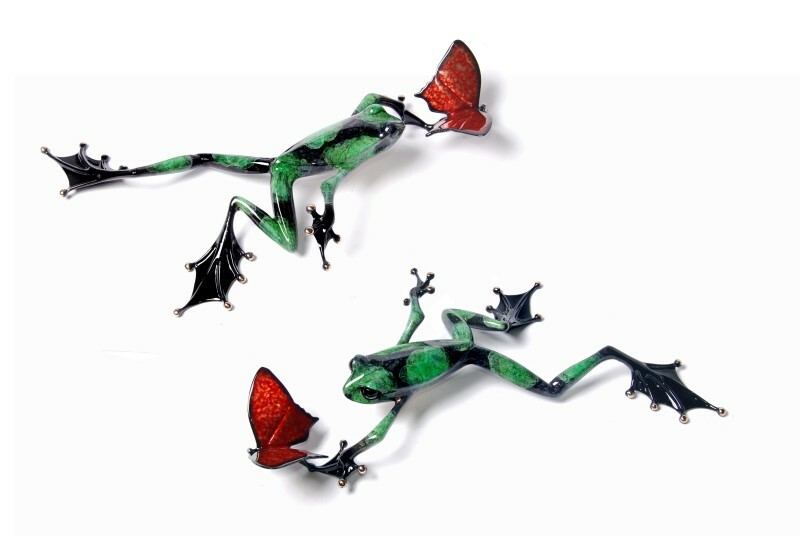 His work is known worldwide in galleries and private collections.